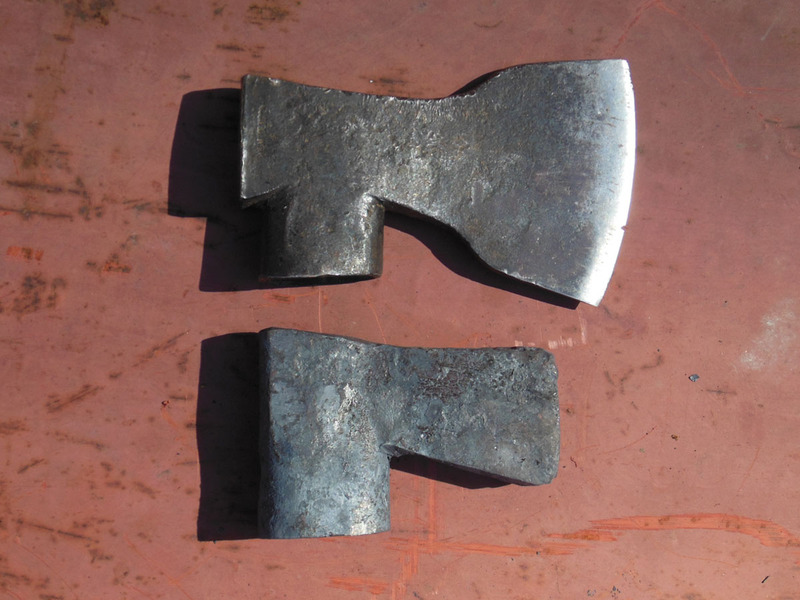 In 2016 I traveled to 3 places to teach or demonstrate traditional axe forging. 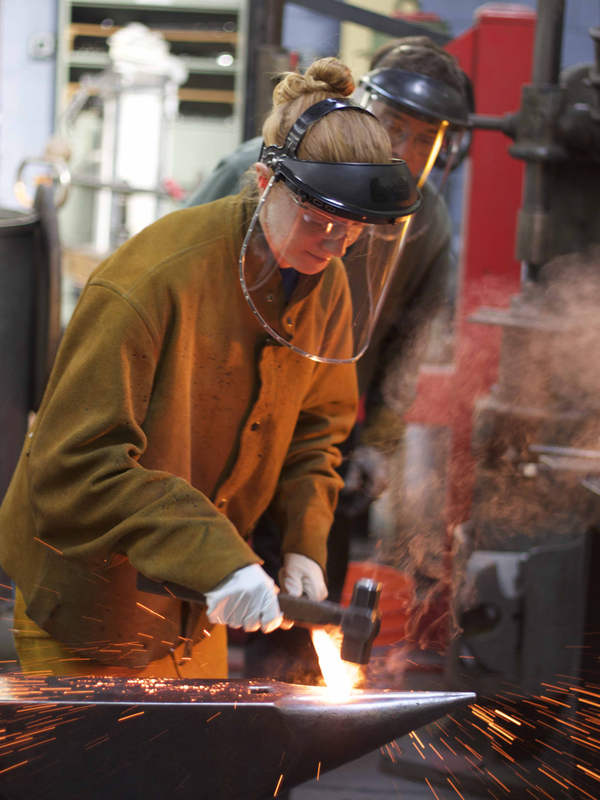 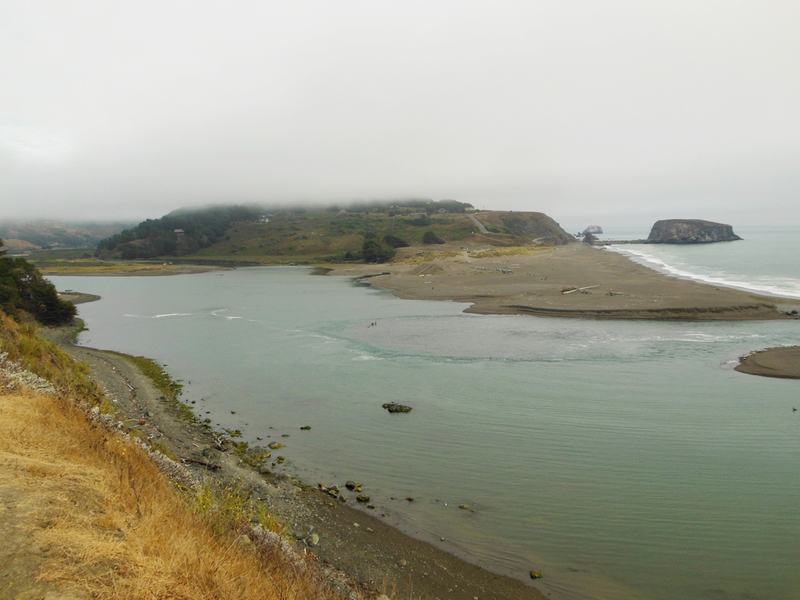 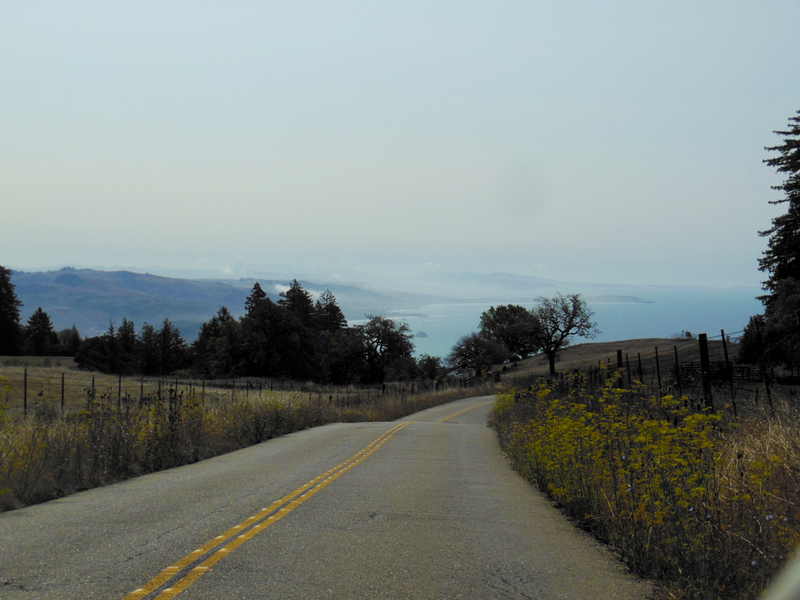 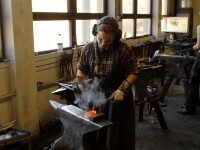 They were: Ferndale, California (Spring Conference / California Blacksmith Association), Peters Valley, New Jersey (the PV school of crafts) and Salt Lake City, Utah (ABANA Conference). 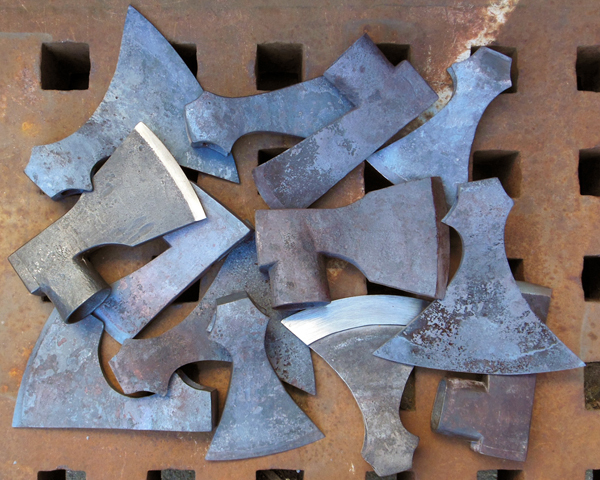 In each case I brushed up on my skills in the weeks leading up to the event, and ended up with about 15 unfinished axes at the end of the year. Now, in 2017, I am starting to finish them all and they will be available for sale! 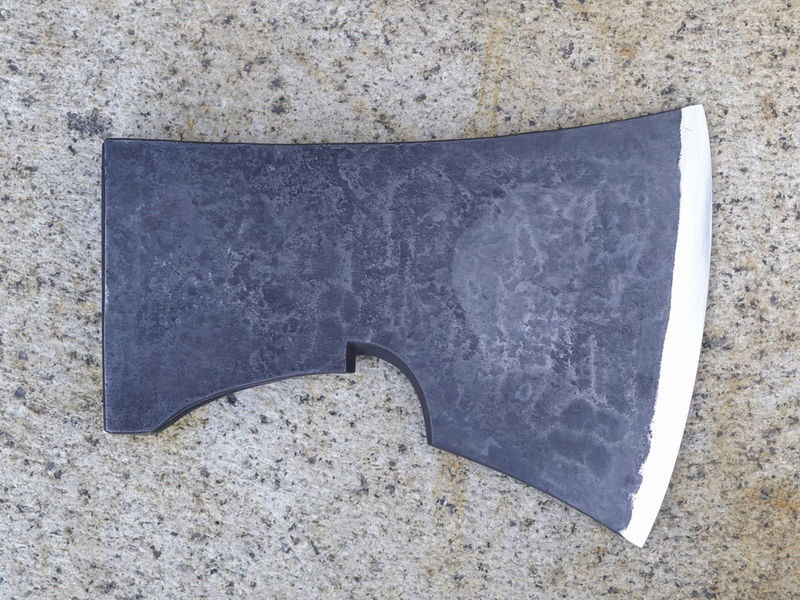 If you are interested in what you see here please PM me via Facebook or the message feature at Forgedaxes.com and I can quote you sizes and prices – and send you pictures of individual axes. The edge lengths on the pieces you see here range from 2.4″ (Swedish style felling axe) to 7.9″ (Viking style broad axe). 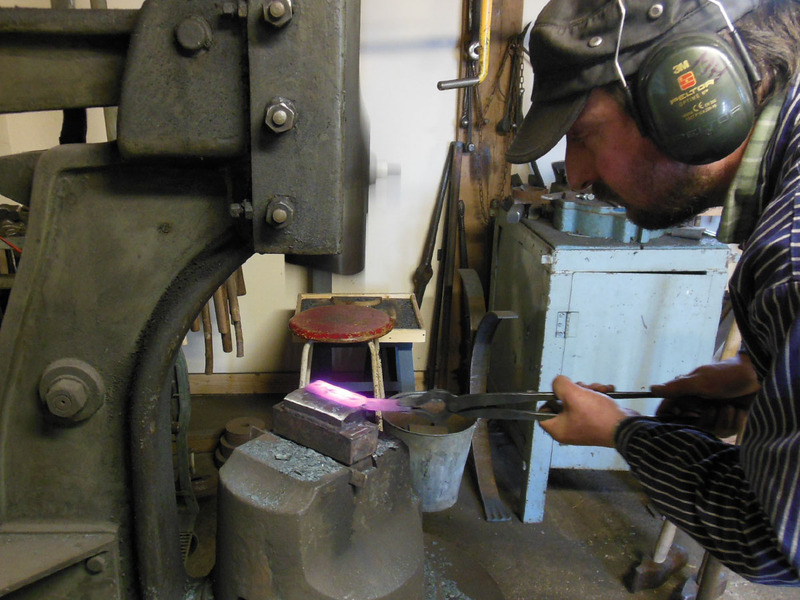 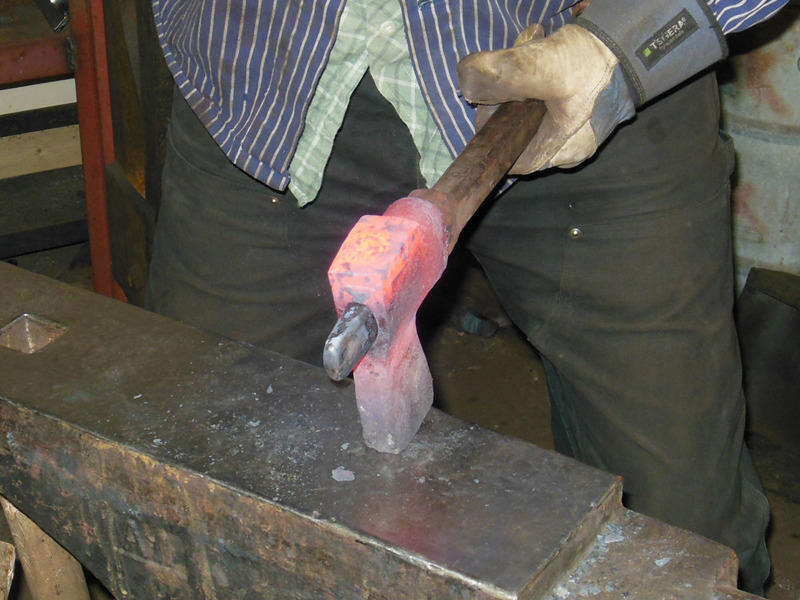 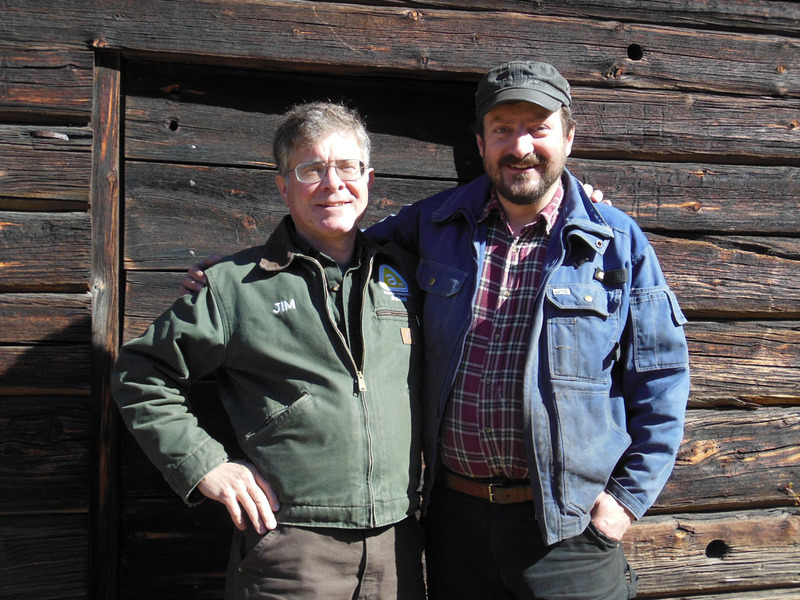 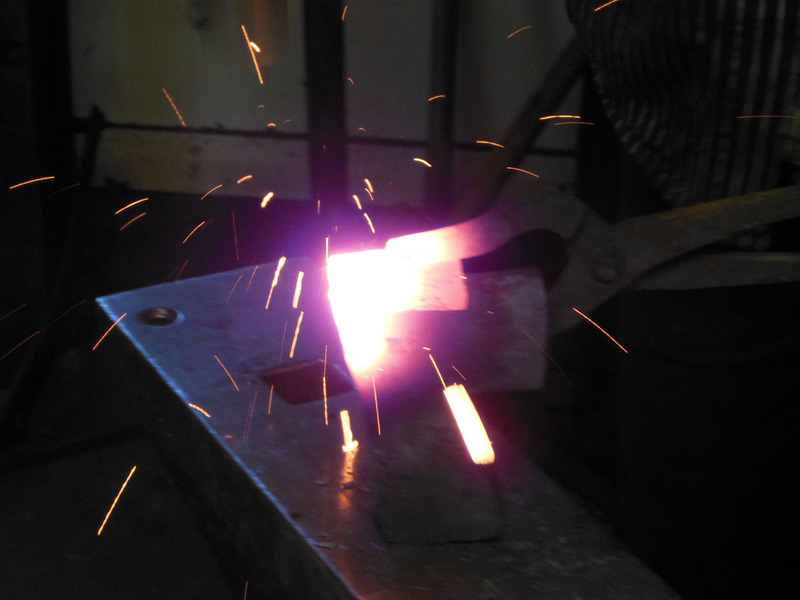 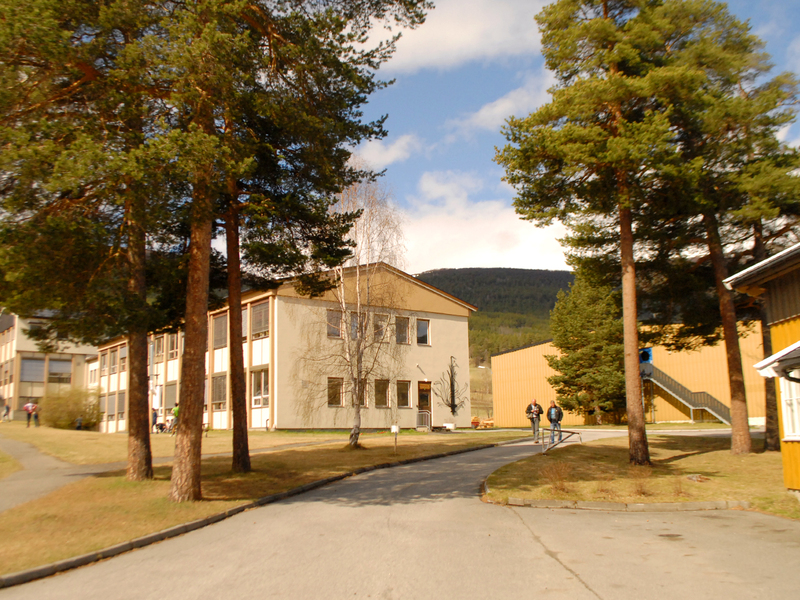 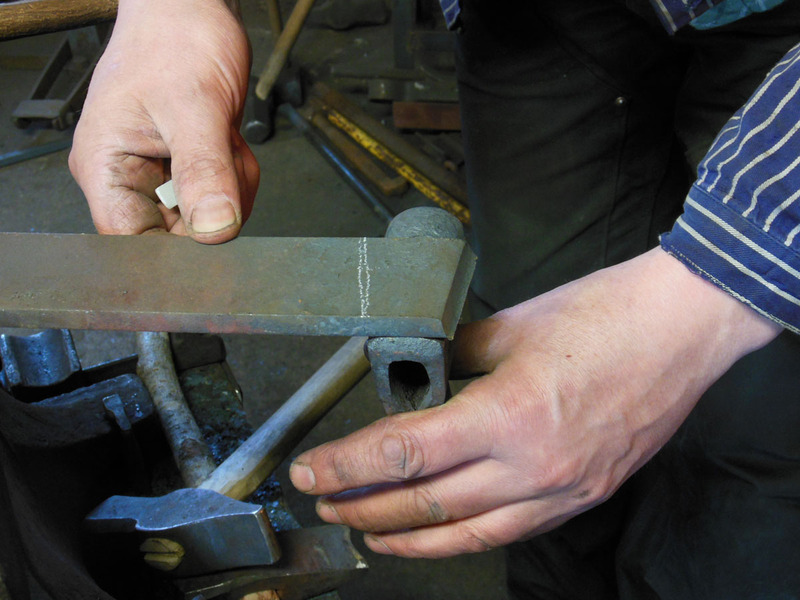 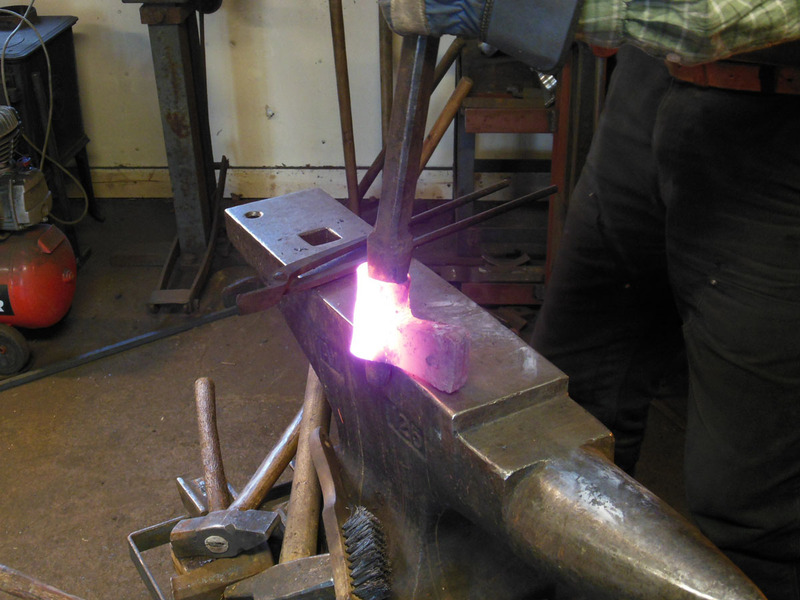 This year in May I got the opportunity to return to the Hjerleid Craft School in Dovre, Norway to teach a one week class on forging hammers in the Viking tradition. 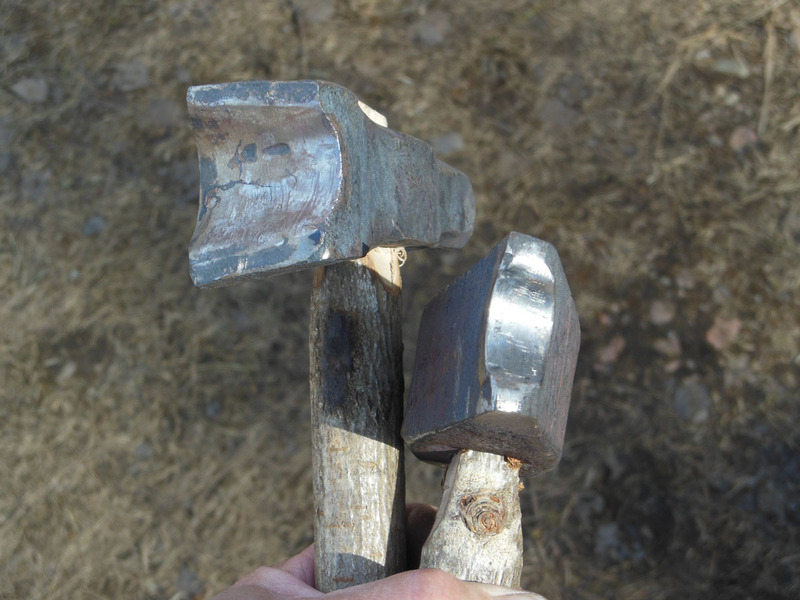 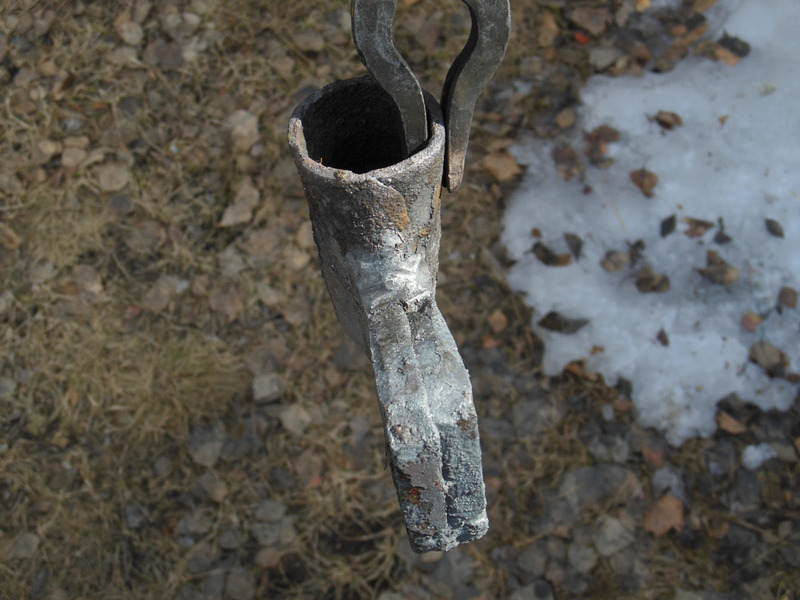 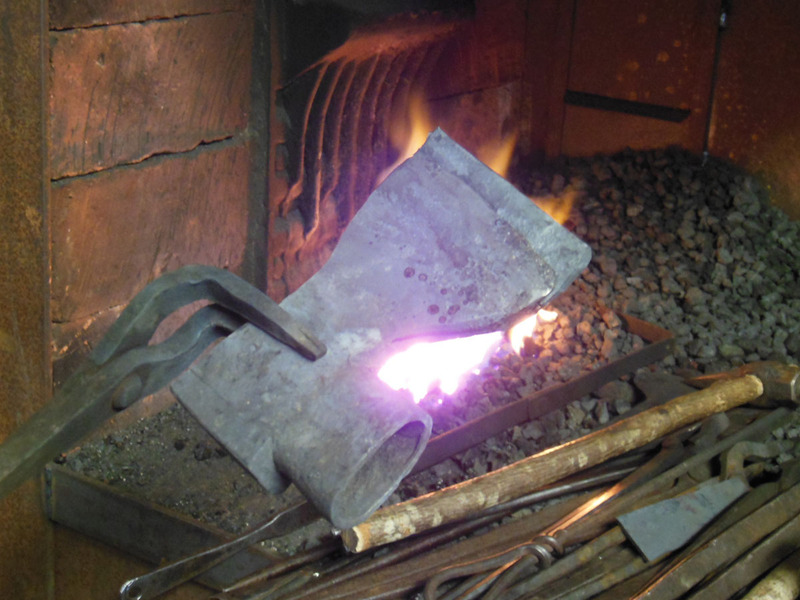 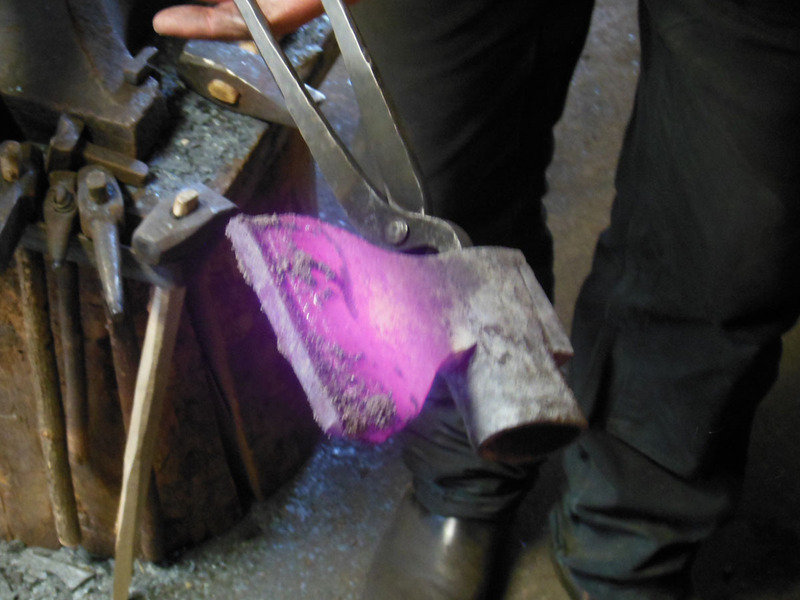 The year before I had taught Viking era axe forging – also at Hjerleid. 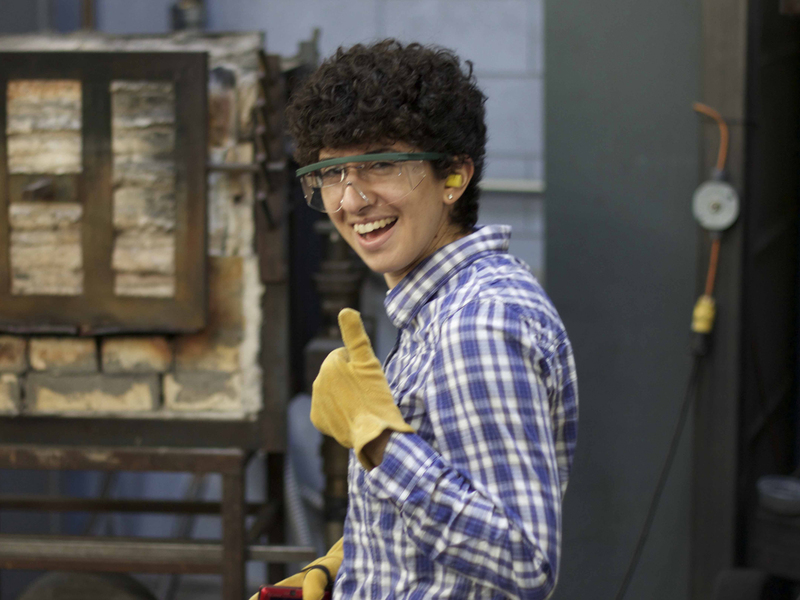 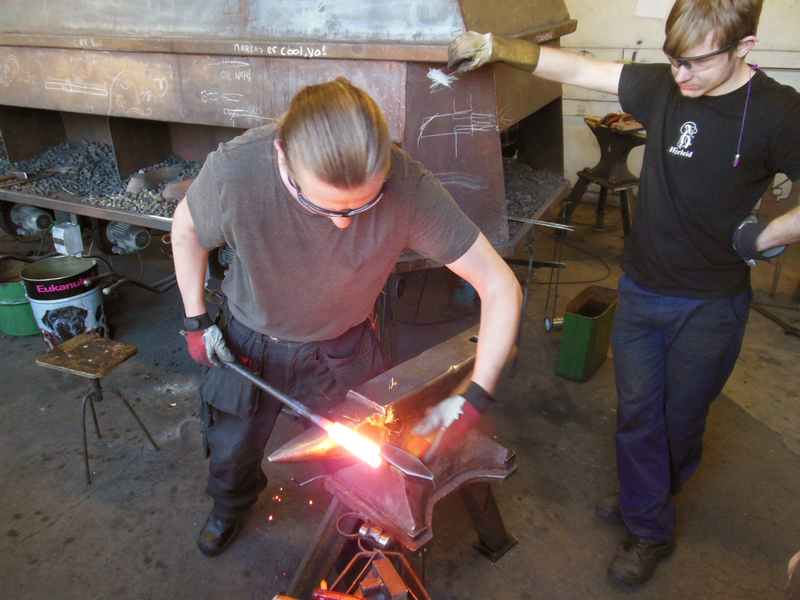 Benjamin Kjellman-Chabin, the regular instructor of these students during their one-year blacksmithing course, was gracious enough to open this possibility to me once again, and the director of the school, Helle Hundevat, was generous enough give it her blessing. 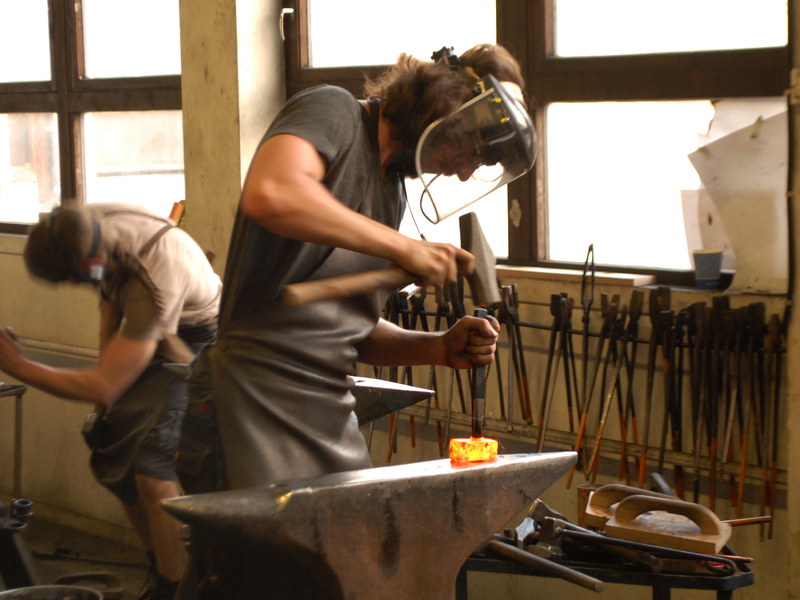 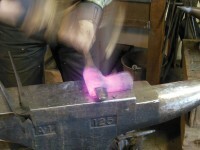 The students were a fine, enthusiastic lot and all succeeded in forging hammers by a historical and fascinating set of techniques. 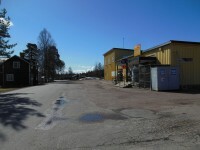 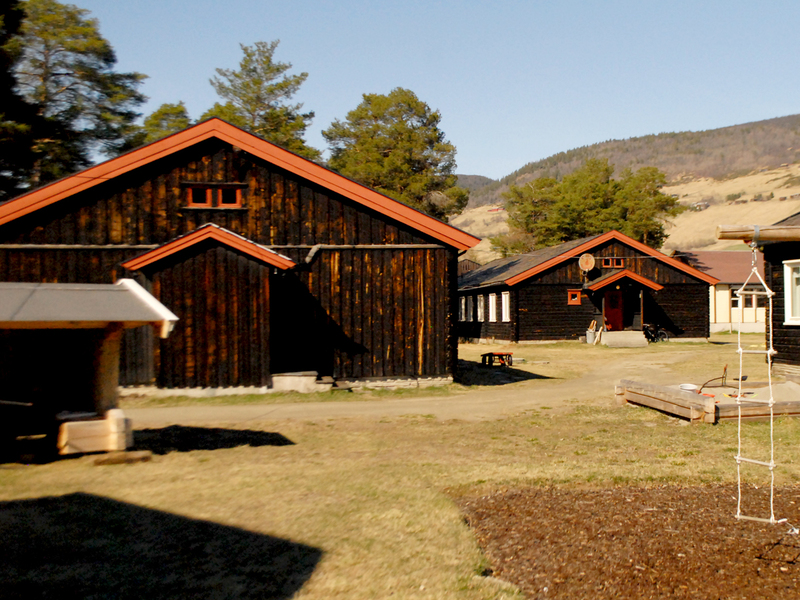 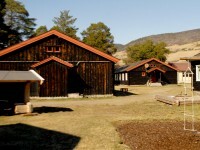 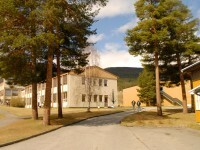 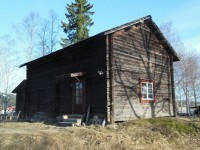 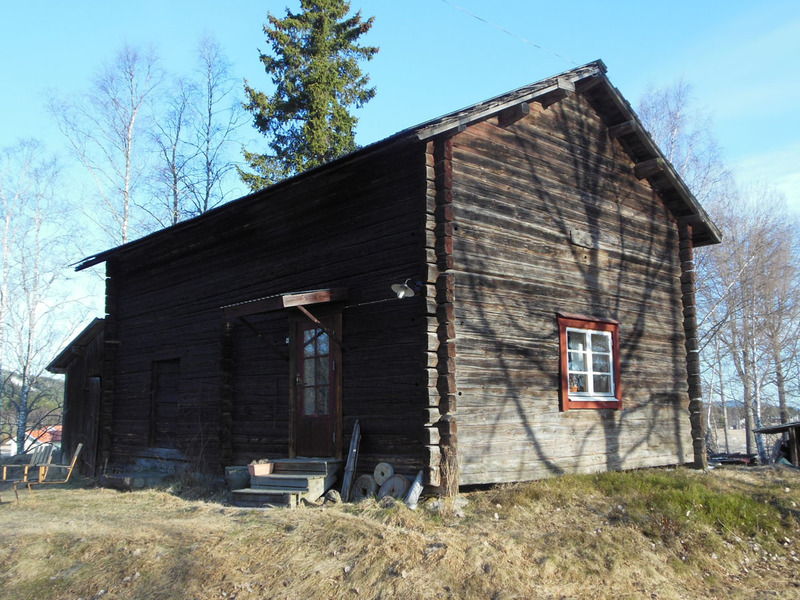 The blacksmithing, wood carving and joinery shops of Hjerleid. 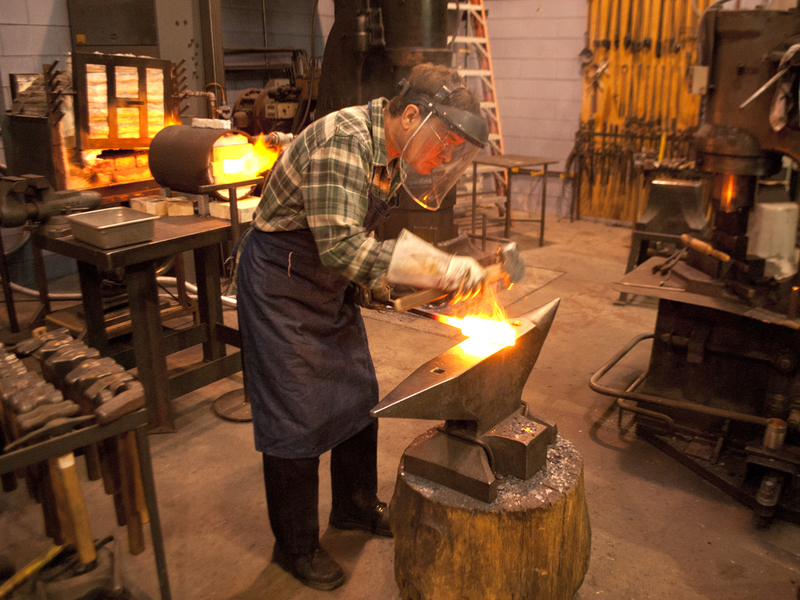 The students will forge this size and style of hammer. 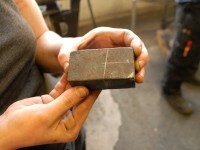 It is inspired by beautiful pieces from the Viking age. Firing up the coke forge to get started. 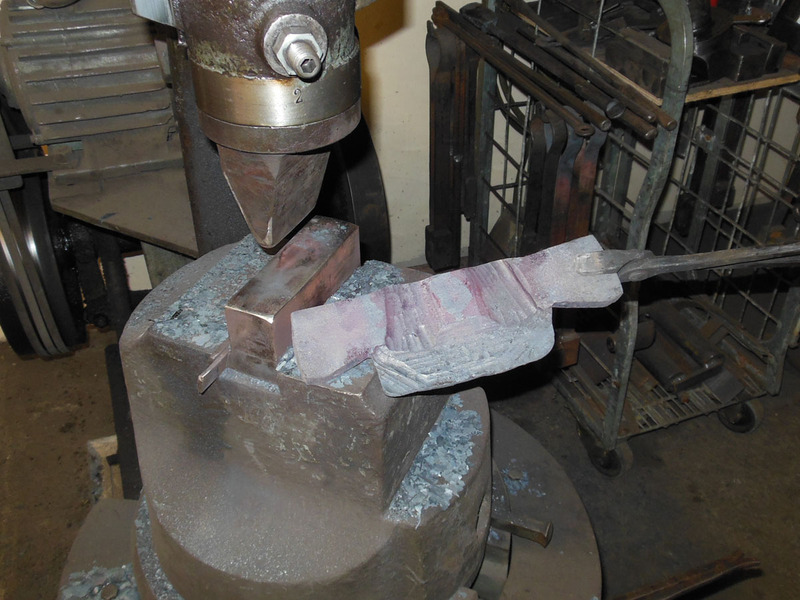 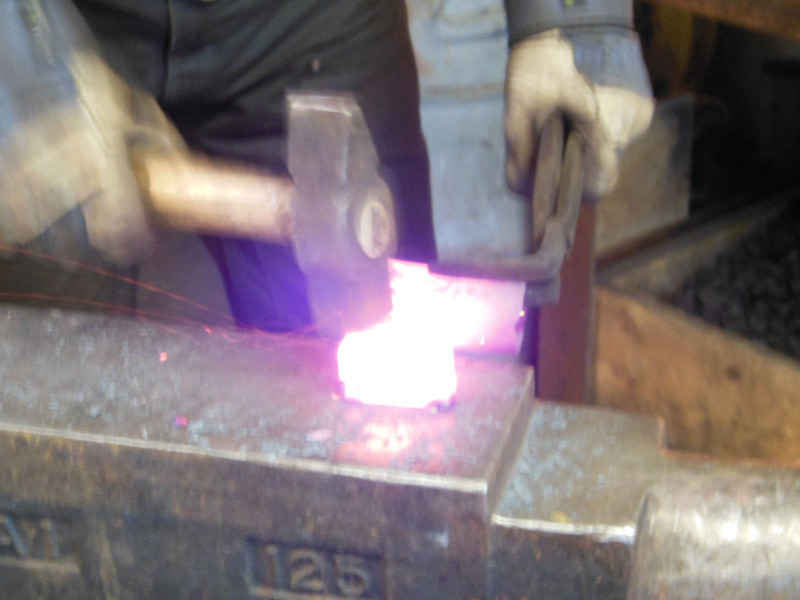 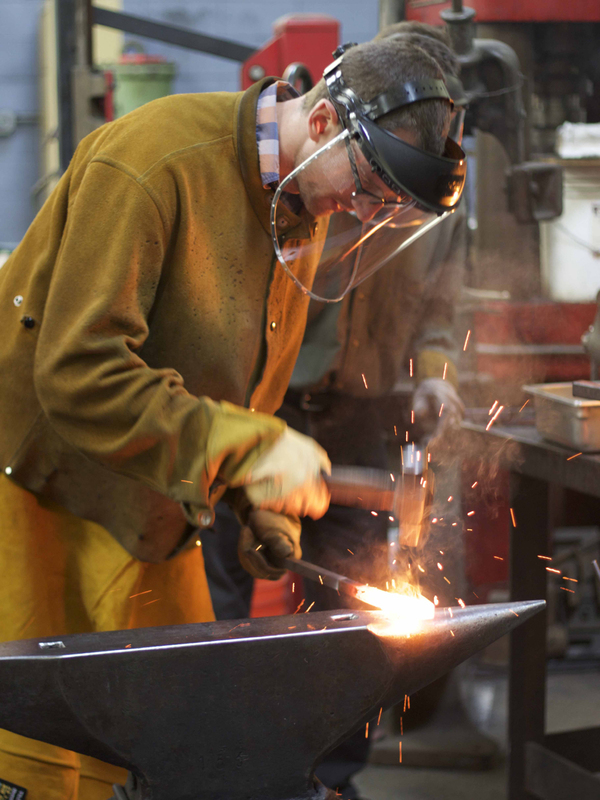 Forge welding a high carbon steel face to a mild steel body – the first step of making a forge welded hammer. 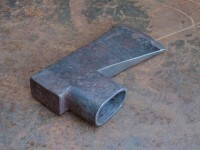 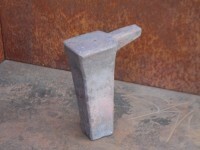 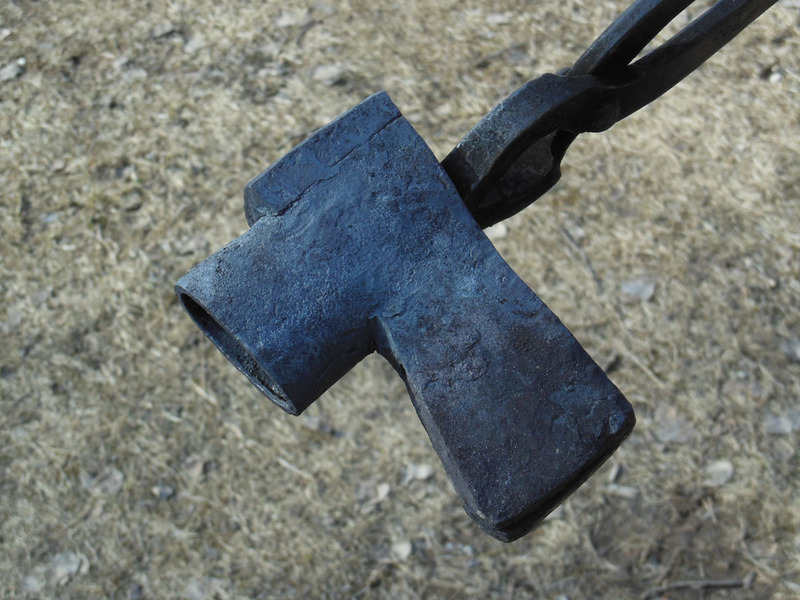 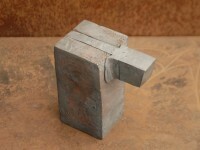 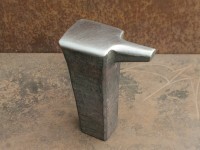 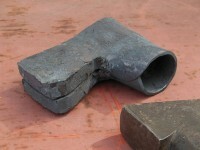 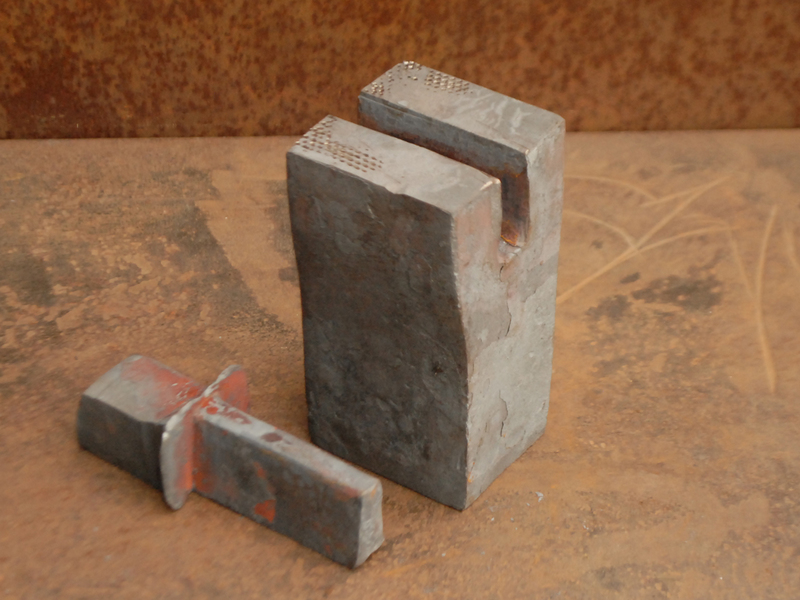 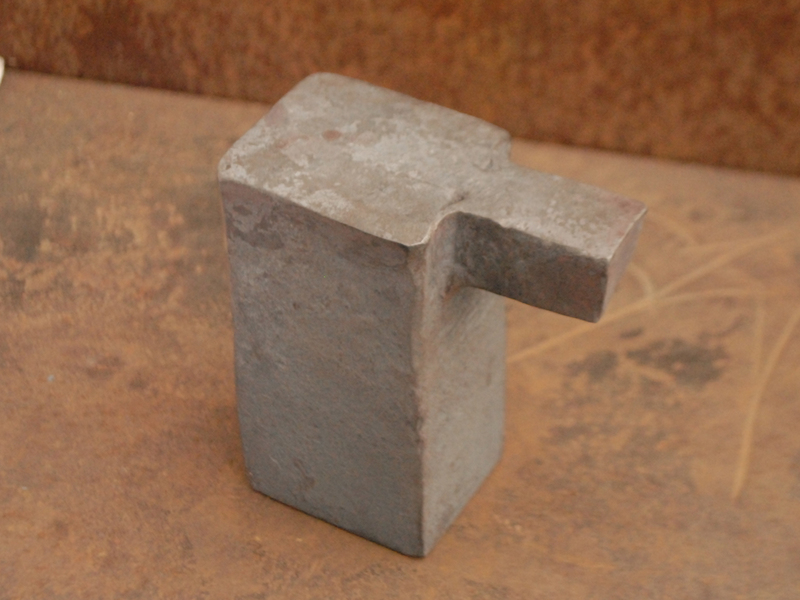 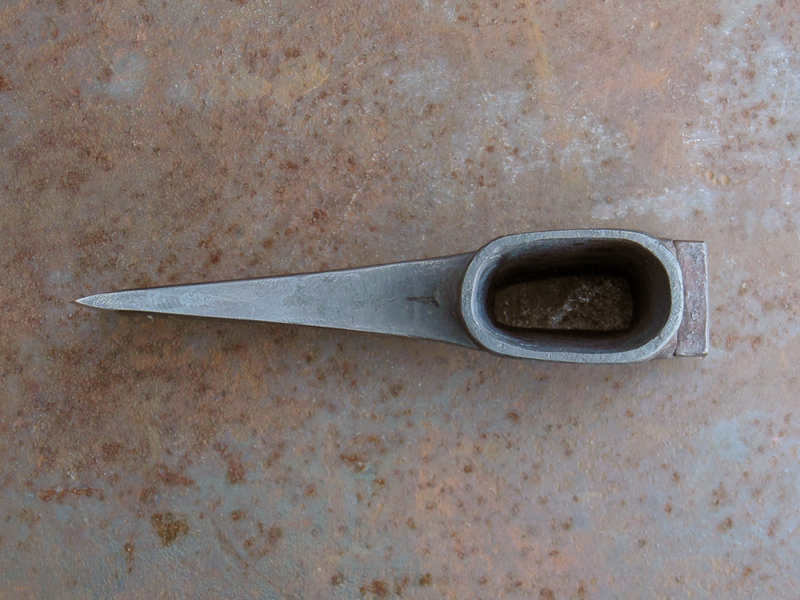 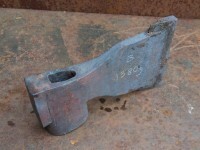 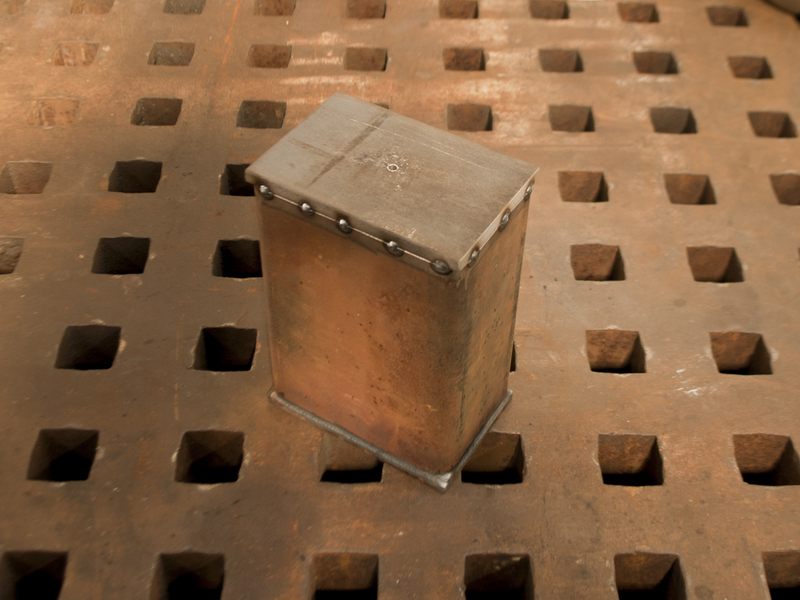 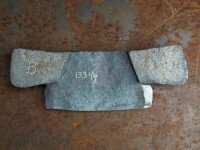 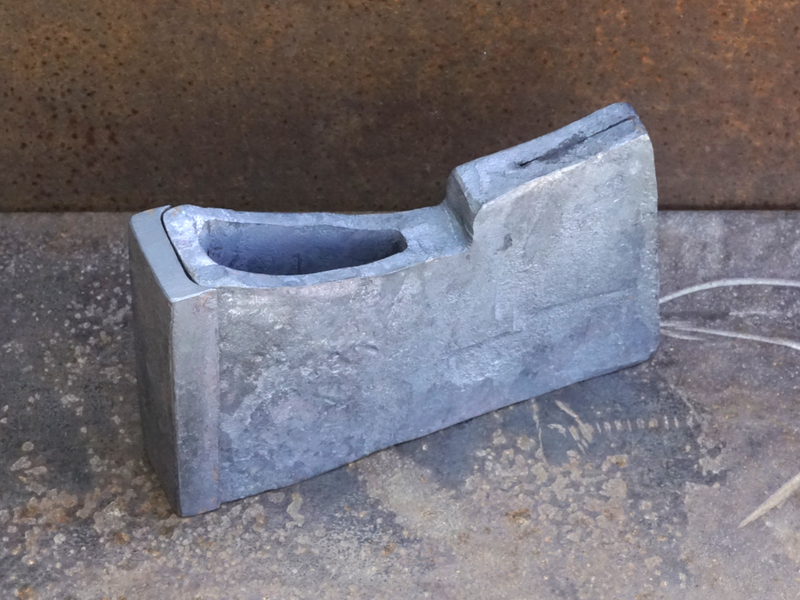 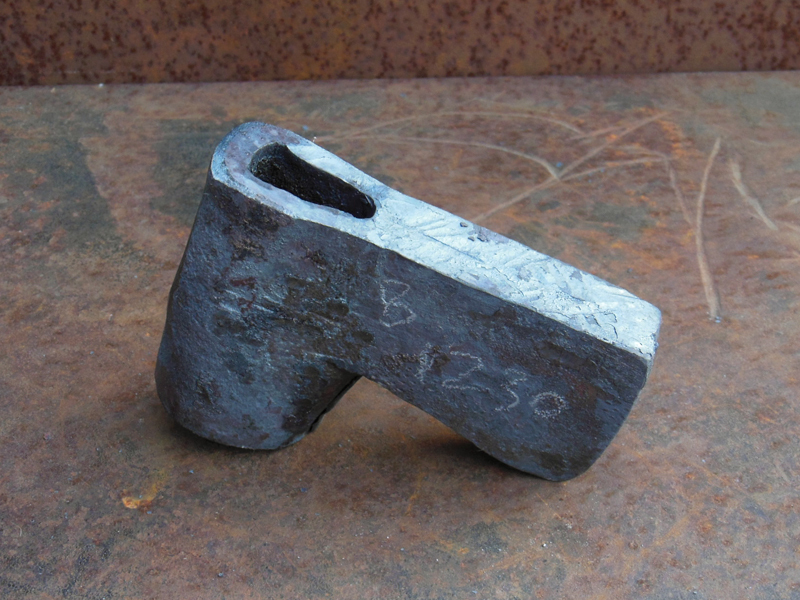 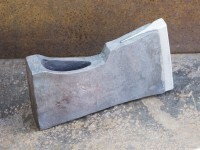 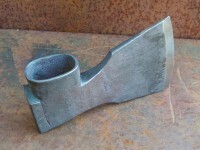 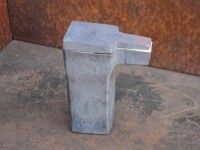 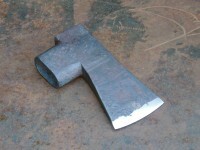 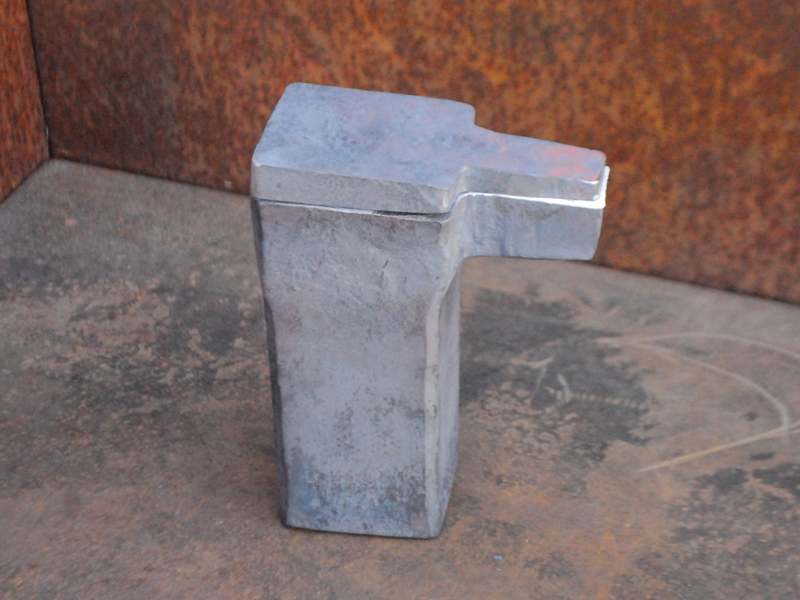 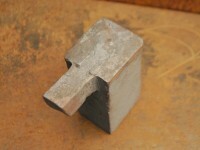 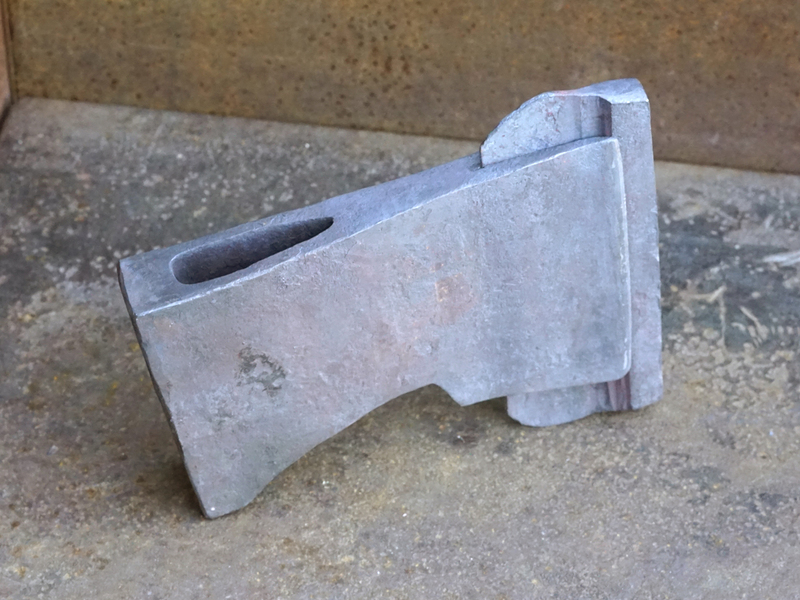 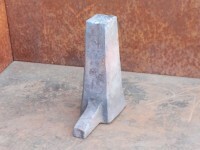 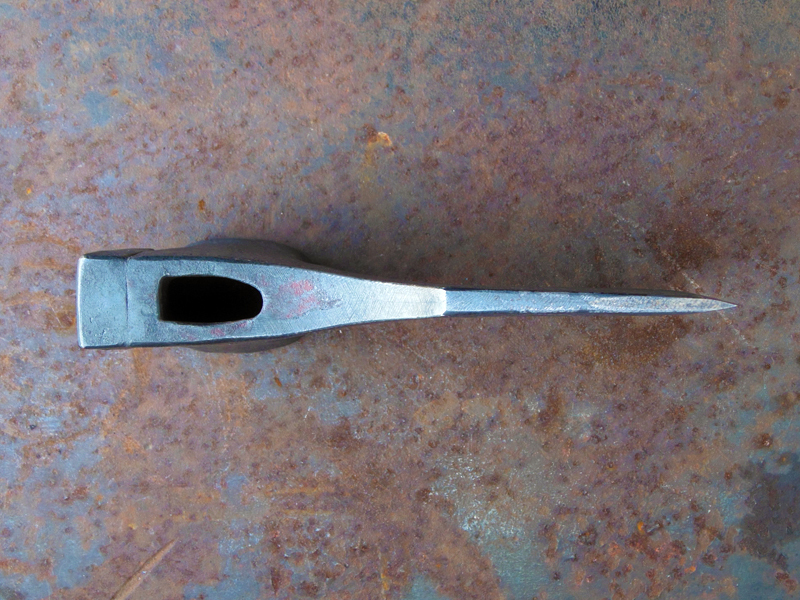 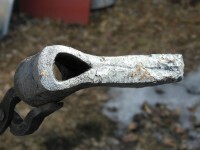 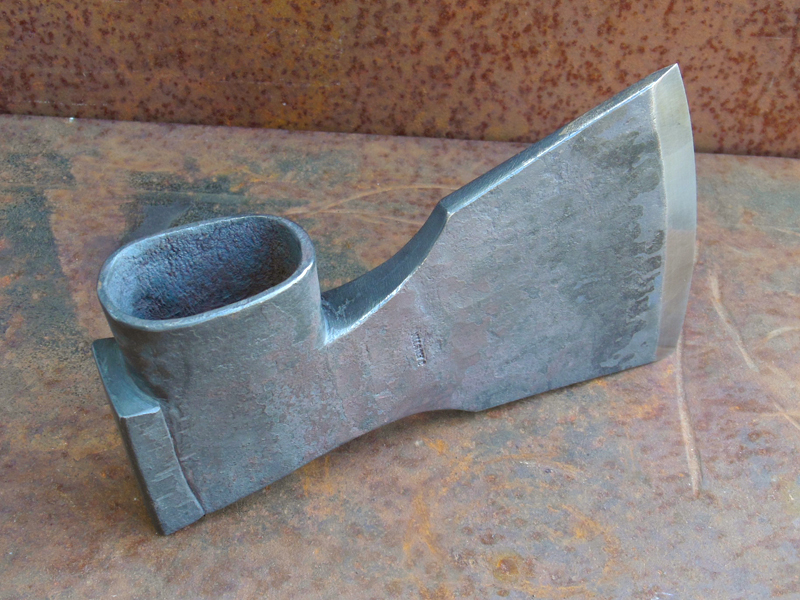 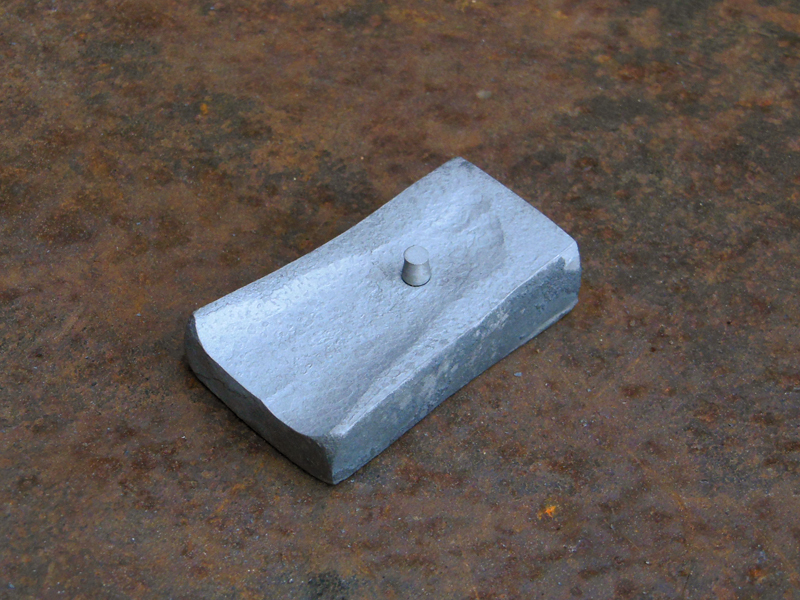 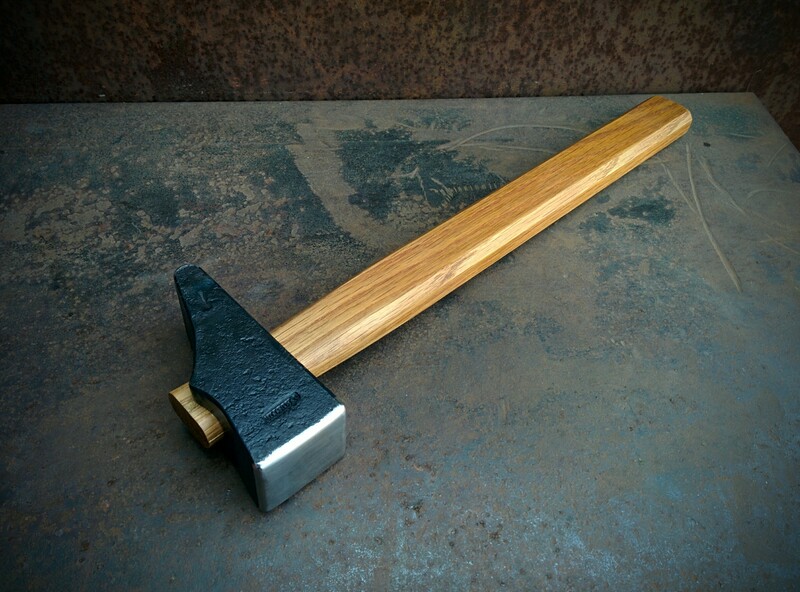 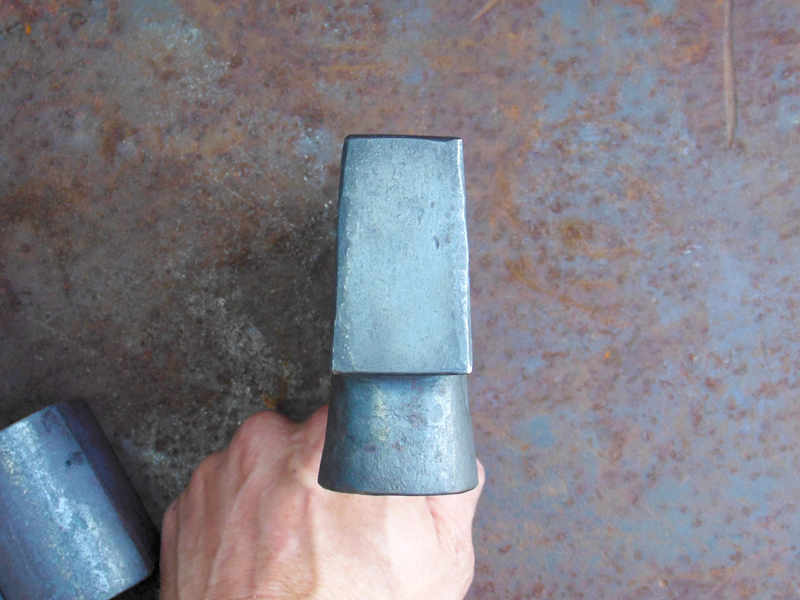 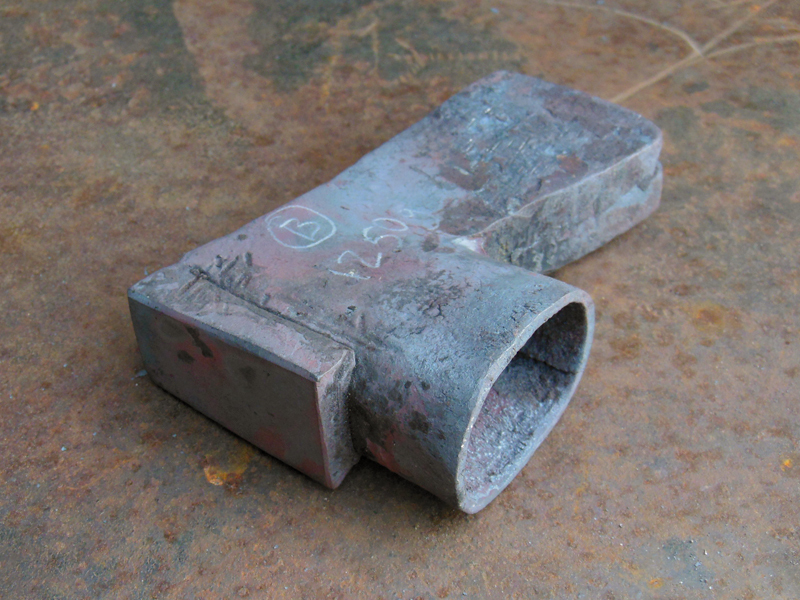 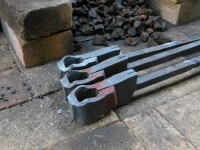 A hammer billet with a forge welded face that has been squared and marked for punching. Driving in the drift to enlarge the eye. 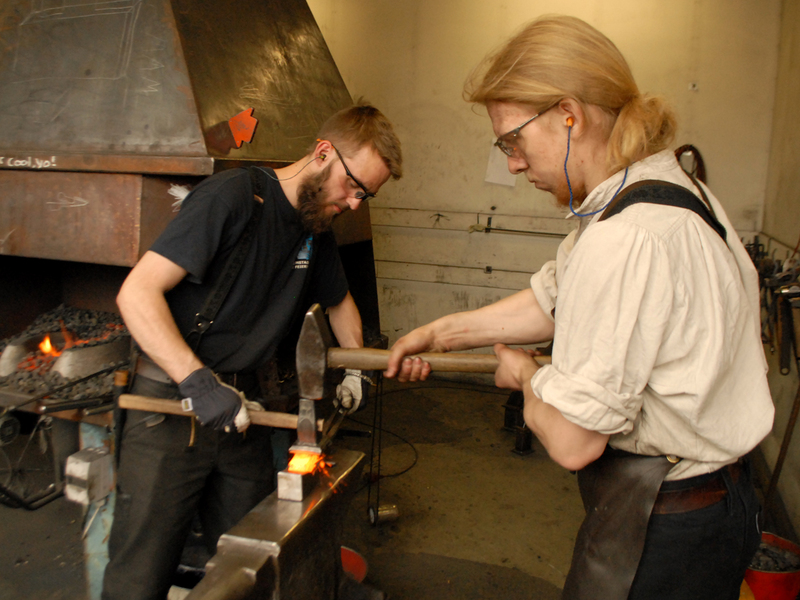 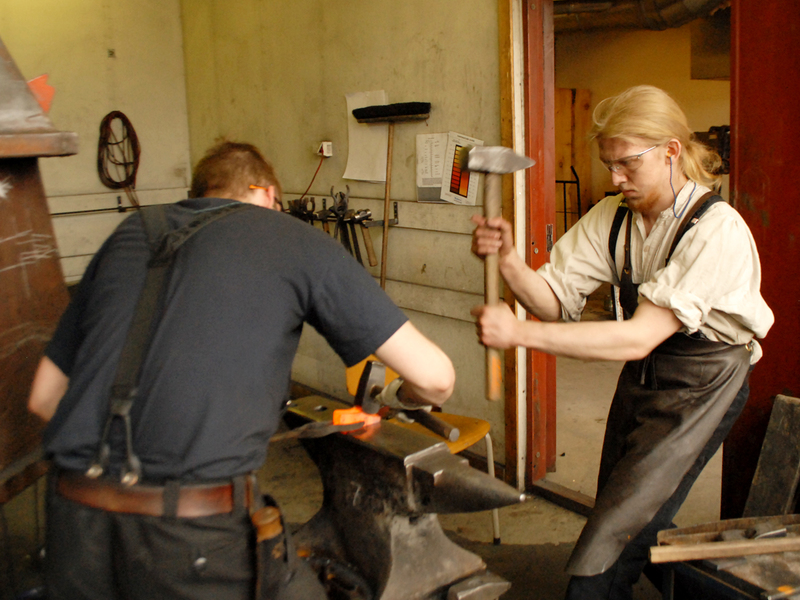 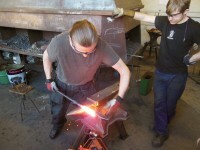 Marcus and Magnus shape the hammer on a special bolster. 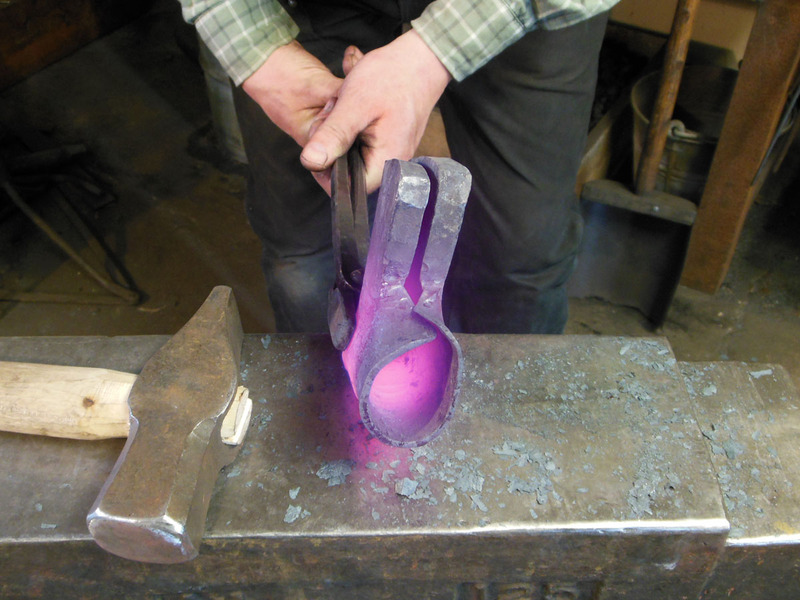 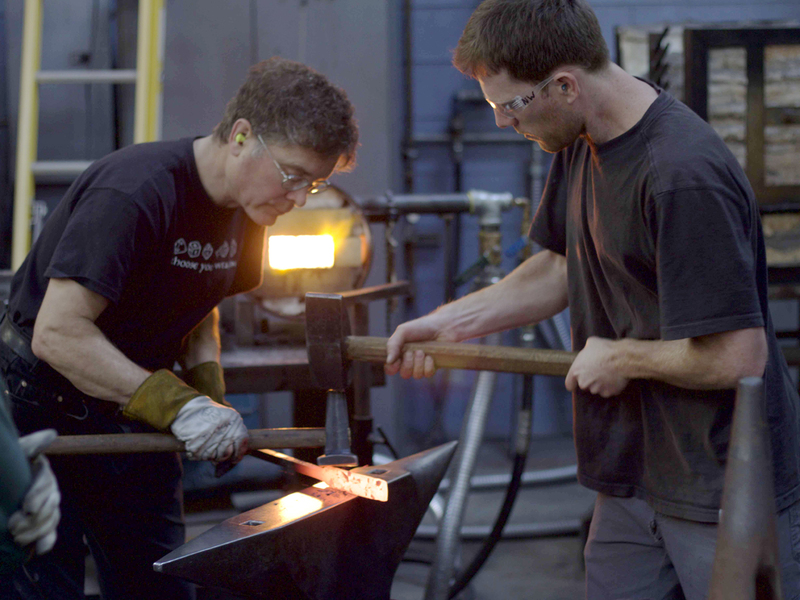 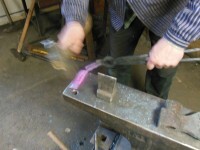 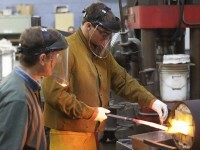 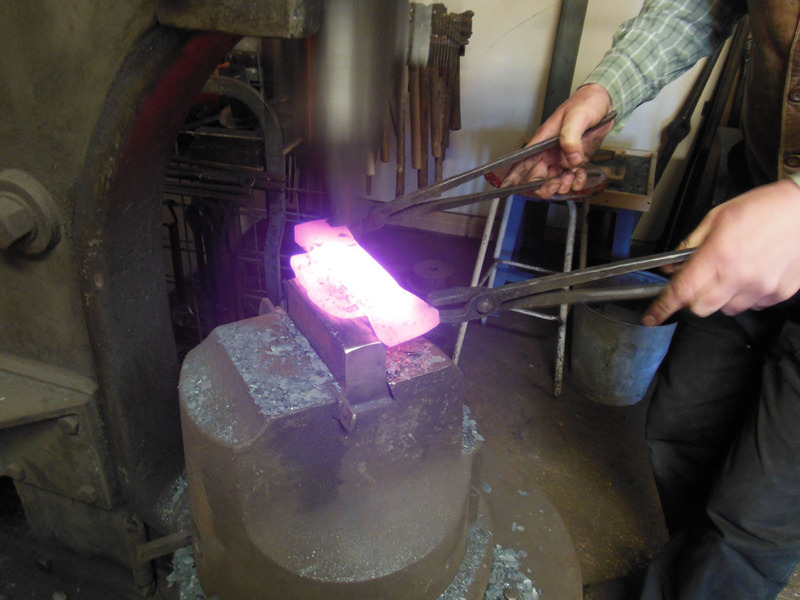 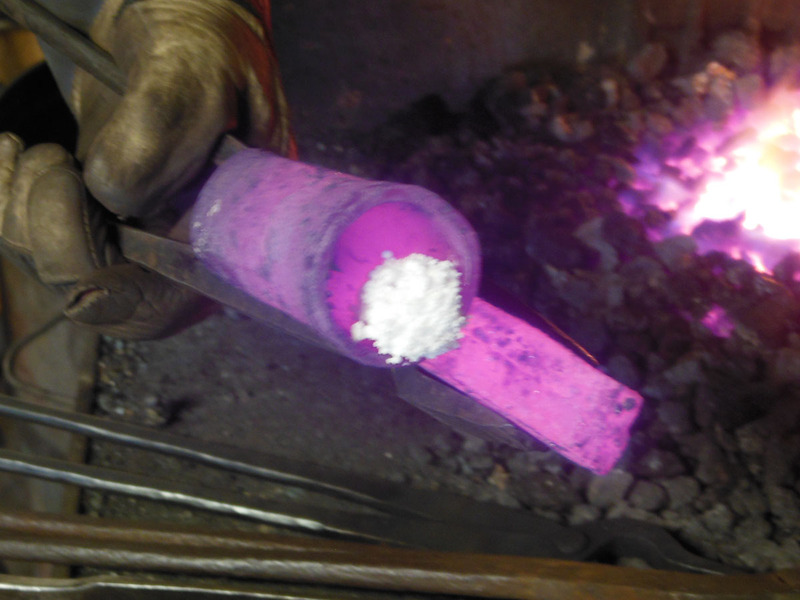 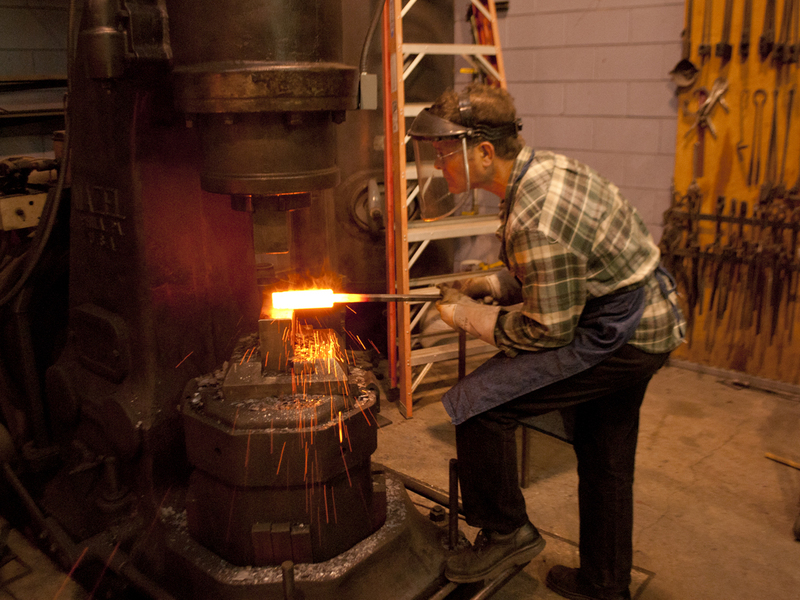 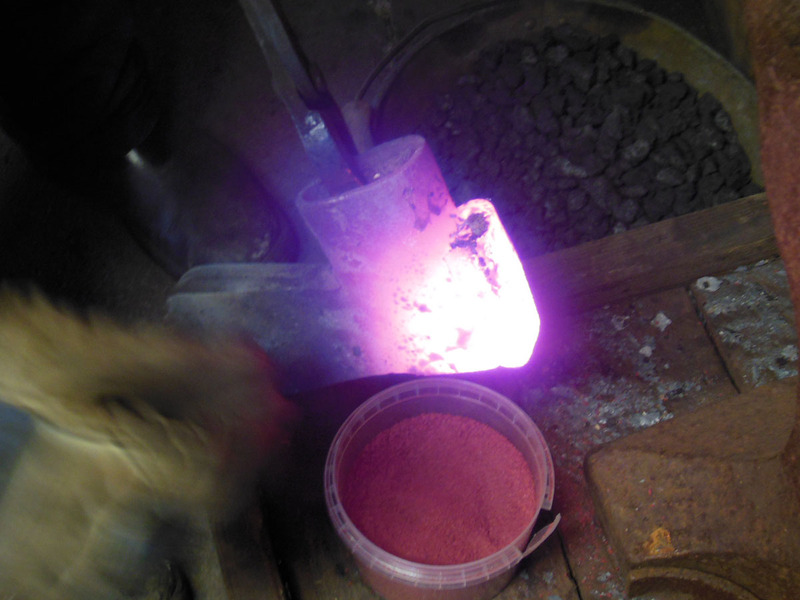 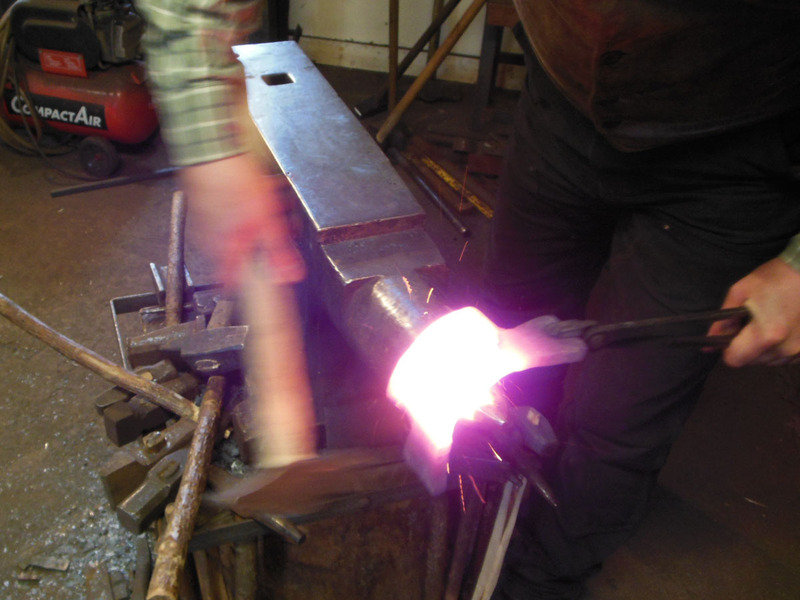 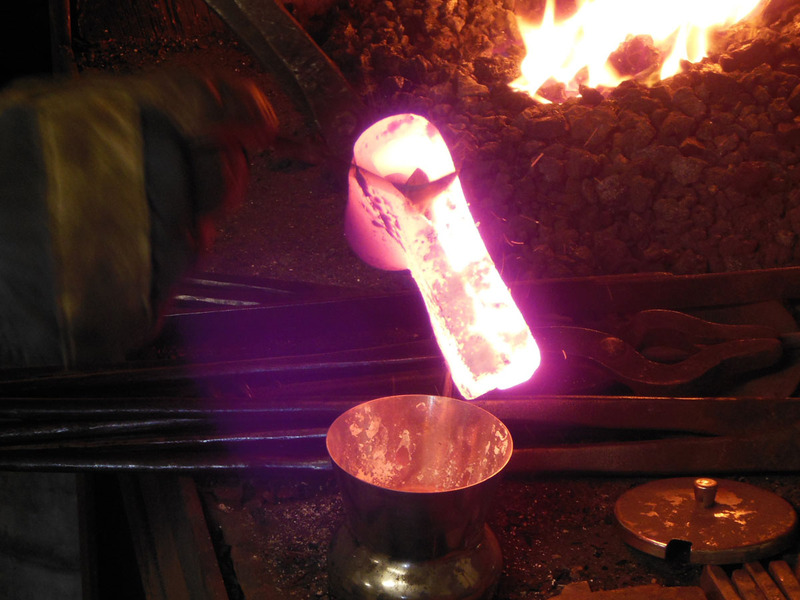 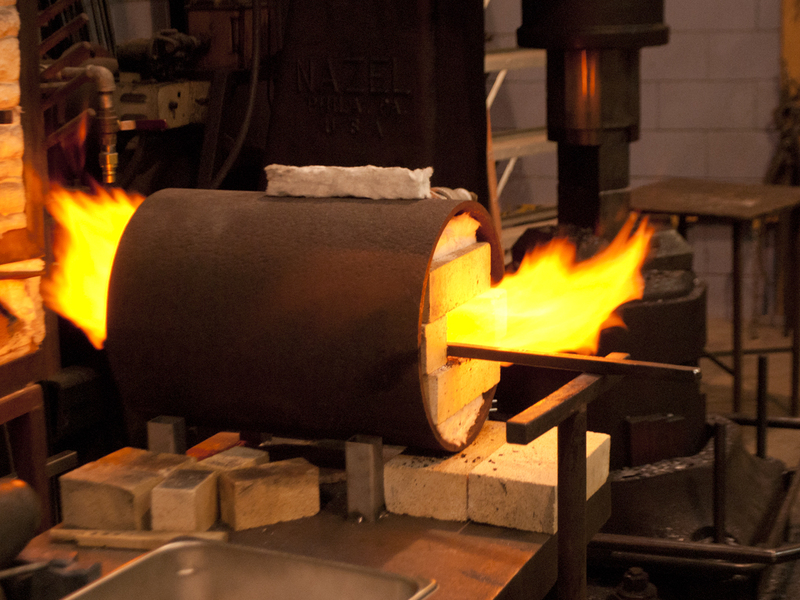 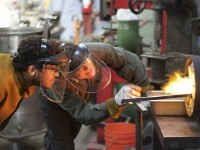 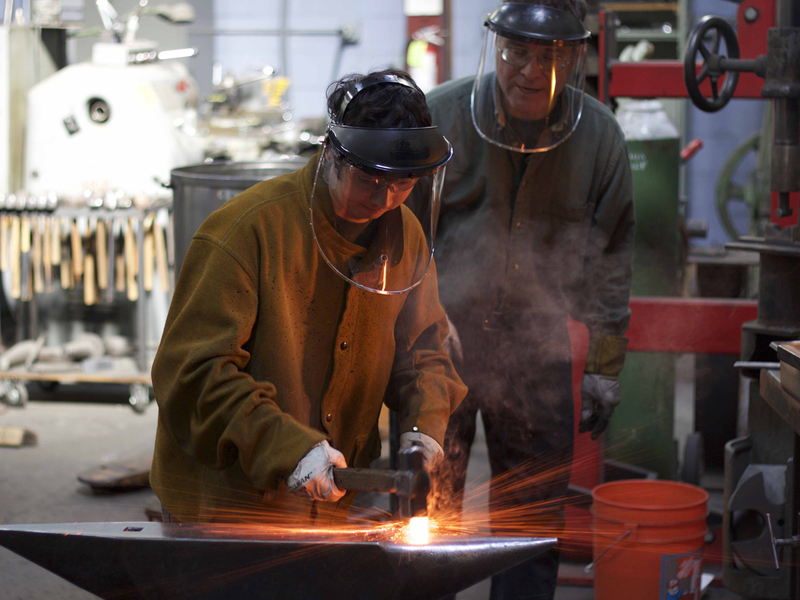 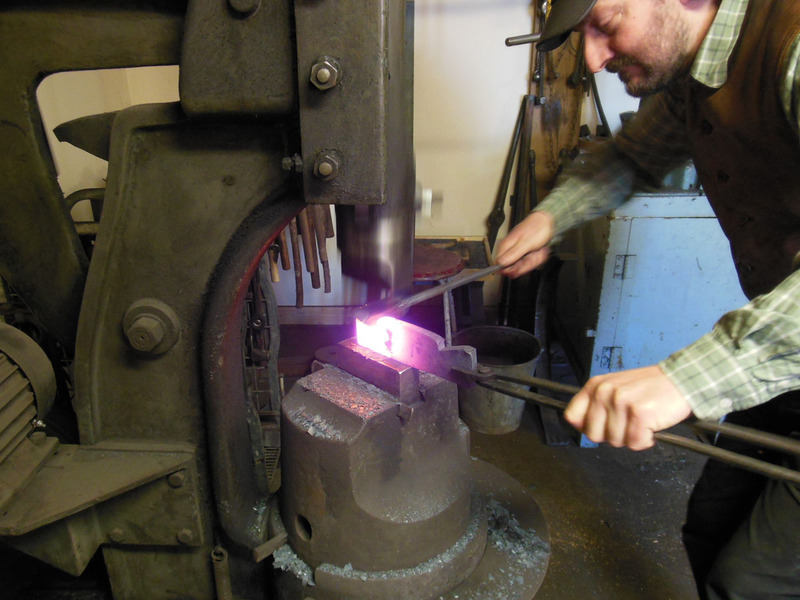 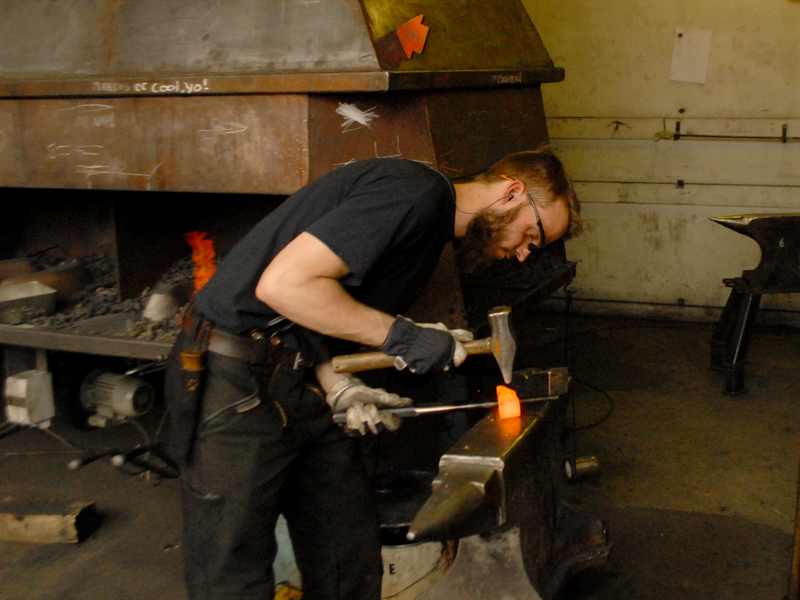 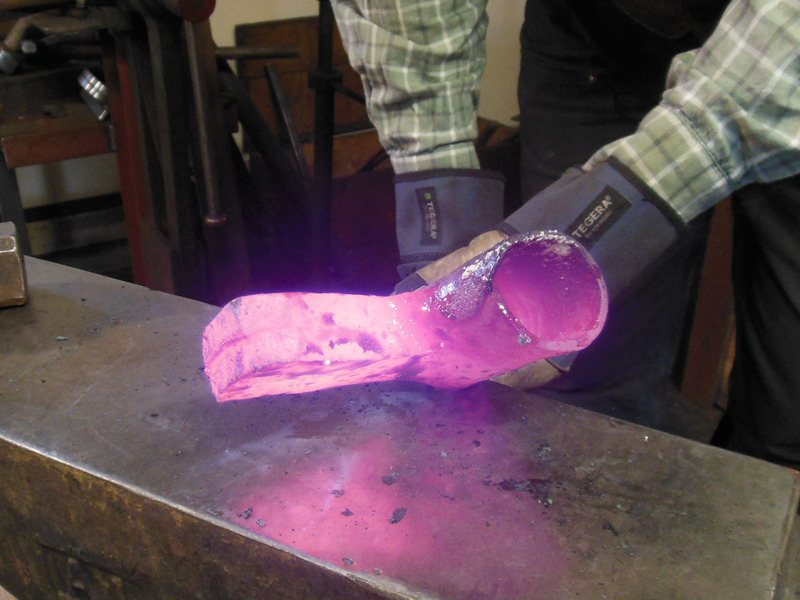 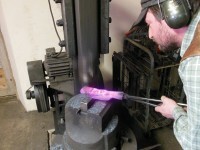 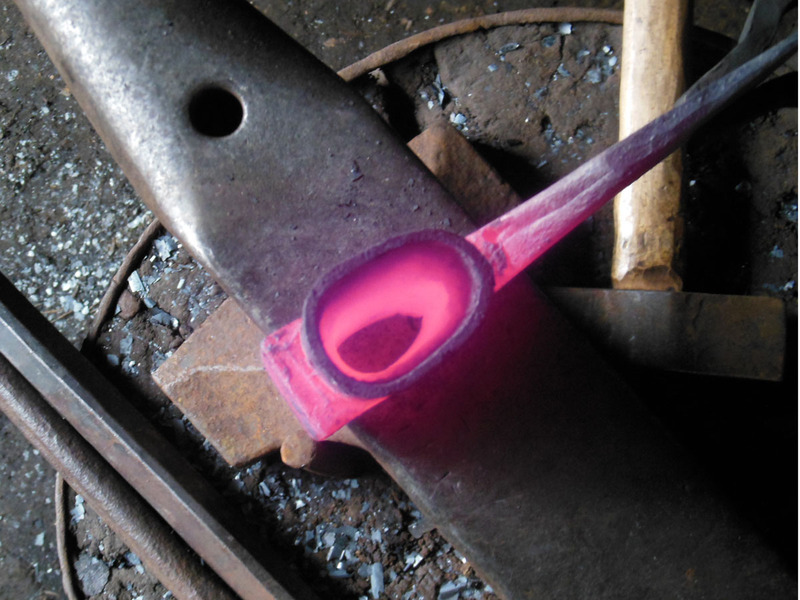 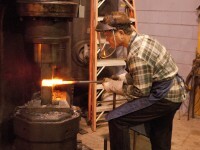 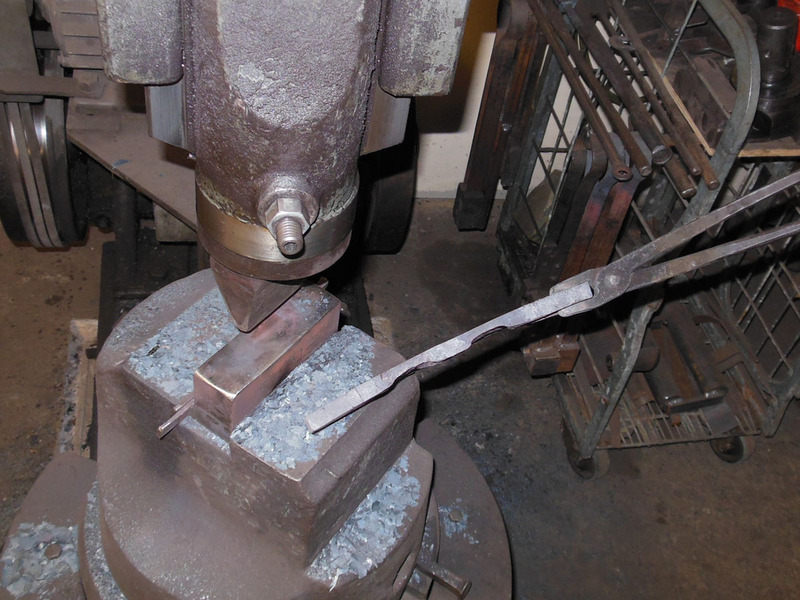 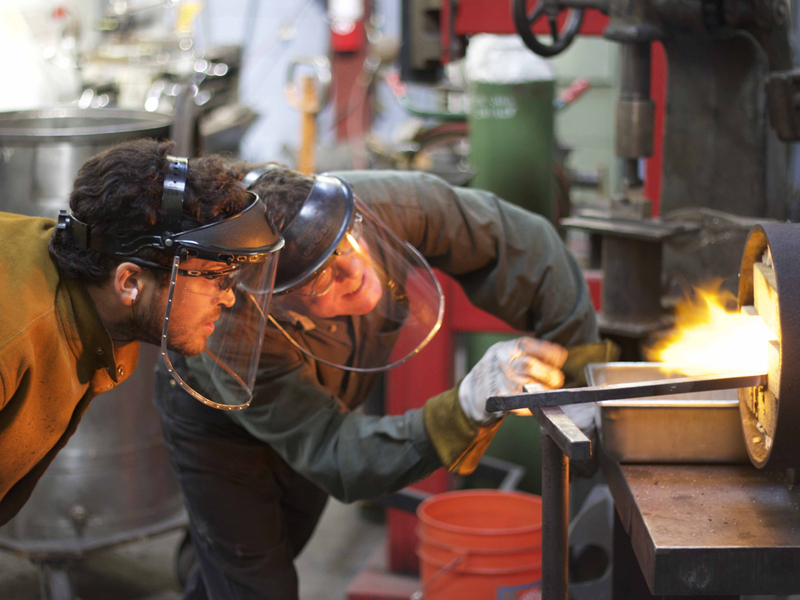 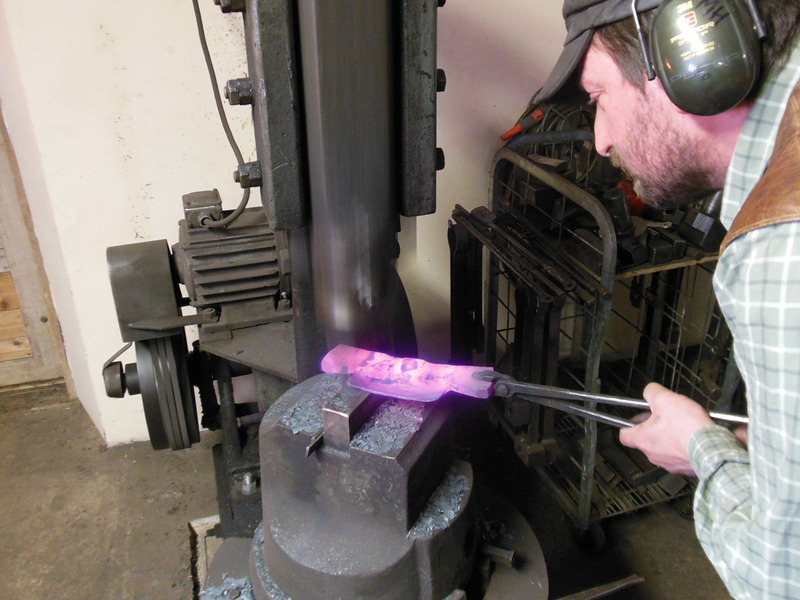 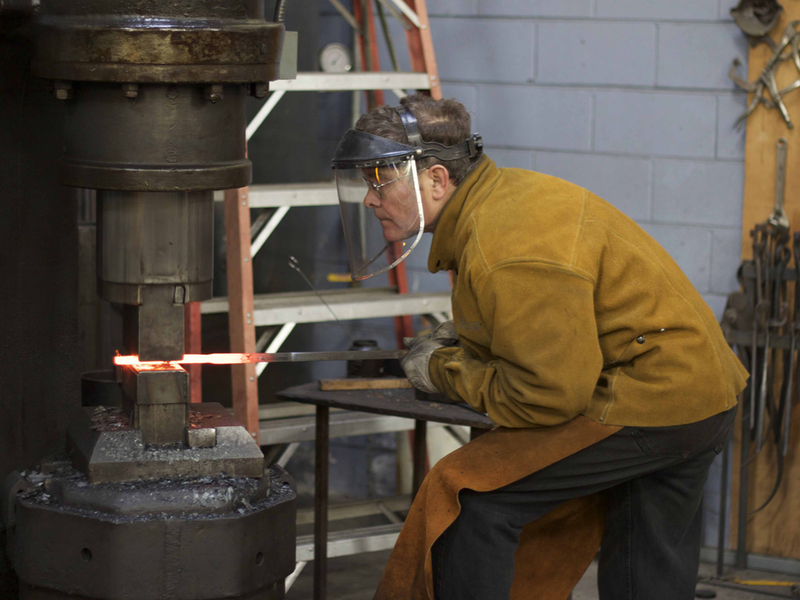 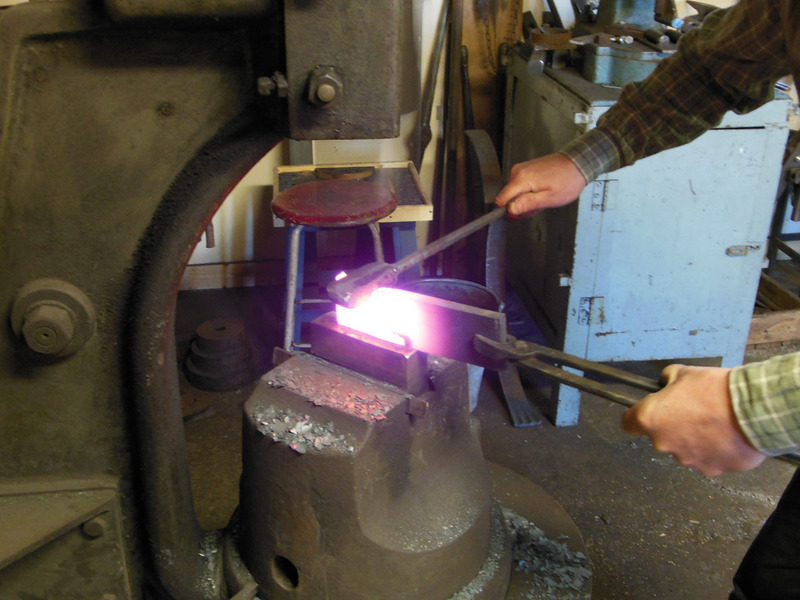 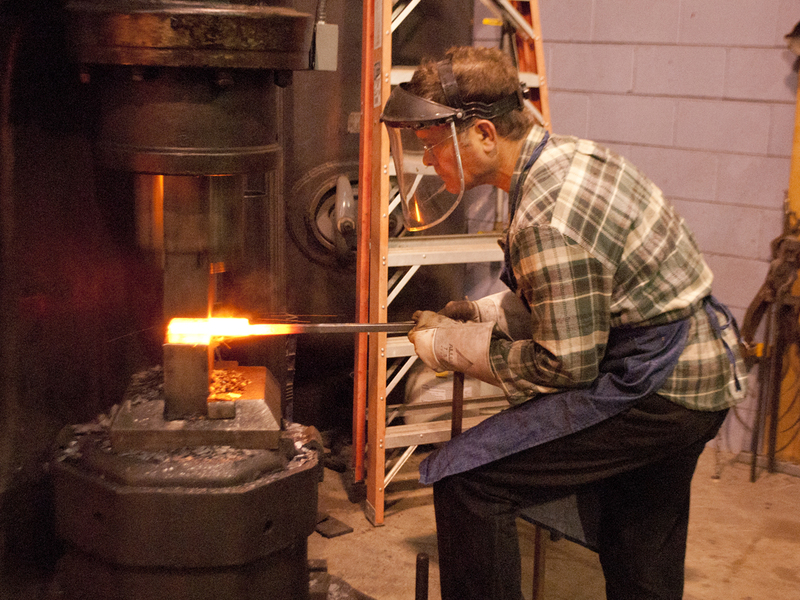 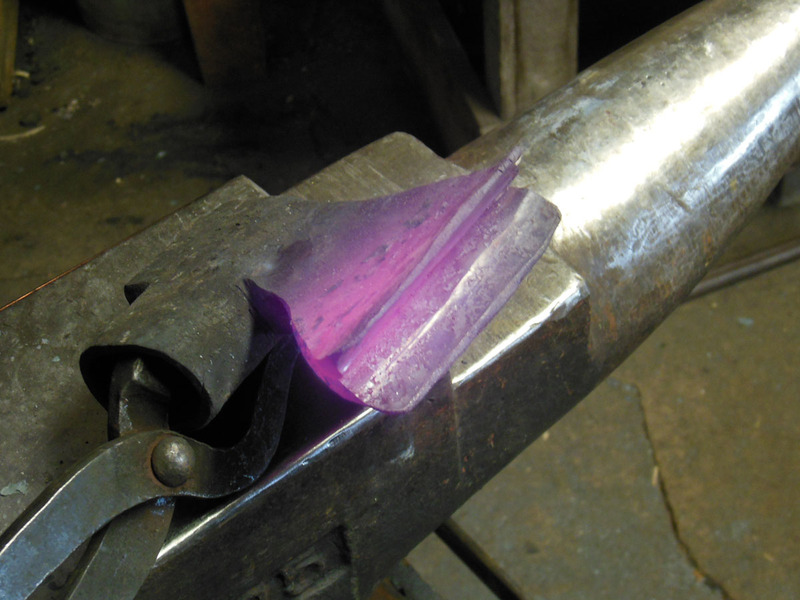 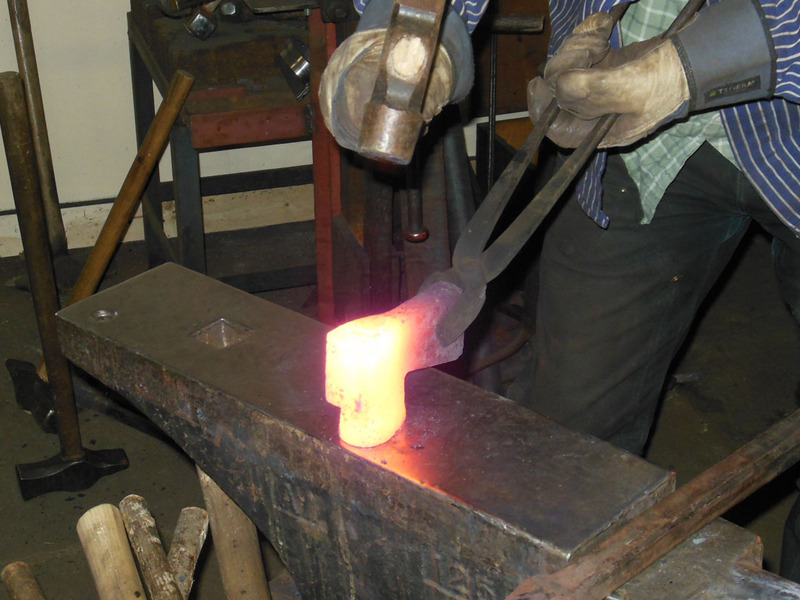 Using a 2″ fuller to shape the langets. 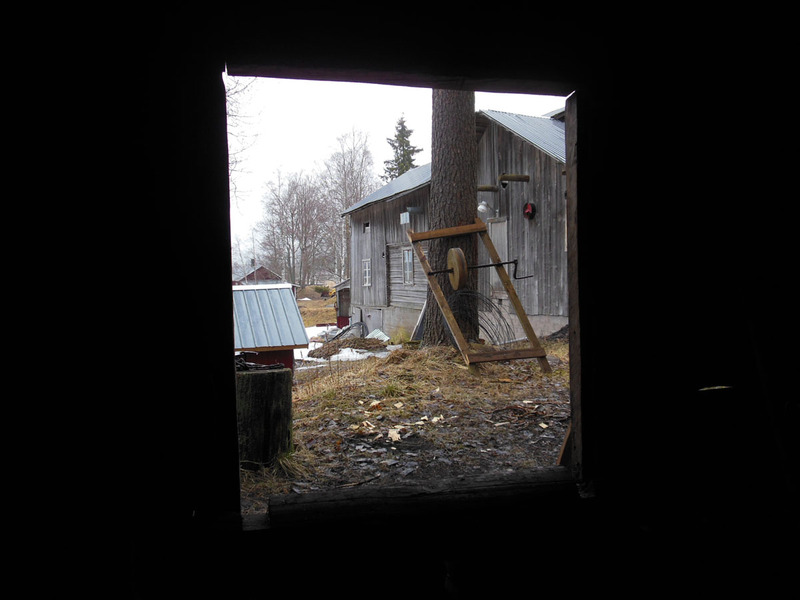 From Oystein’s smithy I made my way by train and bus back north in Norway to the small town of Trysil on the border with Sweden. 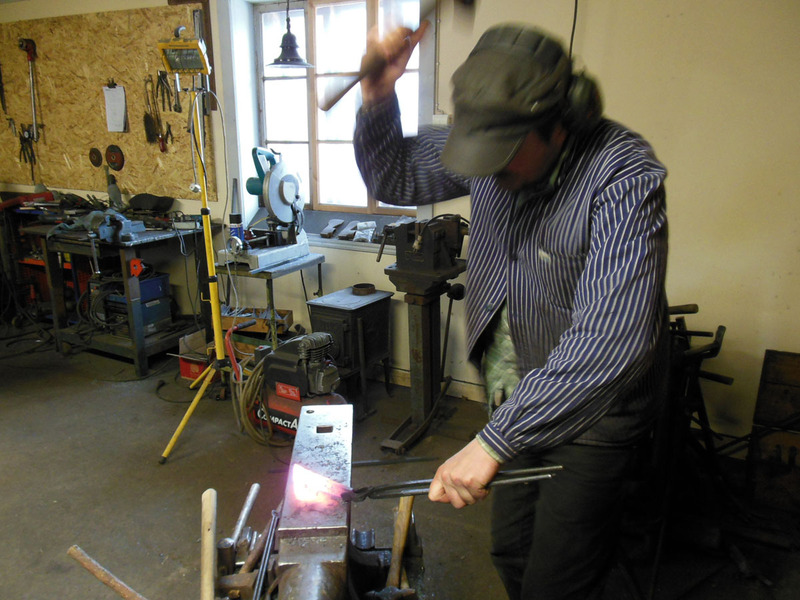 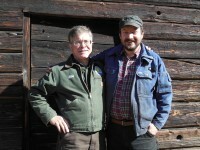 The next blacksmith of my Scandinavian axe journey, Mattias Helje, picked me up there and took me to his home and smithy in western Sweden in the town of Lima. 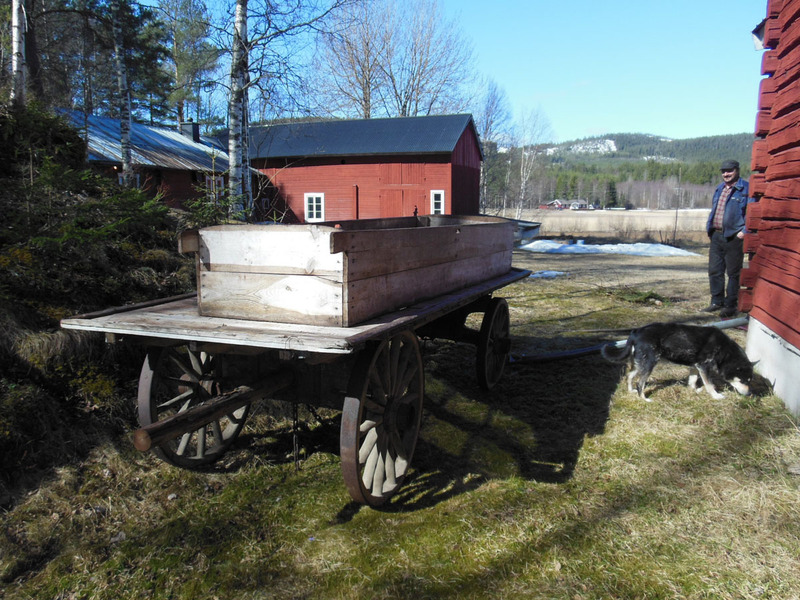 Lima is in Dalarna county, which is steeped in tradition and has a long history of iron smelting and blacksmithing. 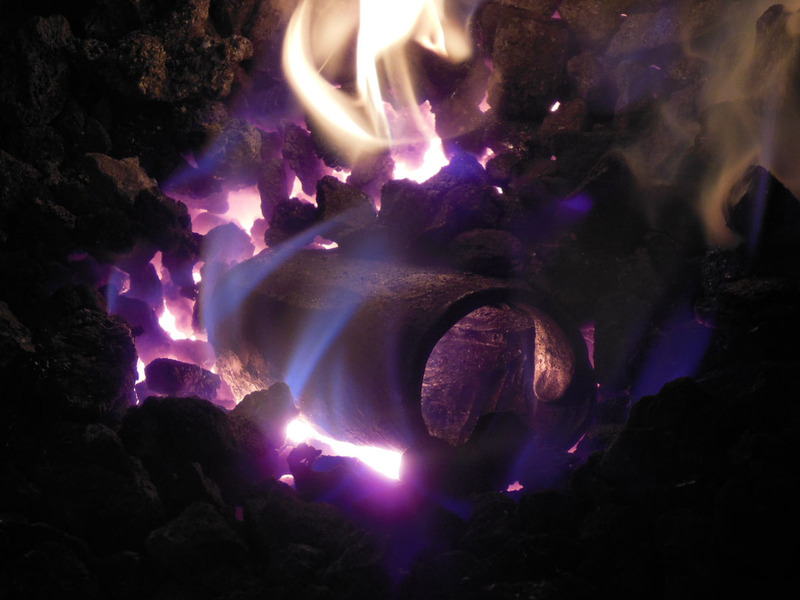 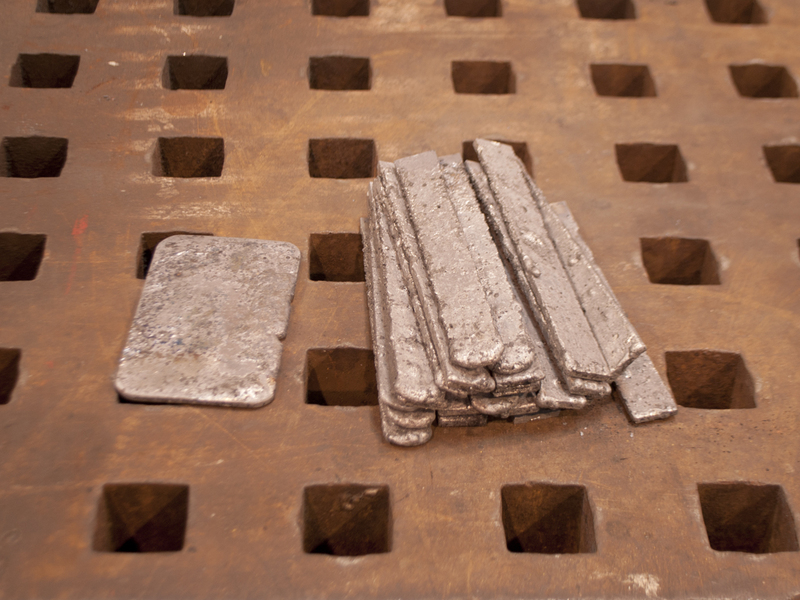 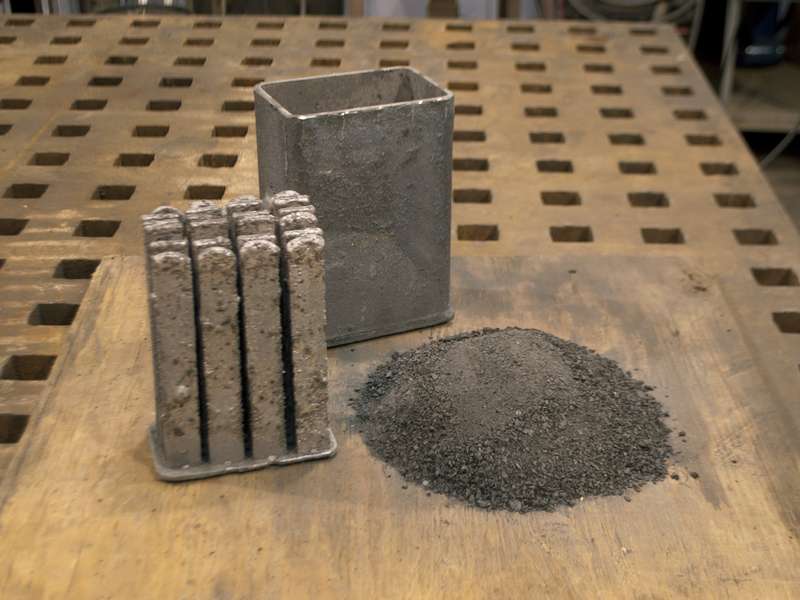 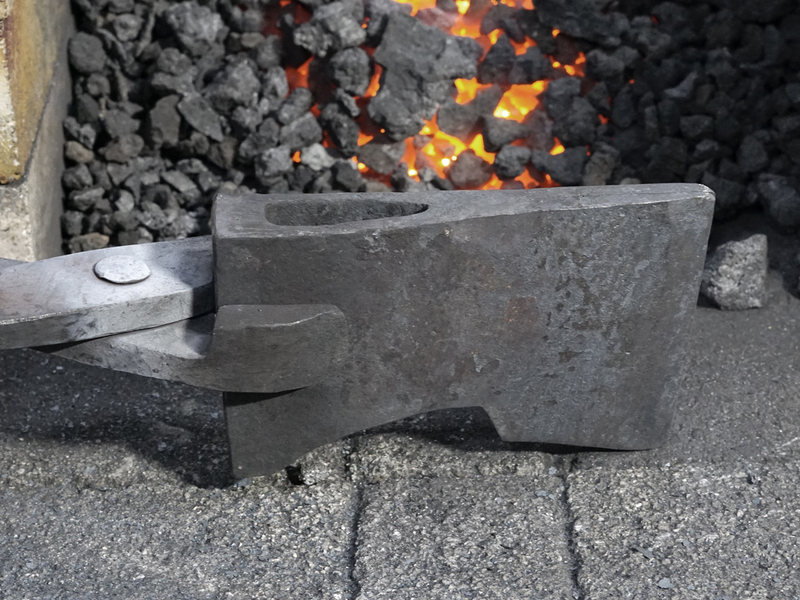 With plentiful, clean charcoal fuel and pure iron ore, Sweden has long been famous for the quality of its steel. 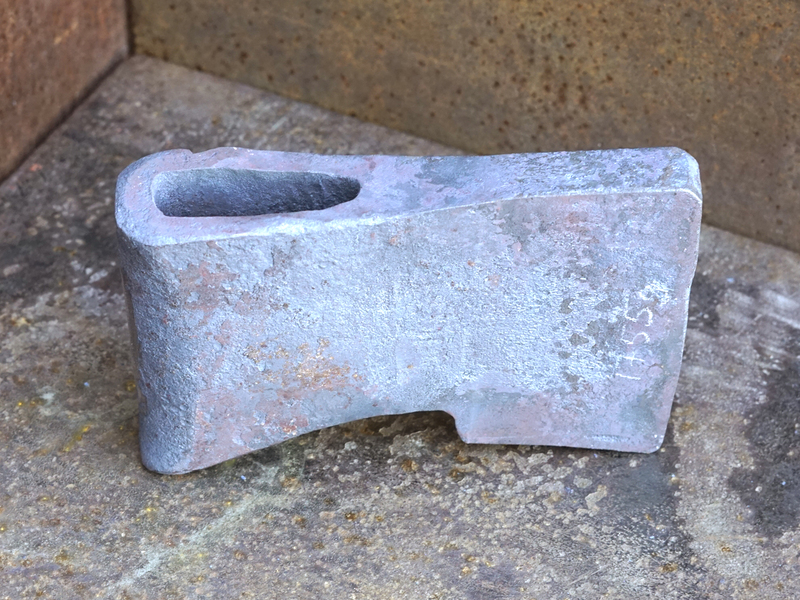 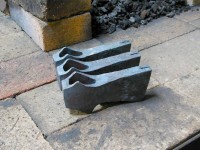 This steel was highly sought after in Europe for tool making for centuries – I recall it being specifically mentioned as the most prized material for anvil faces at the Refflinghaus anvil smithy in Germany in the 1980’s when I researched anvil forging tradition there. As I had hoped, Mattias forged a socketed axe for me of a type that is widespread in Sweden. He referred to it as a “carpenters axe” and told me that it hailed from central and northern Sweden. It was developed in the late 19th or early 20th century and was used through the 20th century. 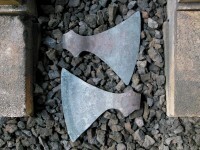 The particular axe that he reproduced for me was originally forged by Nygårds Martin Olsson (1859-1925). 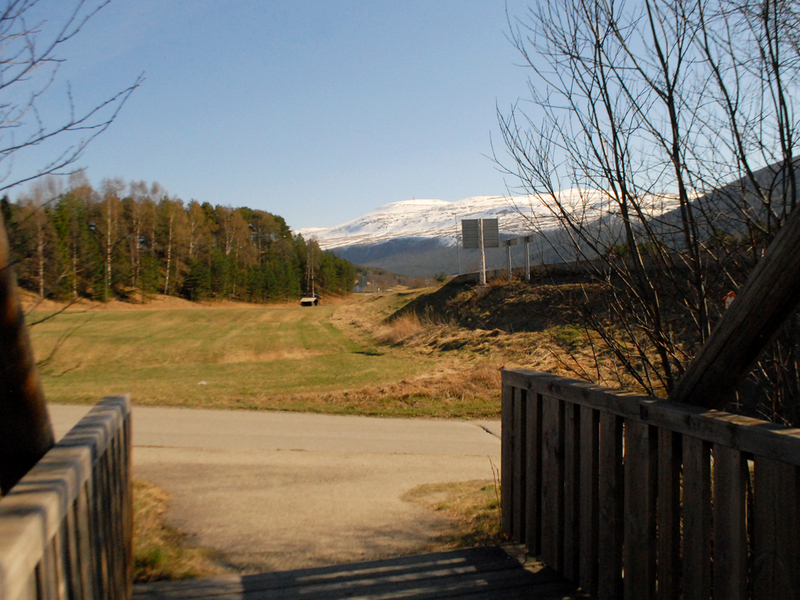 The unique, socketed eye is beautiful in form and, in Norway, is called a “Swedish Eye”. 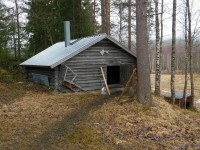 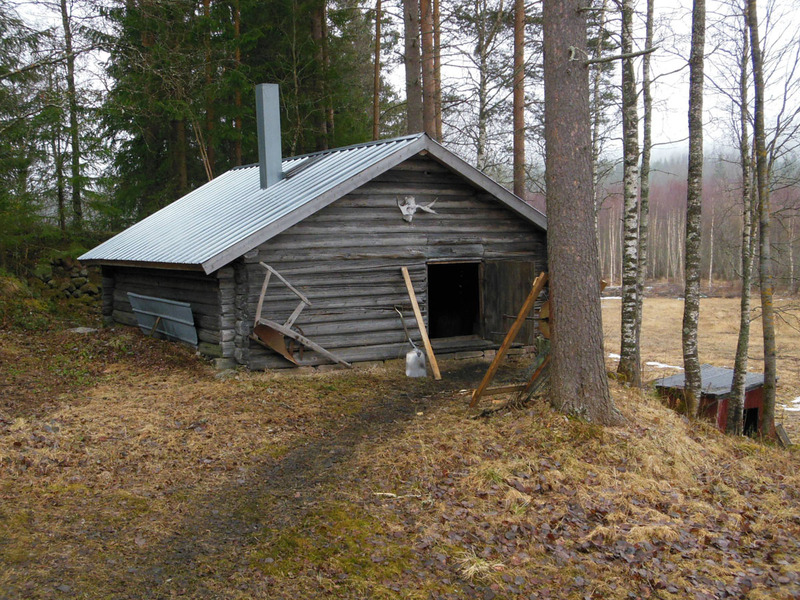 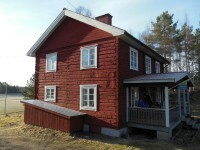 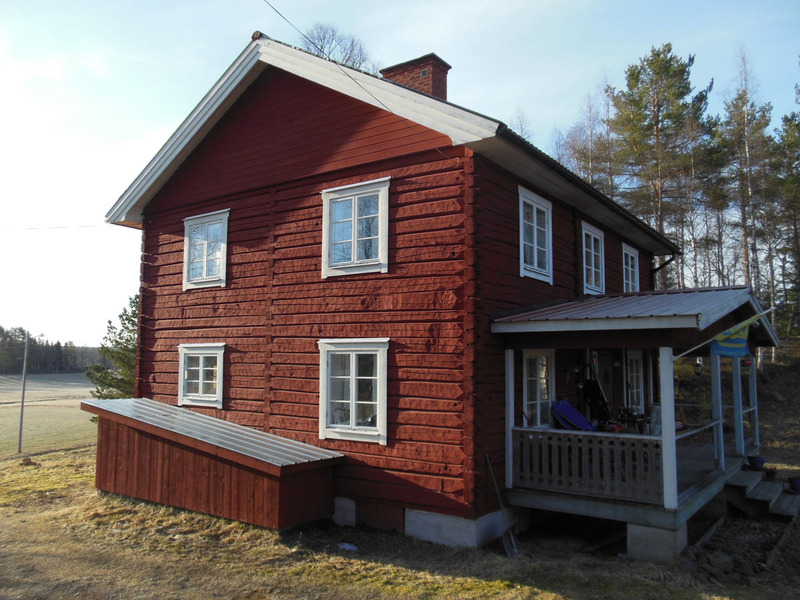 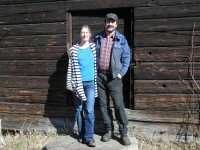 The cabin I stayed in – also hand hewn! 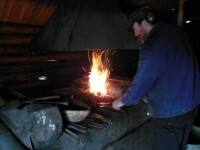 Mattias’ main smithy (one of three!). 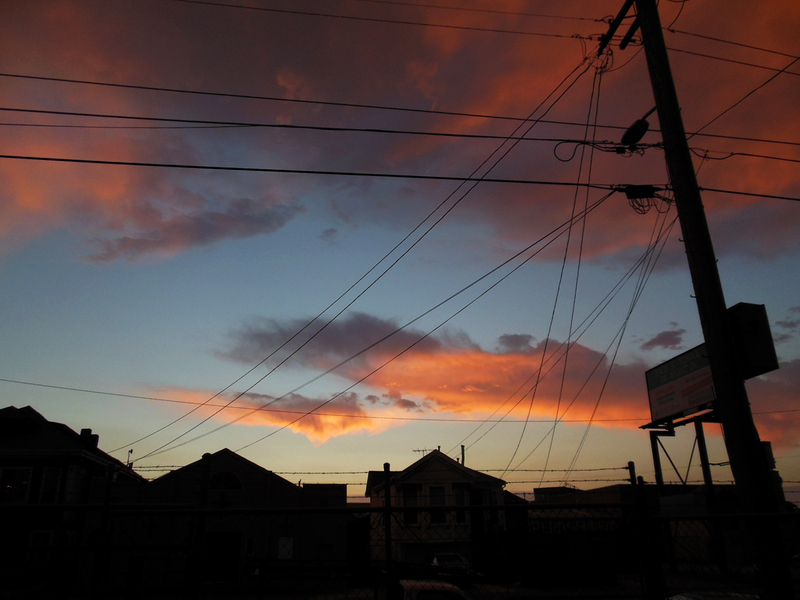 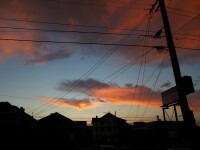 Lima landscape in April. 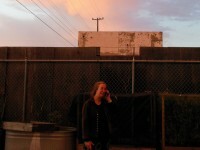 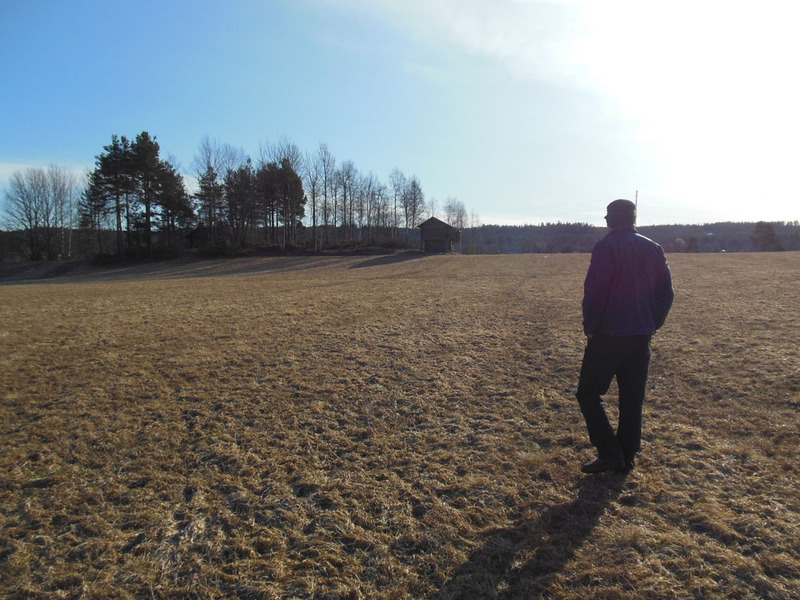 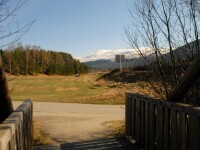 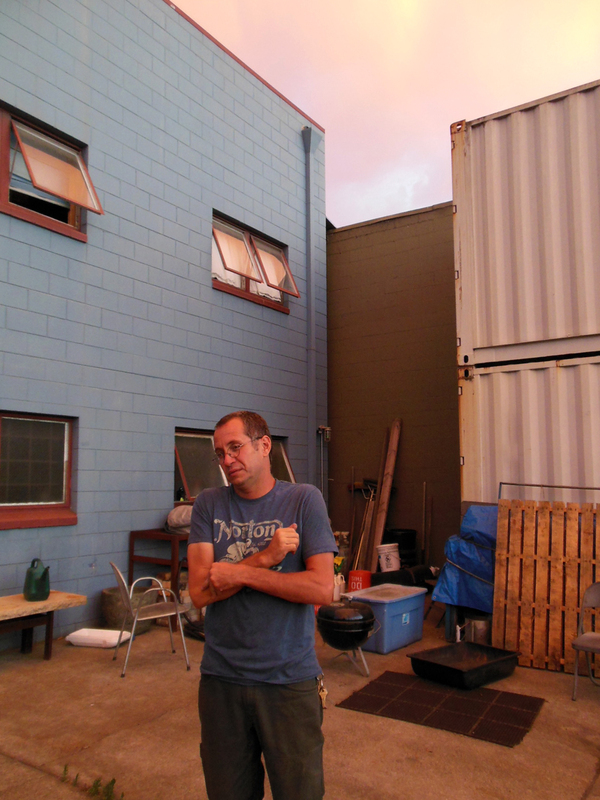 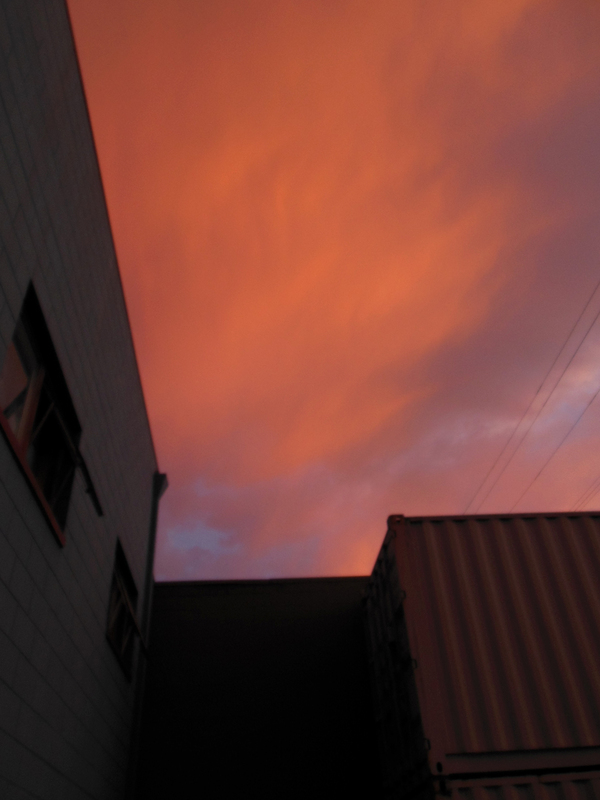 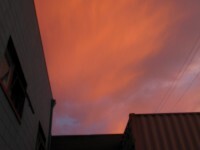 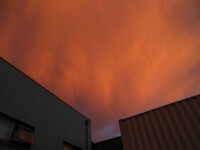 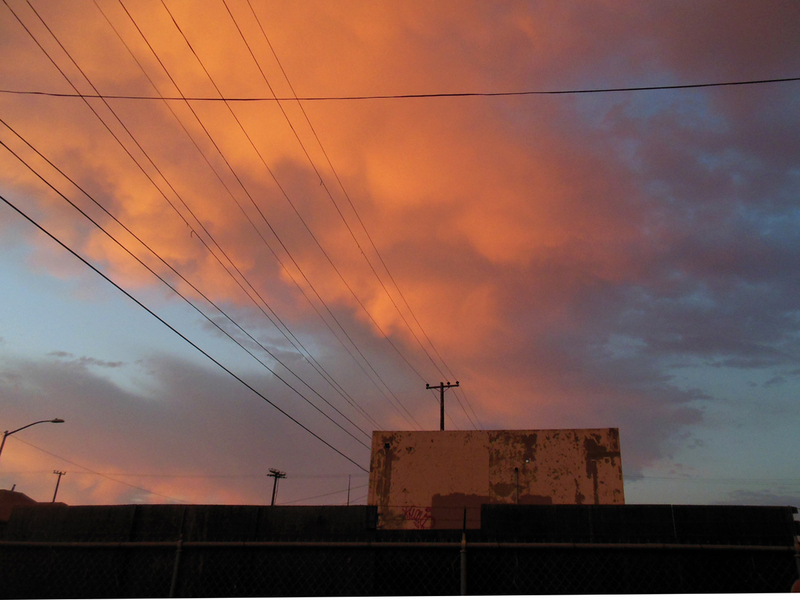 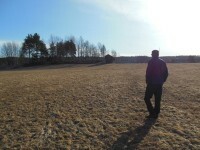 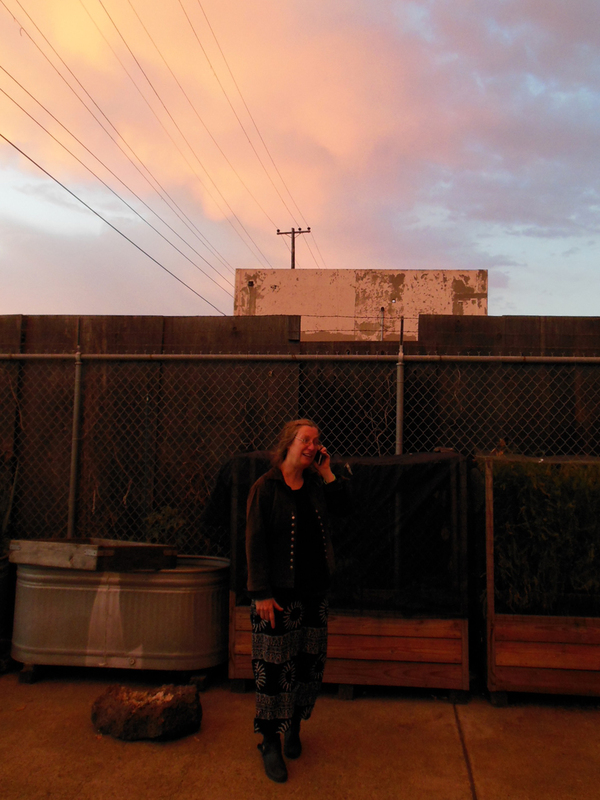 We took a little walk before Mattias began forging. 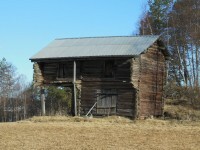 On the way we passed an old barn – the lower section was built in the 16th century. 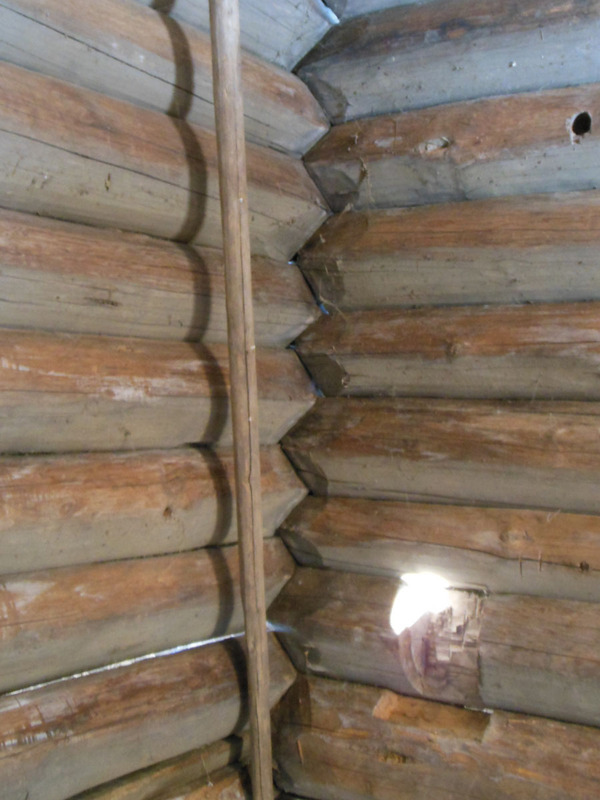 Tight joinery in the old part of the barn. 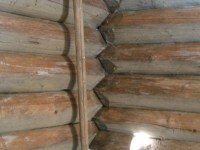 Corner joinery as seen from inside. 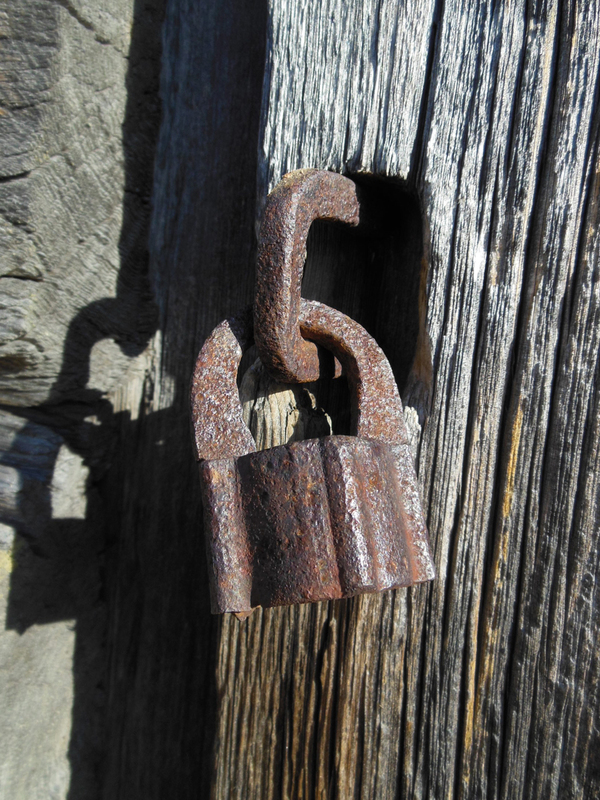 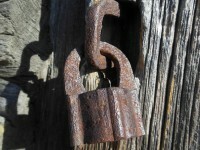 An old lock on the door. Getting started on the axe. 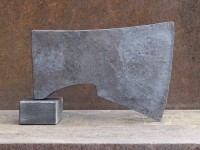 The axe Mattias will reproduce, and the starting piece of wrought iron. 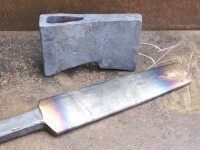 Offsetting one side of the blade with a butcher. 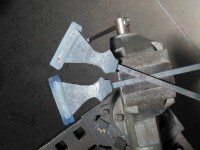 Adjusting the angle of the offset blade halves. 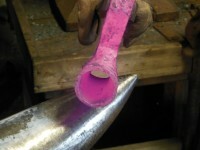 A quick change to a top fullering die on Mattias’ mechanical hammer. Thinning out the socket material. Checking dimensions to make sure he stays true to the old design. 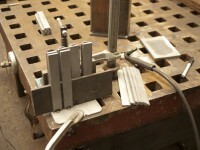 Drawing out the corners of the socket material. 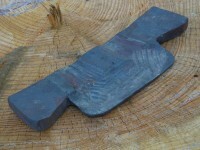 A view of the cross-section of the axe blank. The thick material in the middle will become the back of the axe-eye. The thick material to each side will be laminated together to form the blade. Another view of the fully drawn-out axe blank. 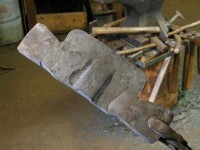 Another view of the Carpenter’s Axe that Mattias is reproducing. 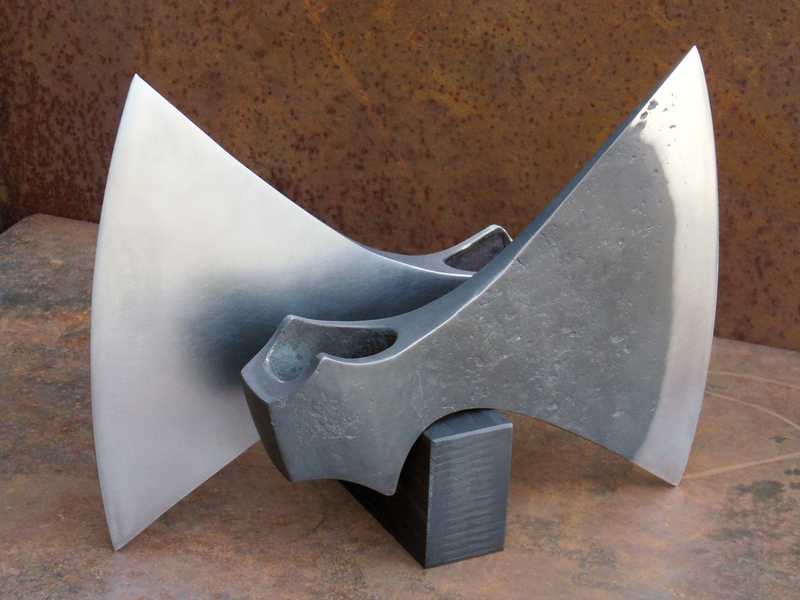 It is beautifully done. A comparison of the old axe to the new axe blank. 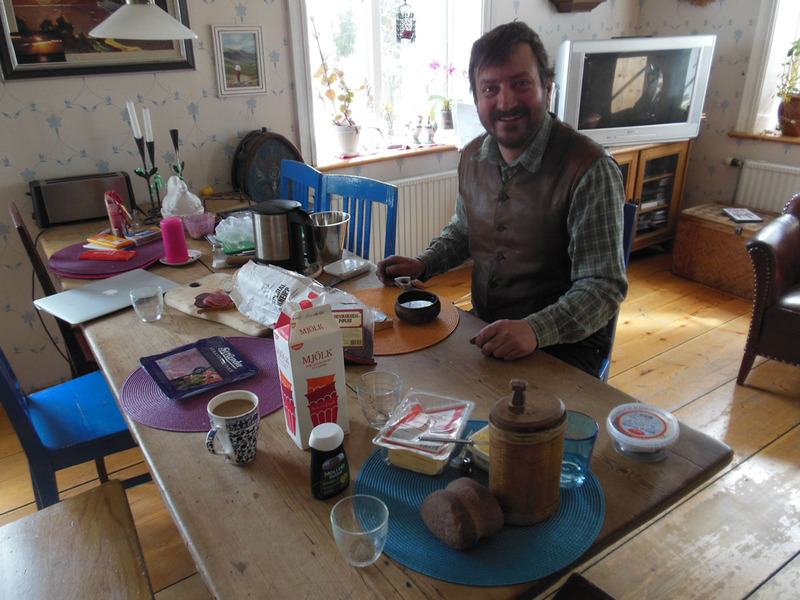 Second Breakfast is For Real in Sweden (and Norway)! 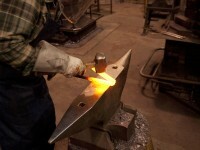 Back to work. 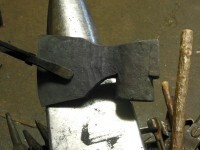 The heavy material which will become the back of the axe will be pushed to the other side of the blank where it needs to be. 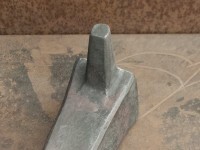 This will be done over the rounded edge of the anvil as shown. 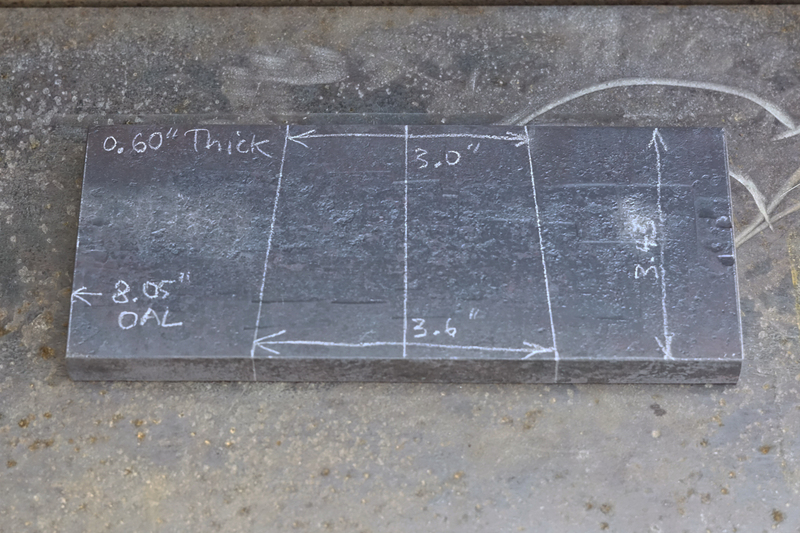 The heavy section is set down. Another view of this operation. 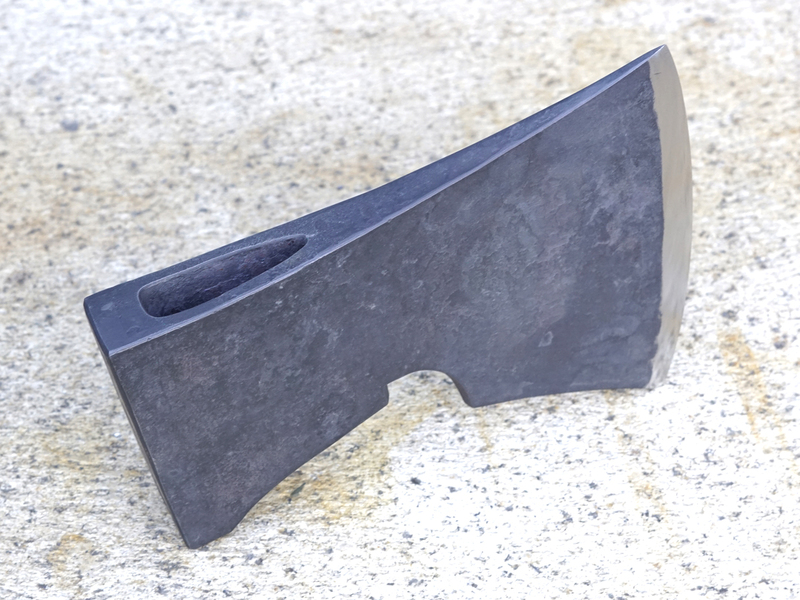 The back of the axe (poll) is now correctly placed. The edges of the socket material which be lap-welded together are curved over the horn to put them in the right place. 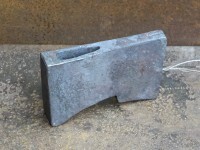 View of the axe blank which is now ready to be folded. Another step in folding the axe blank. 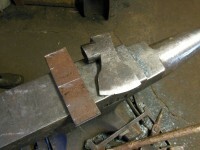 A view of the folding progress. 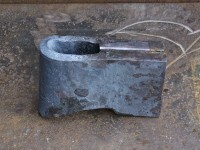 The closed axe blank ready for welding. 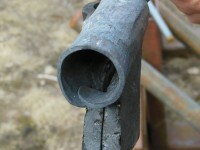 The fit-up of the socket. 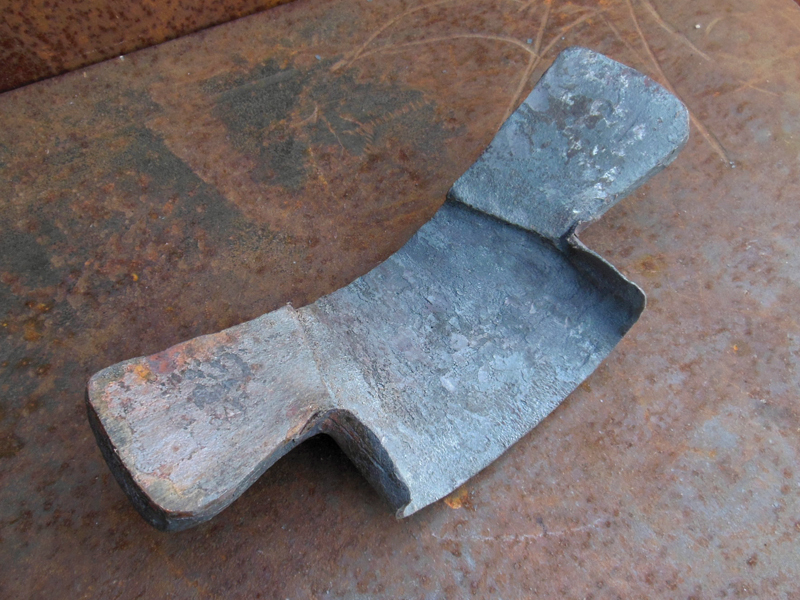 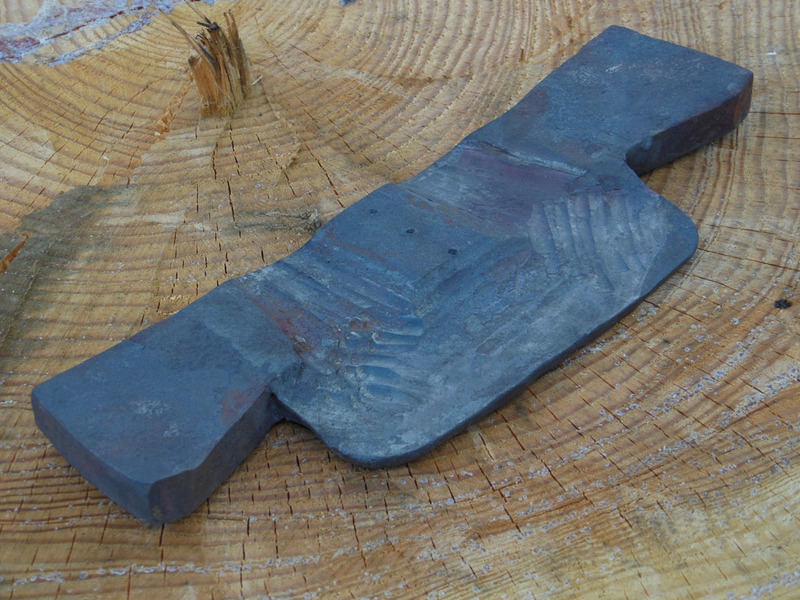 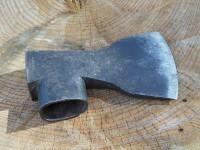 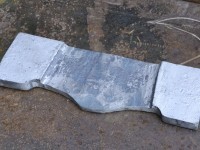 Another view of the folded axe blank. 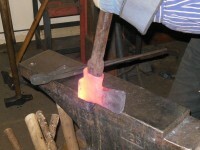 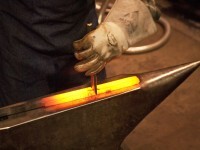 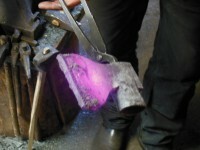 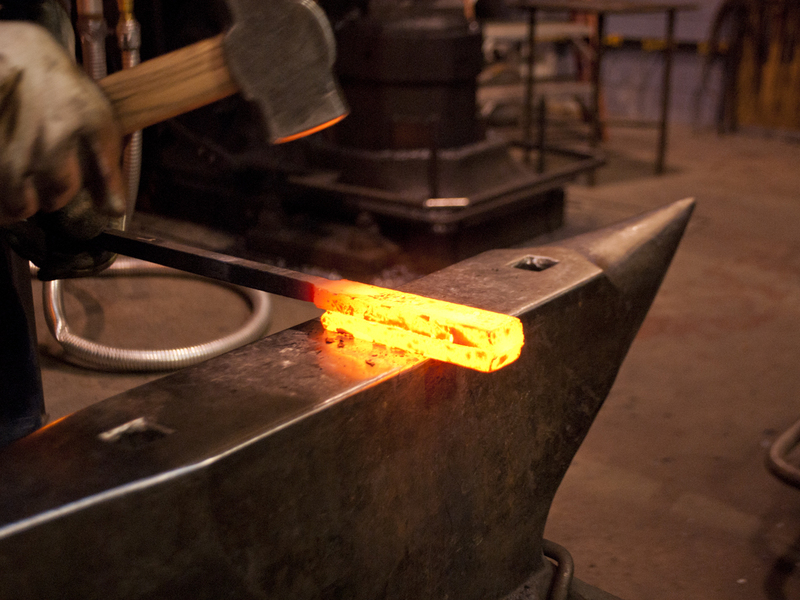 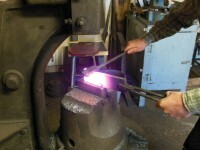 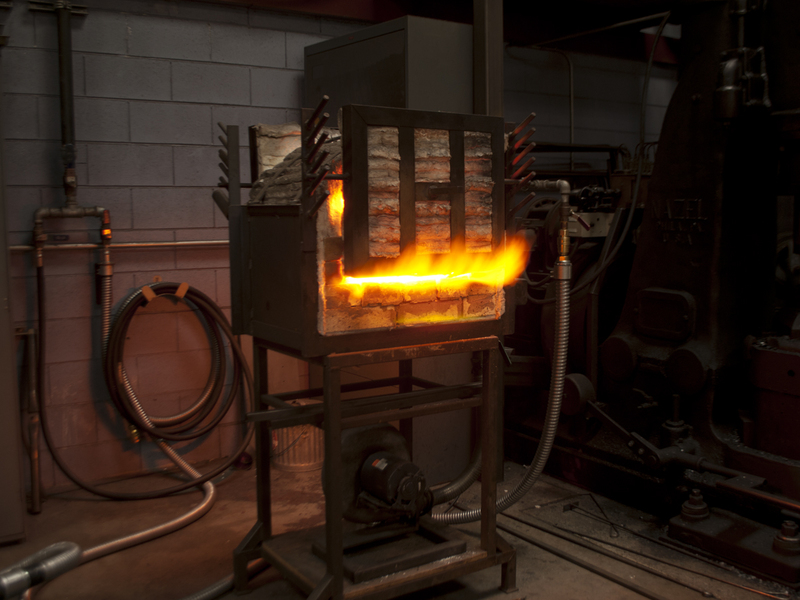 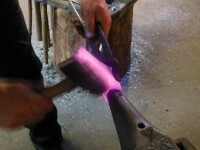 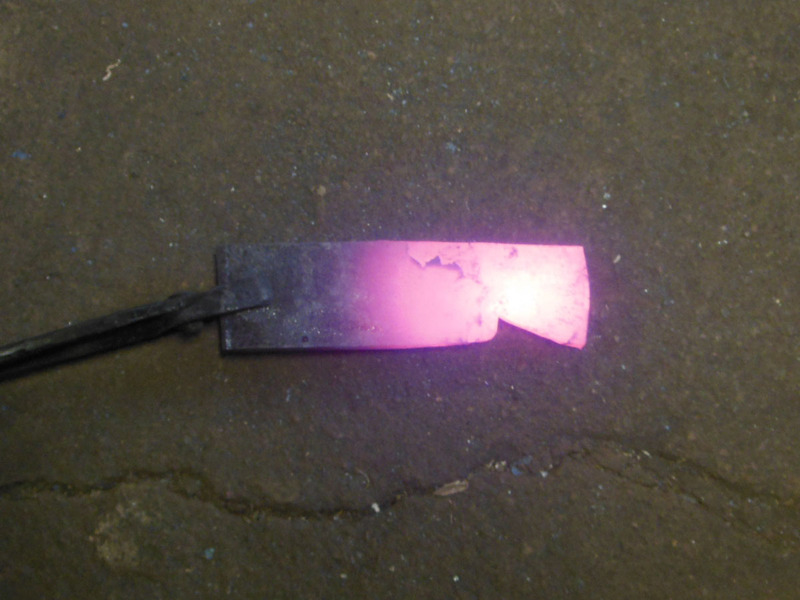 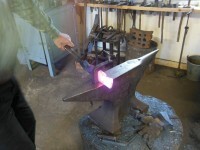 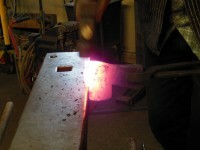 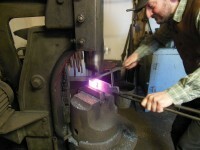 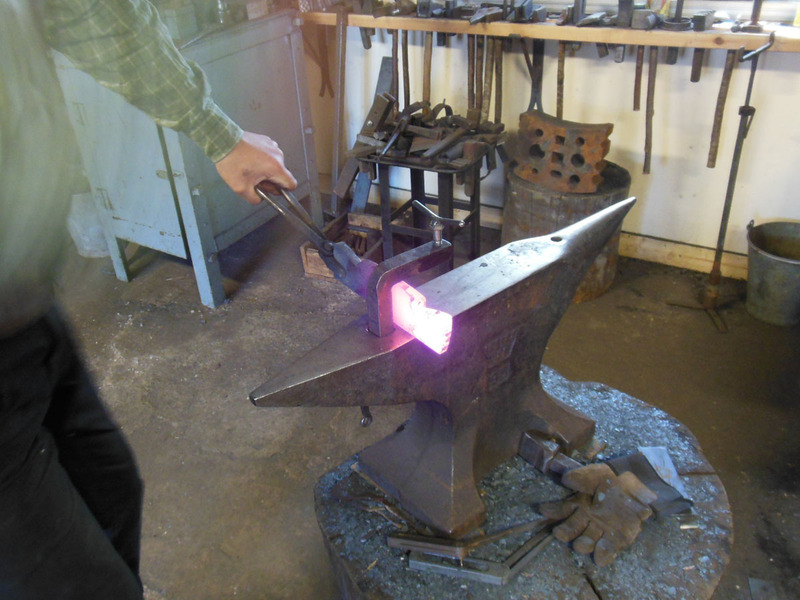 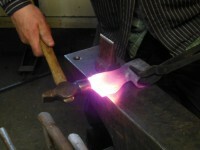 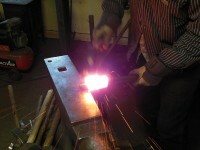 Heating the blade of the axe for welding. 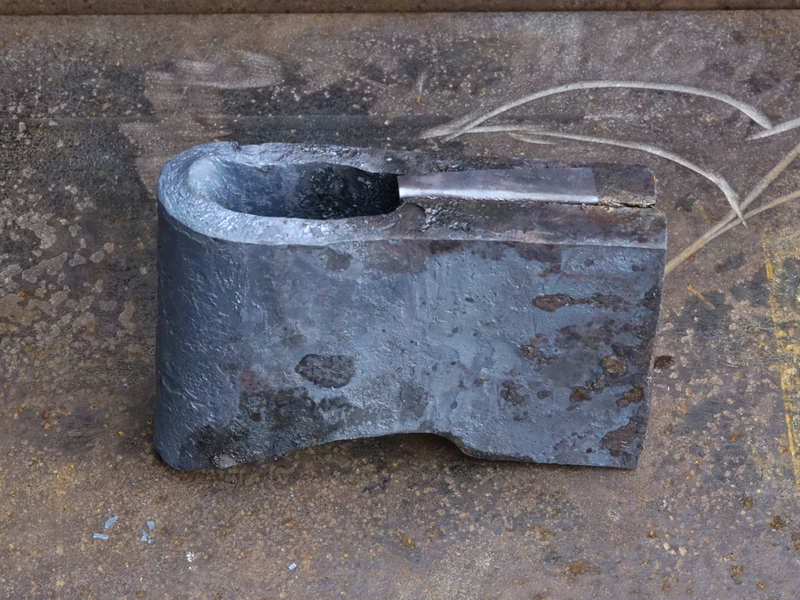 This is the heavy part of the axe and will be welded first, followed by welding the socket. 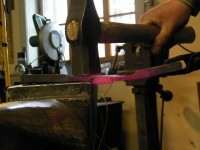 Applying flux to the blade weld. 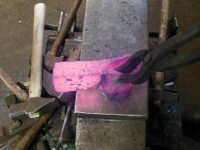 Results of the first welding pass on the blade. 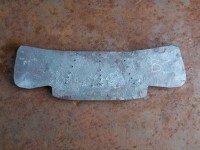 Underside of the welded blade. 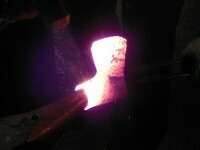 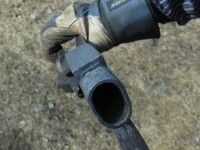 Welding the socket over the horn. 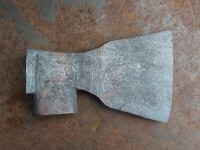 Appearance of the axe body after the first socket welding pass. 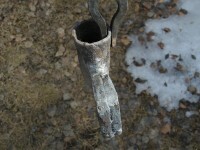 Edge of the welded socket. 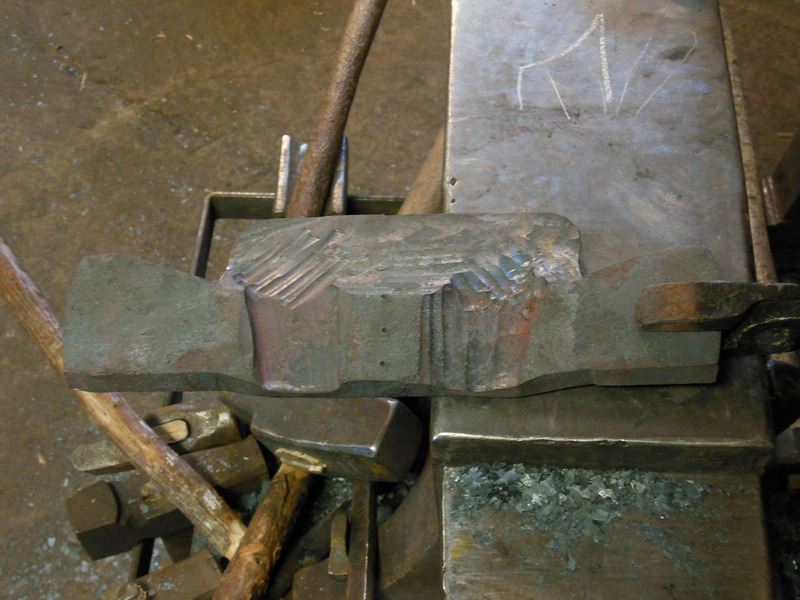 It needs a little more welding work. 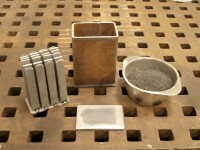 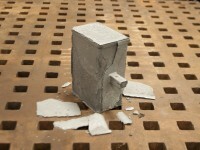 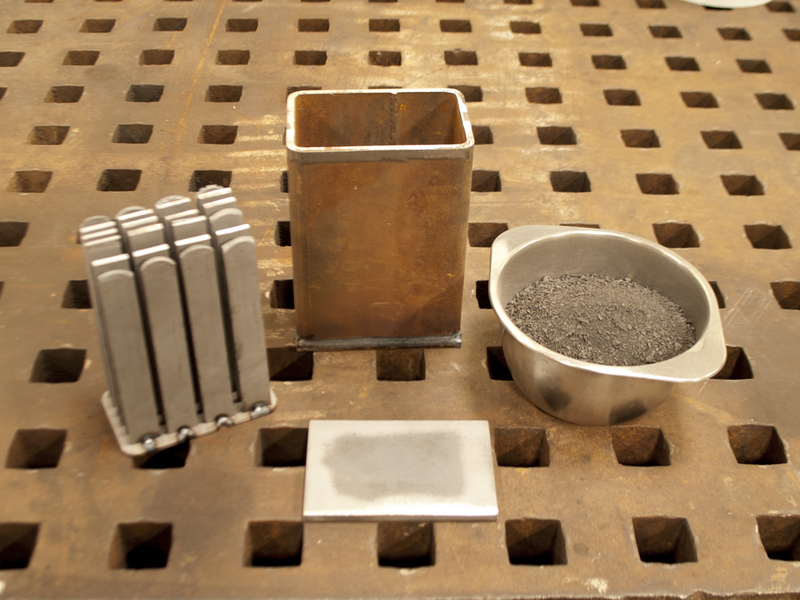 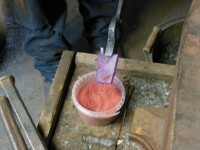 Borax flux is applied to get a complete weld on the edge of the socket. The socket weld is made complete. 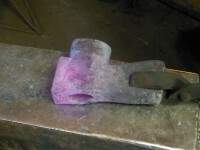 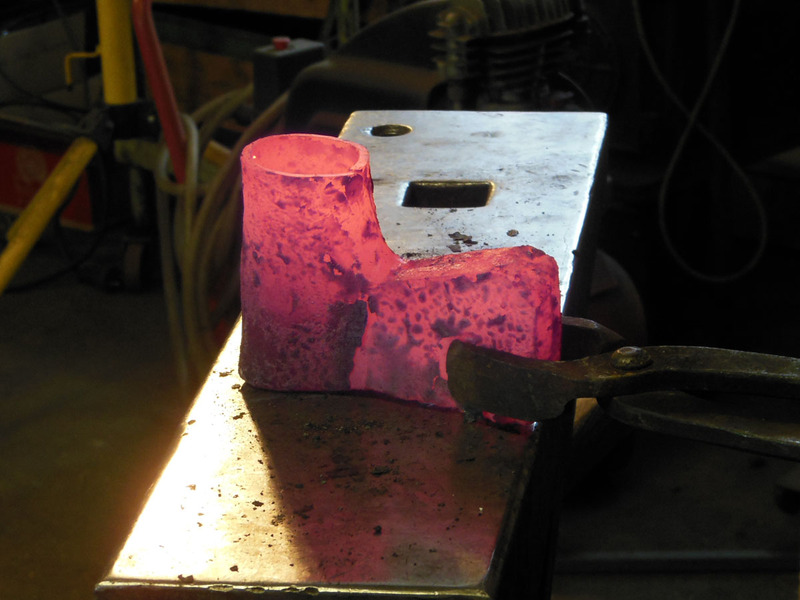 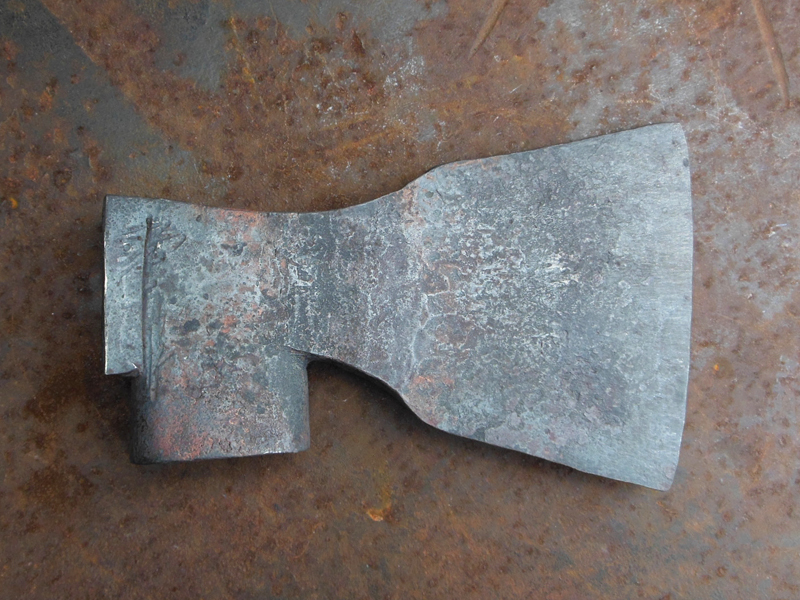 Now that the forge-welding of the axe body is done the shape of the axe will be refined. 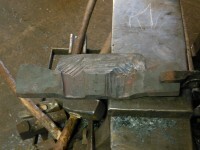 This will take many steps but result in a very clean form. 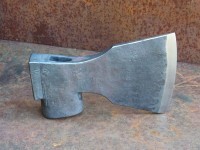 Top view of the welded axe body. 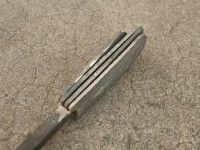 The socket weld and socket-blade transition. Butcher tools to refine the socket-to-blade transition zone. 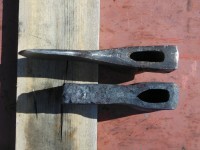 They will produce a sharp inside corner. 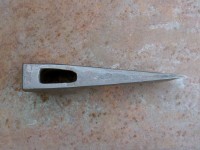 A mandrel is used to clean up the eye. 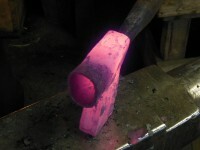 This will proceed over numerous heats. Shaping the top of the eye. 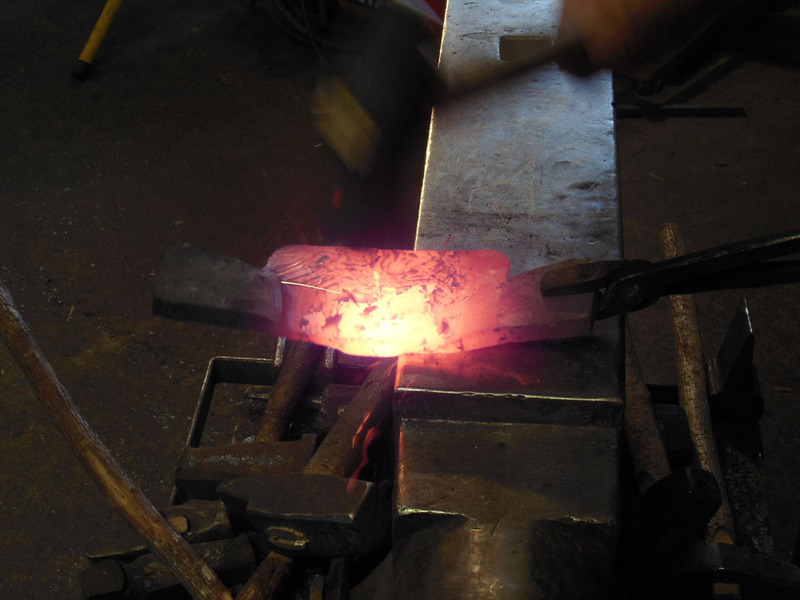 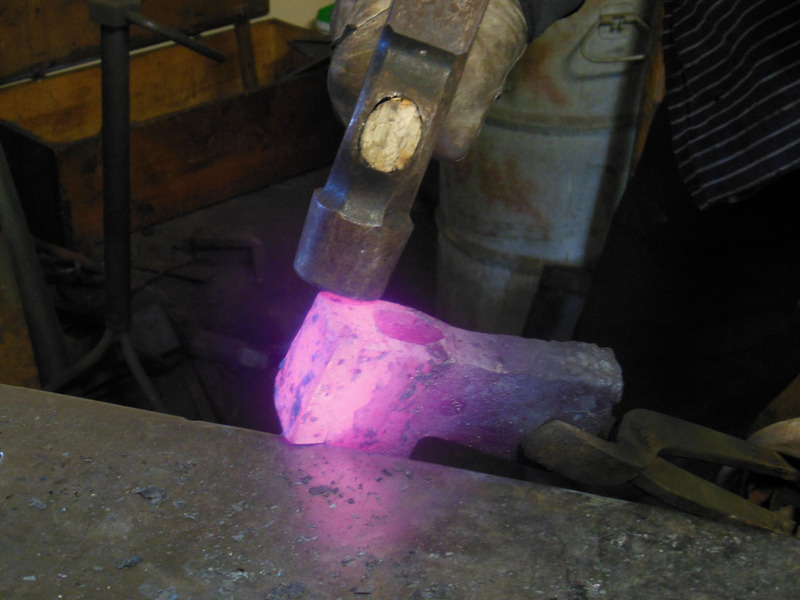 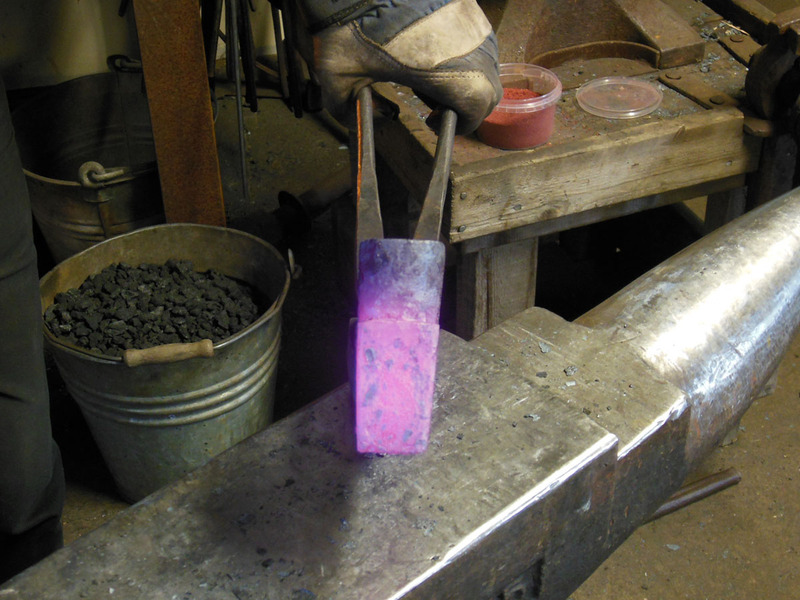 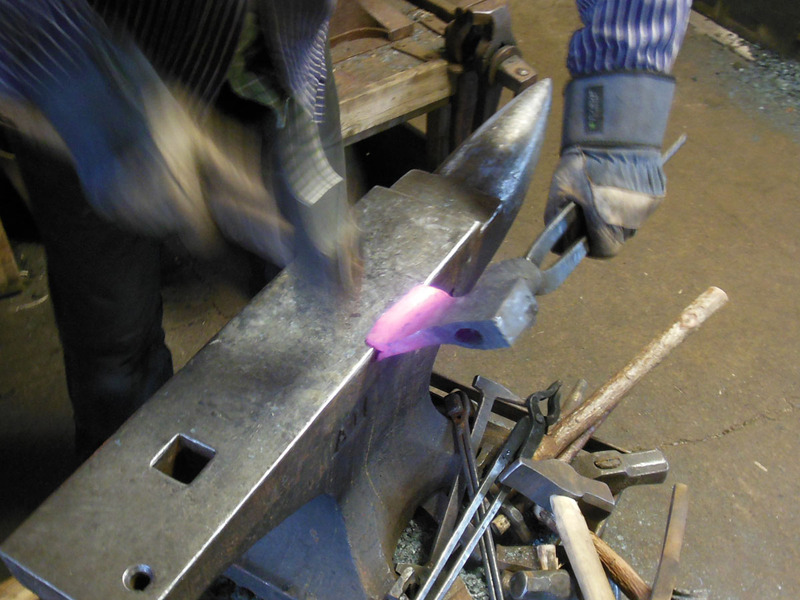 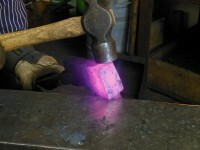 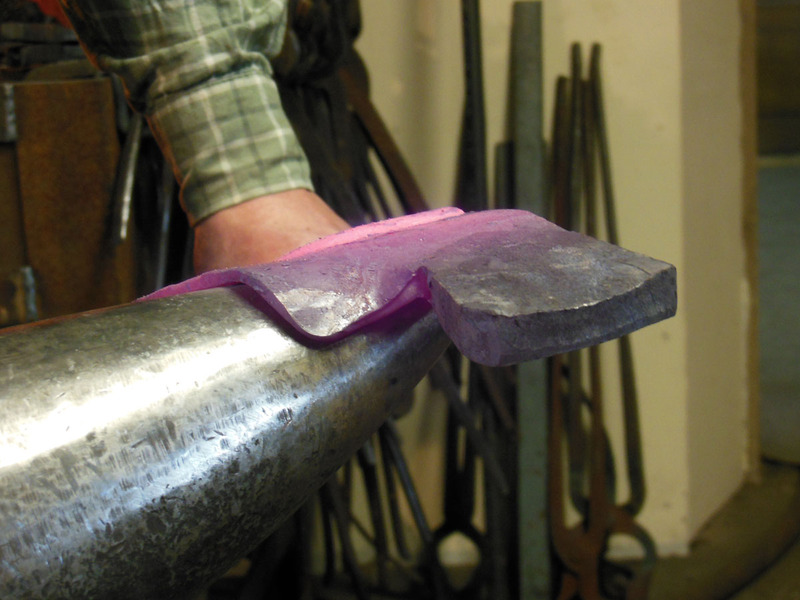 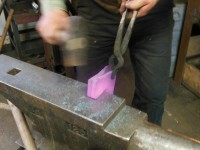 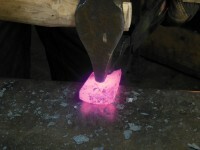 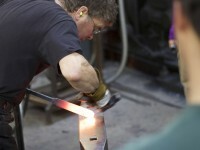 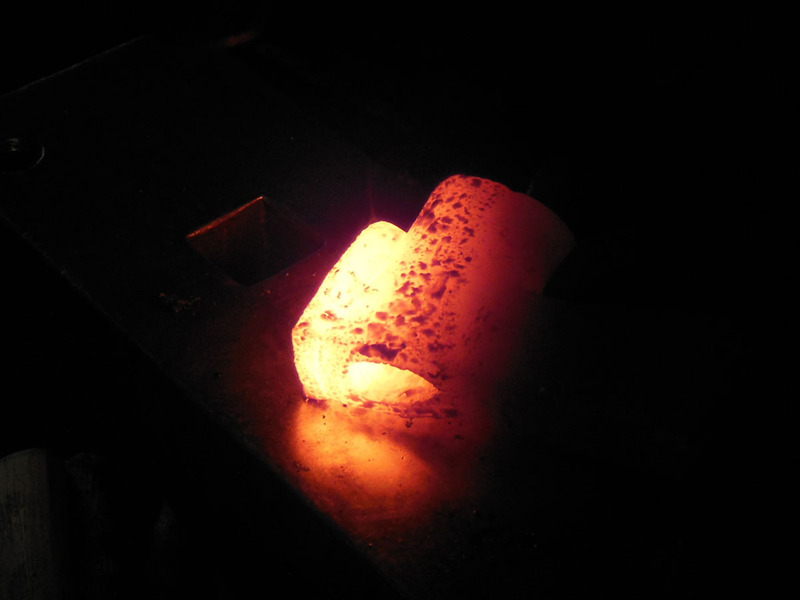 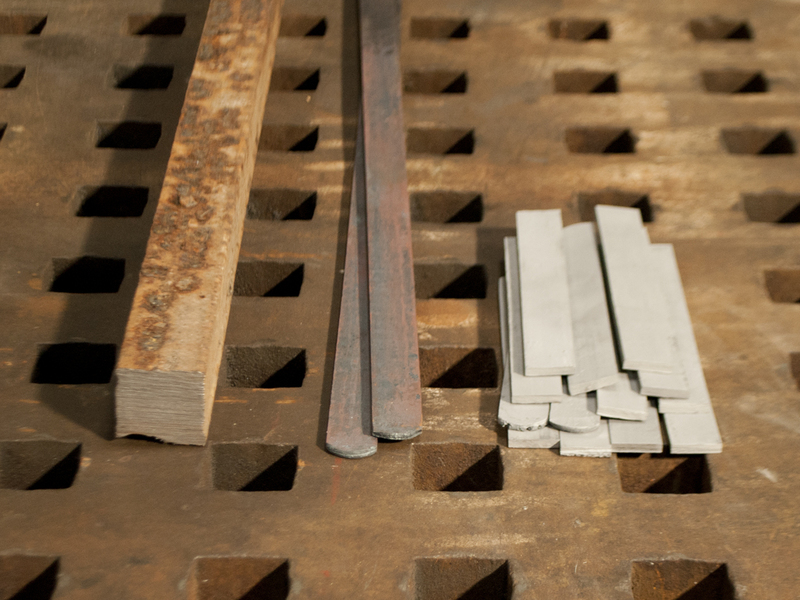 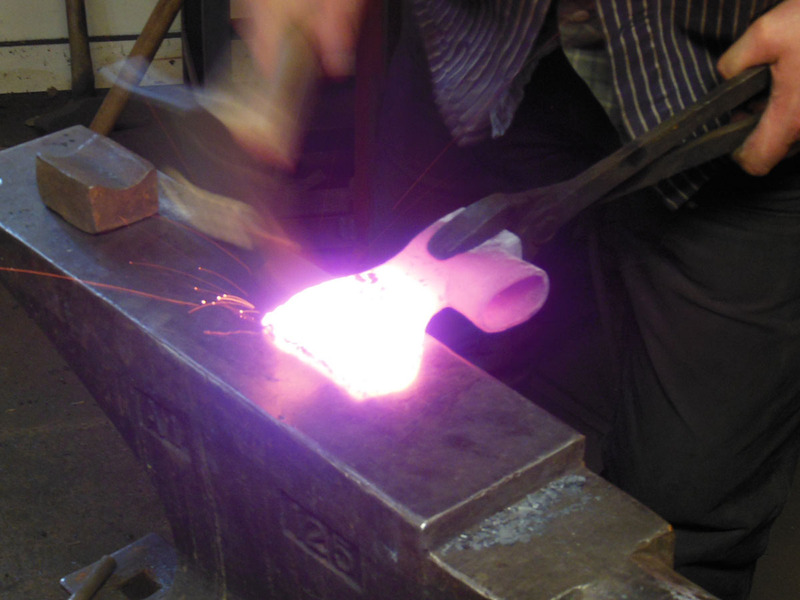 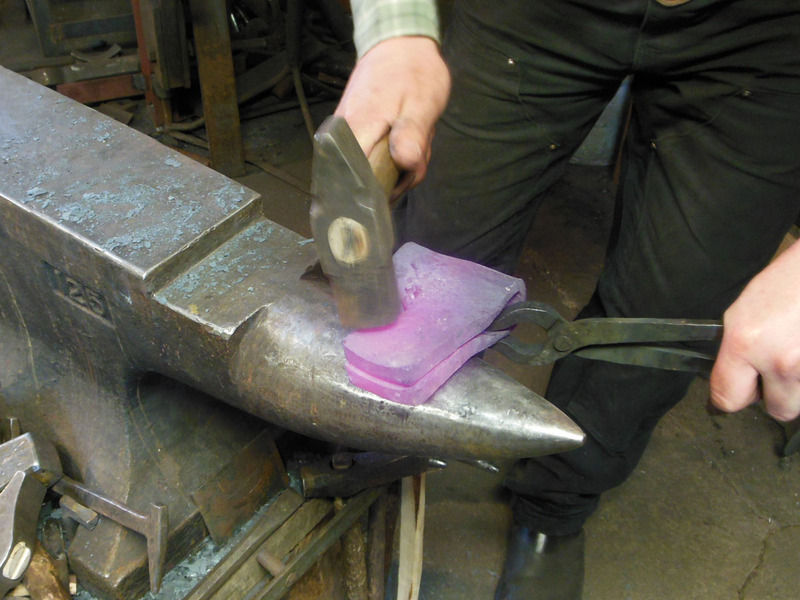 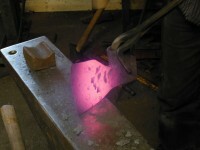 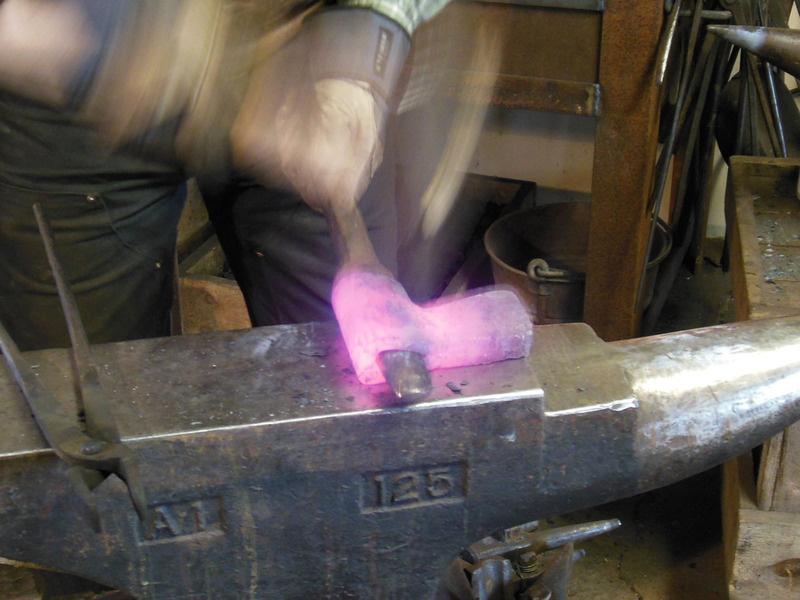 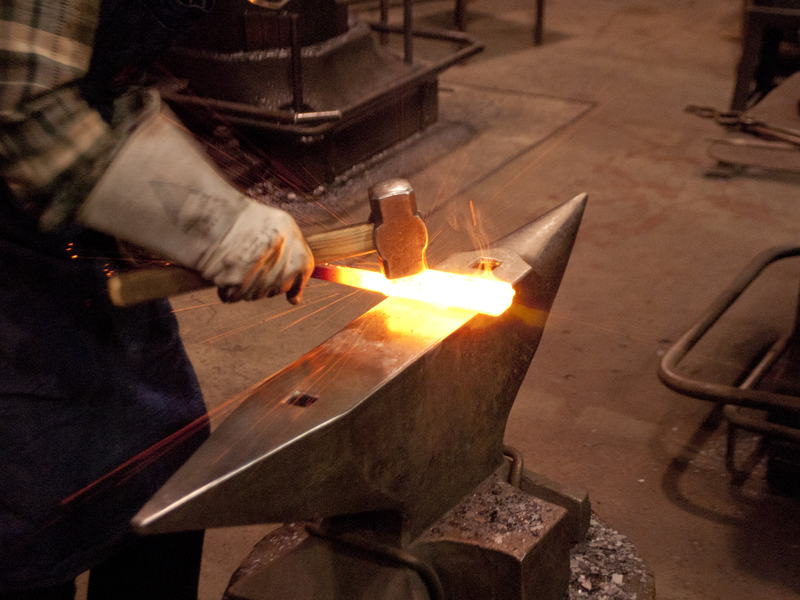 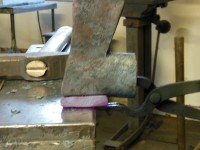 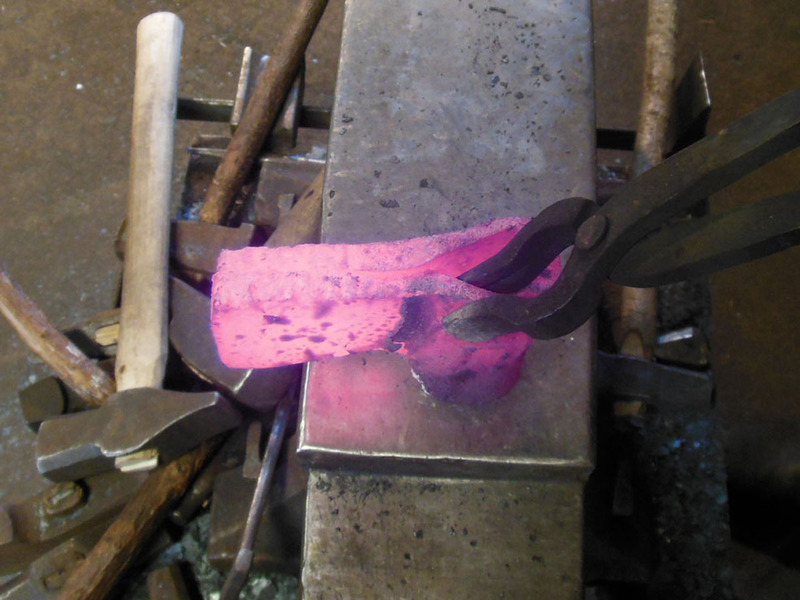 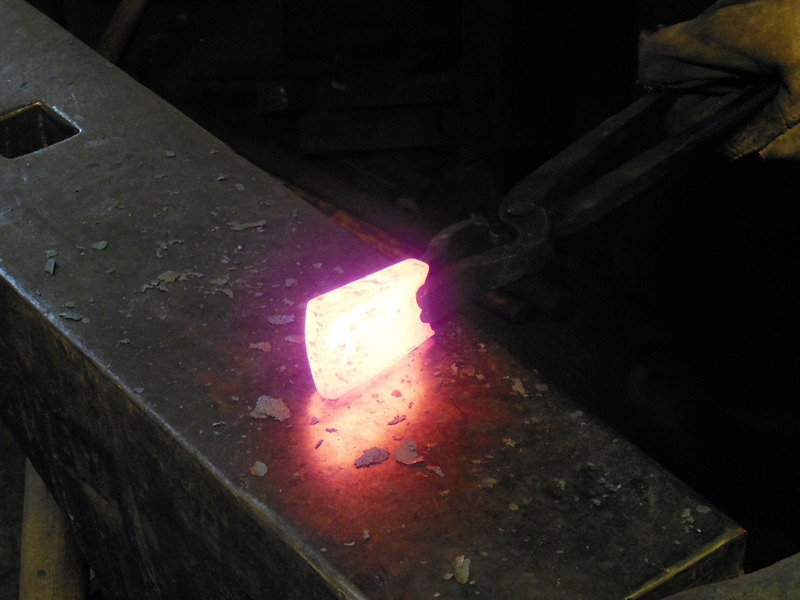 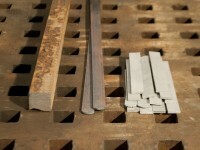 Using the anvil to refine the lower edge of the blade as the top edge is forged. Using a mandrel on the top opening of the eye. 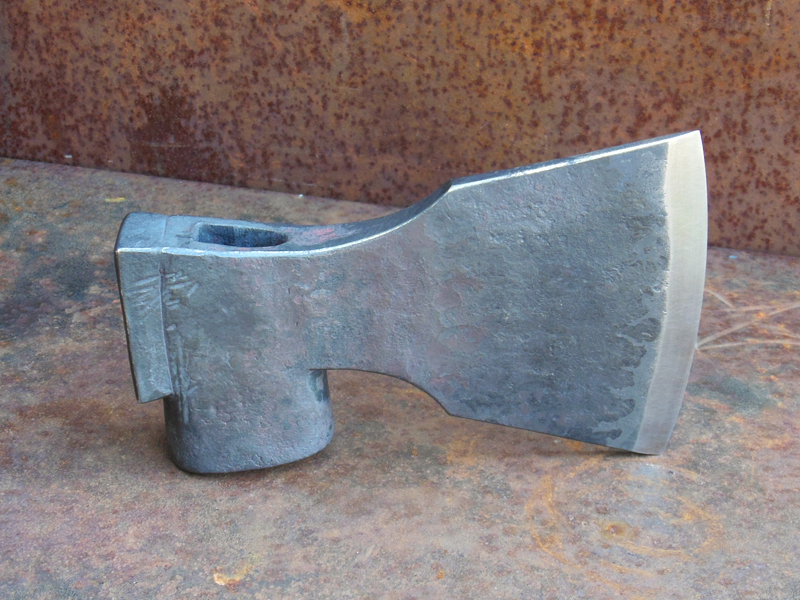 The refined eye of the axe. 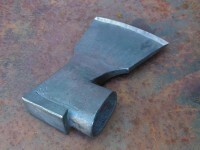 Another view of the axe eye and socket. 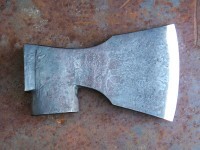 A comparison of the axe-in-progress with the old axe. 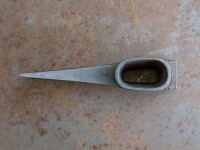 Top view of same. 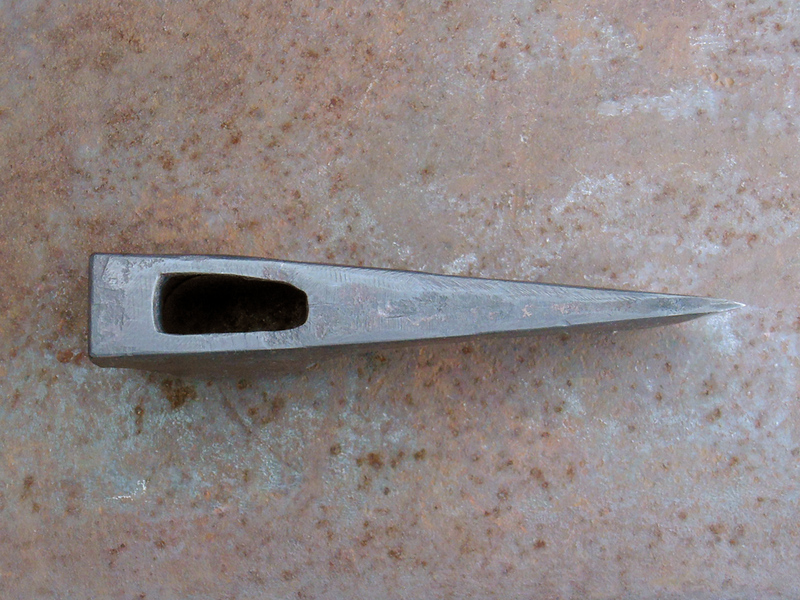 The top opening of the eye is clearly a bit different. 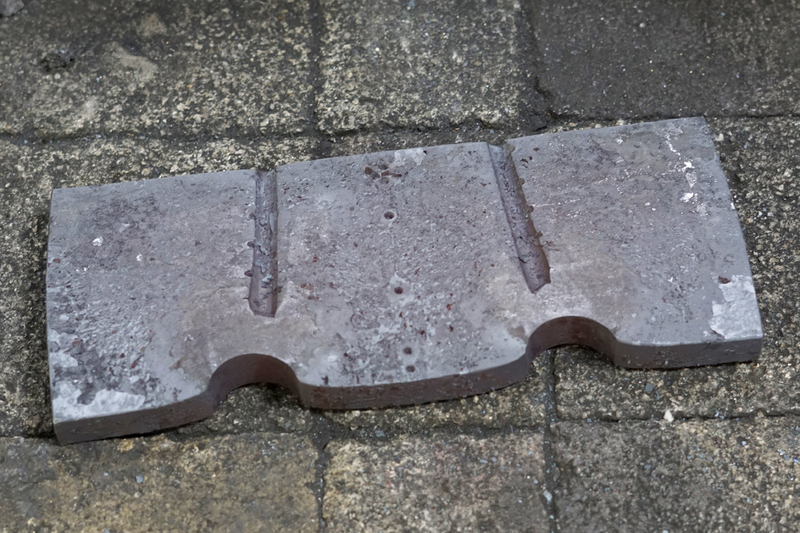 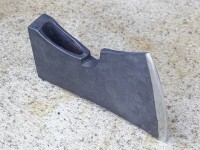 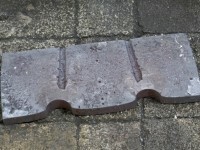 A high-carbon steel strike plate is shaped for welding to the back of the axe-eye. 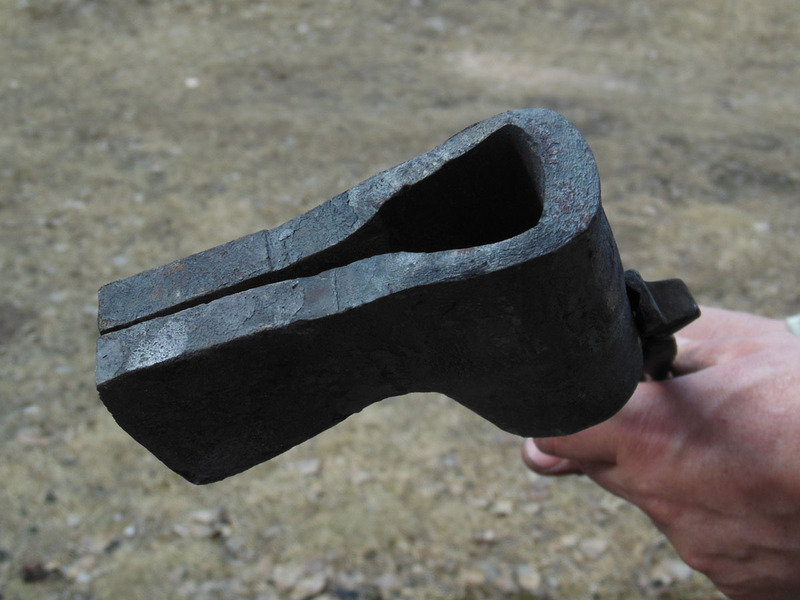 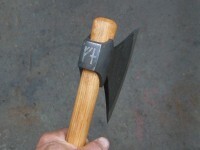 It is a hammer-like feature which strengthens the poll of the axe. 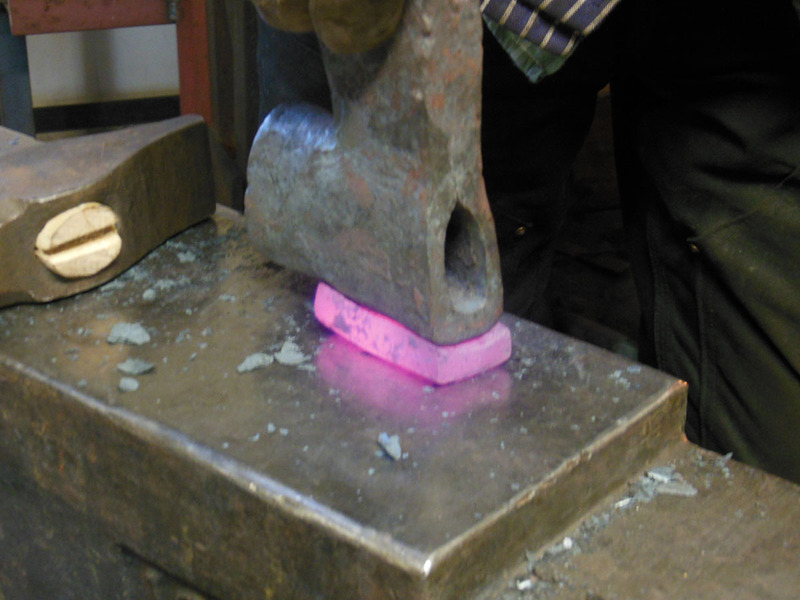 Shaping the strike plate. The material is about the same as 1070. Form fitting the strike plate. The position and fit of the strike plate. 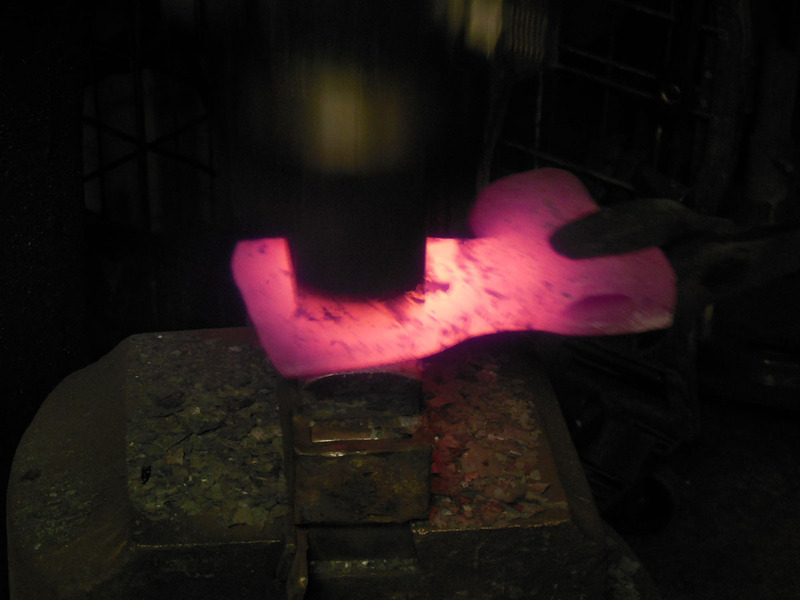 Fluxing the strike plate. The flux is borax with red iron oxide. To weld the strike plate onto the poll of the axe it is simply gripped in place and put into the fire. 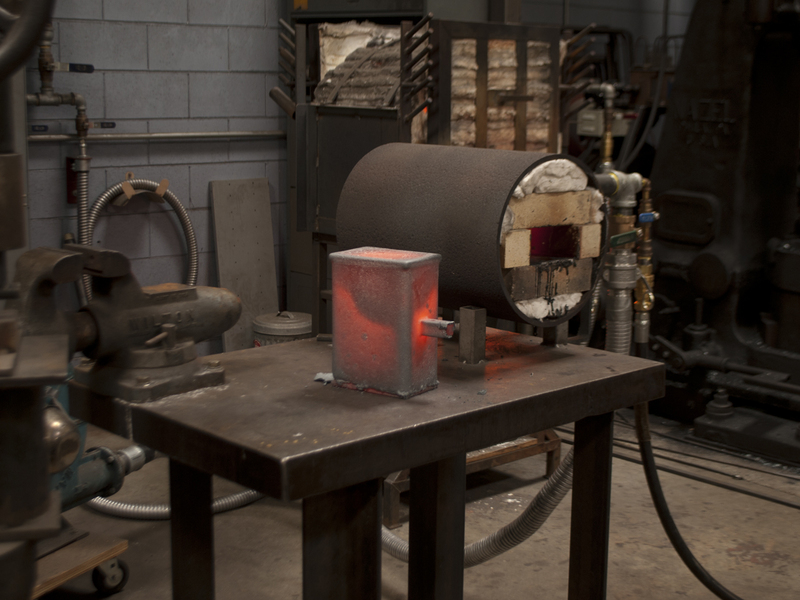 Everything is heated together (including the ends of the tong-jaws). Axe eye in the forge. 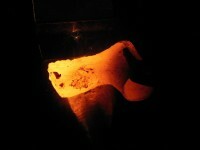 The tong jaws are just visible in silhouette on the left side of the eye opening. 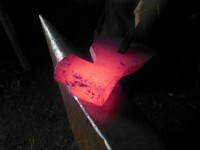 The upper edge of the plate is tack-welded to the poll of the axe. 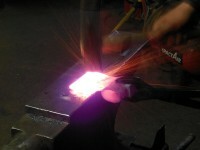 Another welding heat is taken to bond the strike plate to the poll. 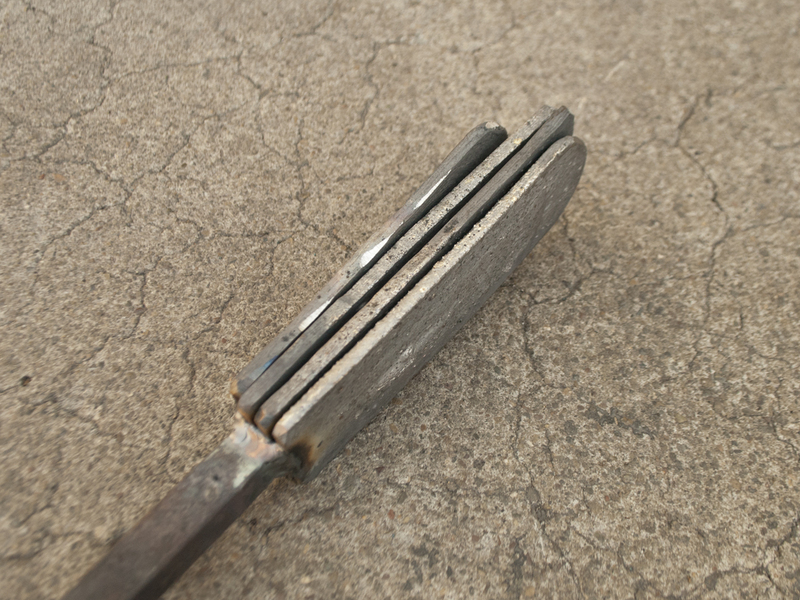 The weld seams are closed and leveled. 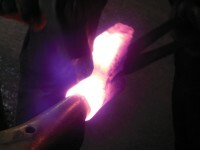 The mandrel is used to maintain the shape of the eye as the welding and shaping continue. 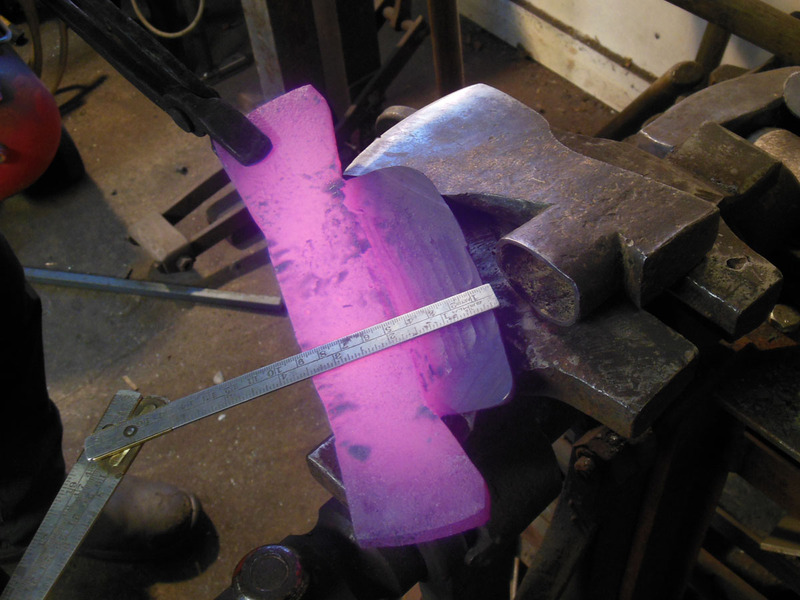 Refining the shape of the strike plate – top and bottom edges. 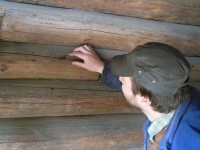 Detailing the top and bottom edges. 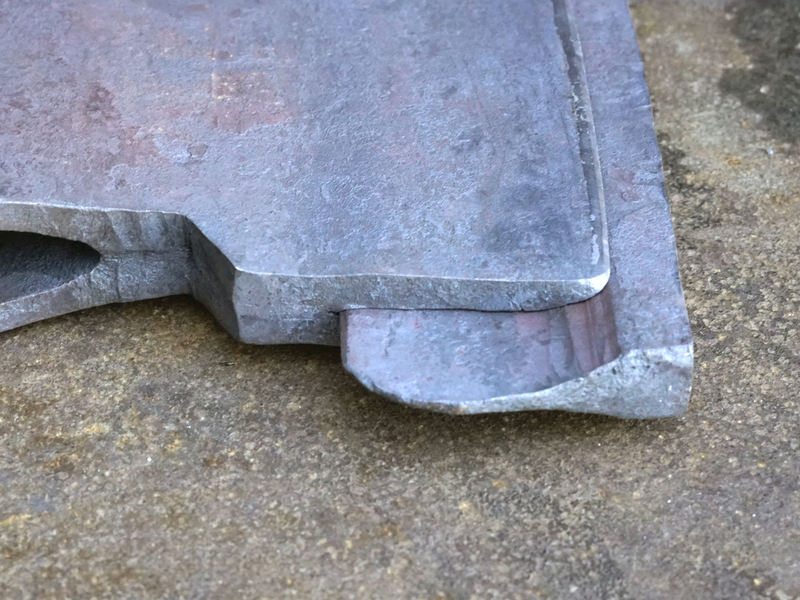 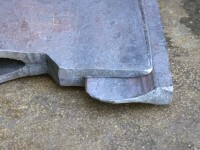 The nearly-blended seams of the strike plate. 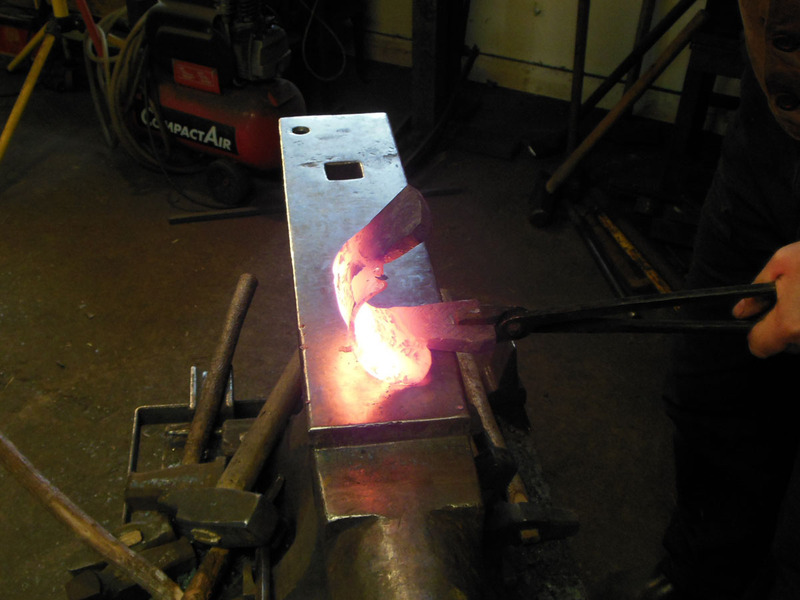 Refining the eye and socket. 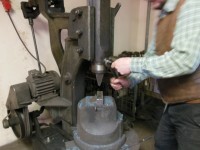 Another technique for adjusting the form. A clean, even edge on the socket with no trace of a weld seam. 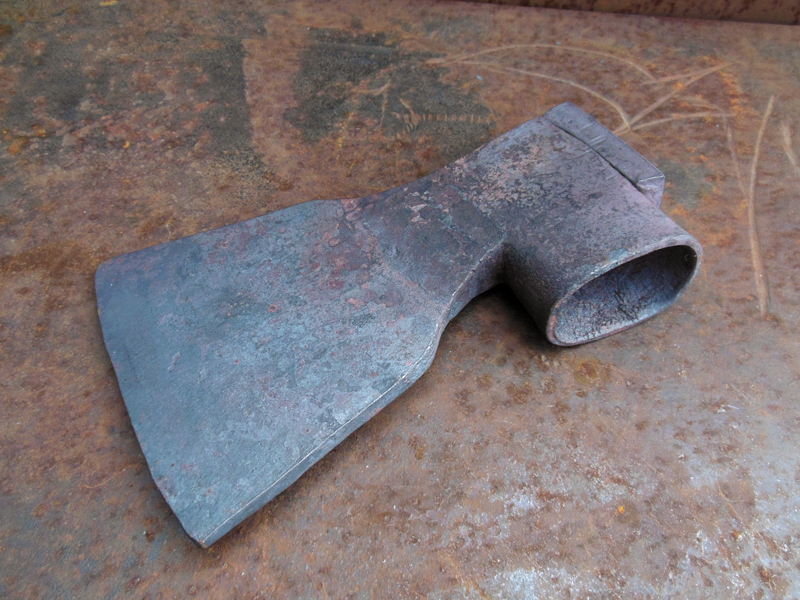 The finished back of the axe. 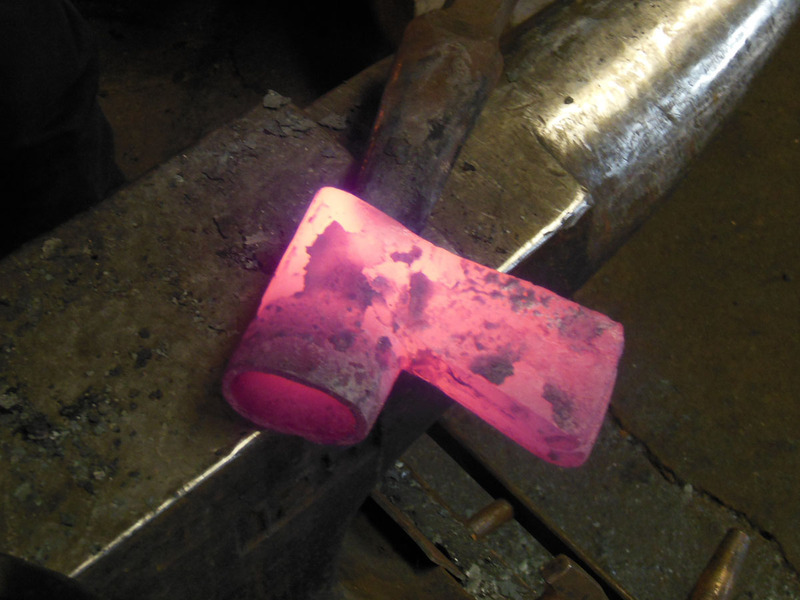 On to the blade! 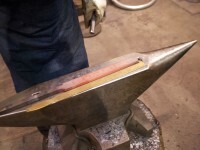 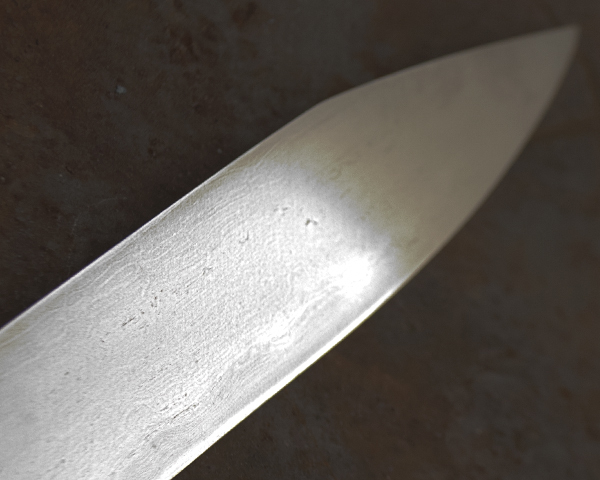 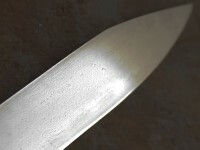 After opening the edge of the blade with a chisel the lips of the cleft are scarfed for welding in a bit of Fagersta 110 or UHB20 steel (similar to O1). A bit is prepared for the axe with a wedge-shaped cross section. Scarfing the edge of the bit. 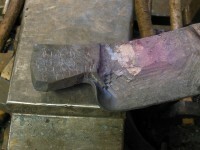 The bit has been inserted into the axe body. 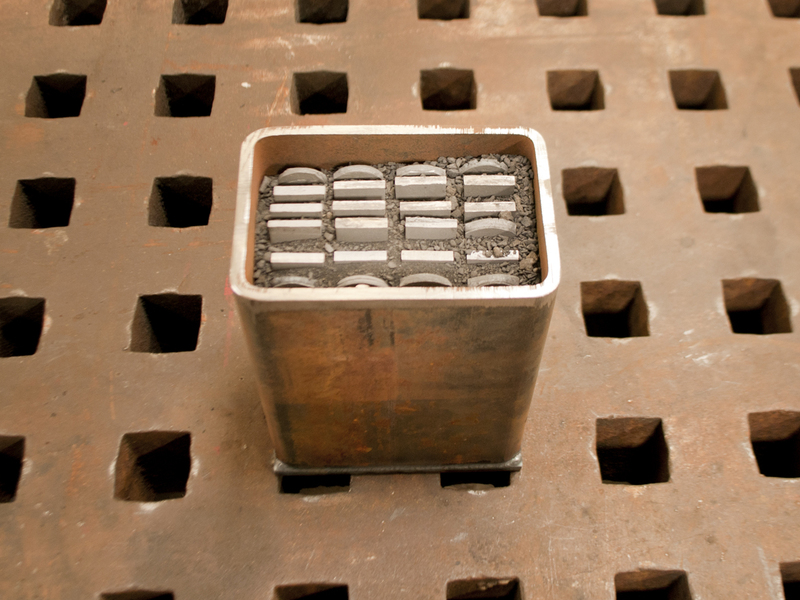 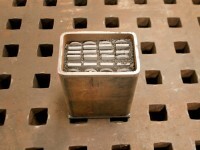 The first step of welding the bit is to “pack” the joint tightly together at a welding heat and even up the edges. 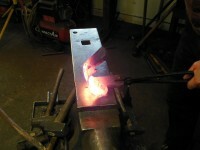 The packed joint ready to weld. 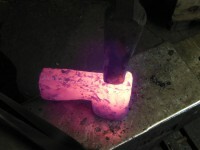 Drawing the welded bit on the mechanical hammer. Finishing the profile of the axe. 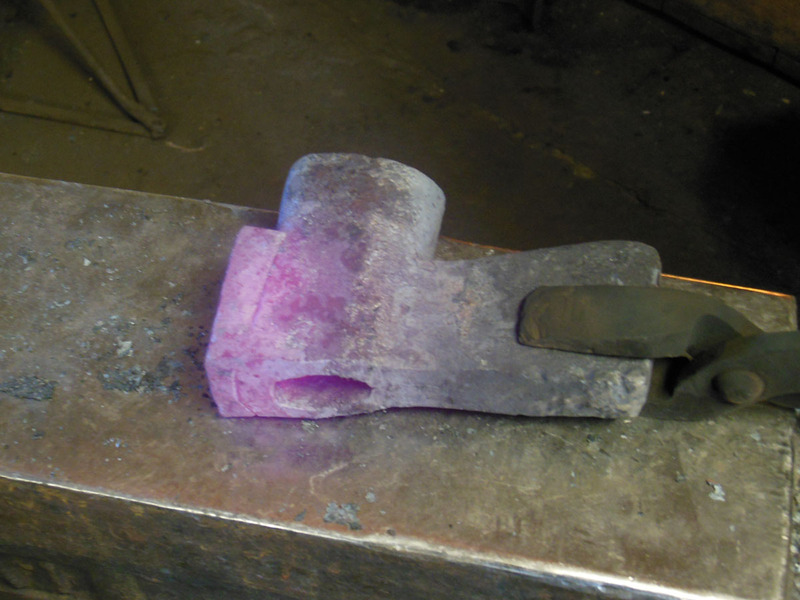 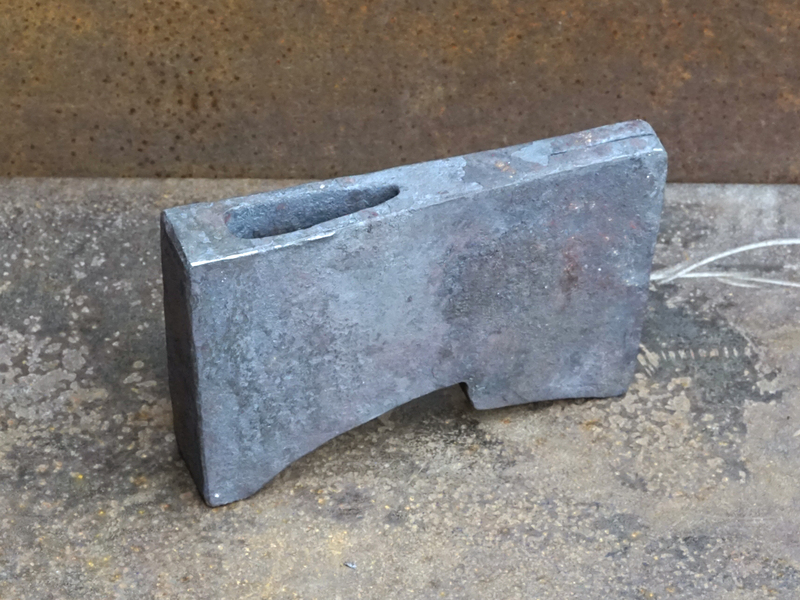 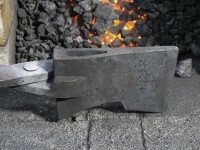 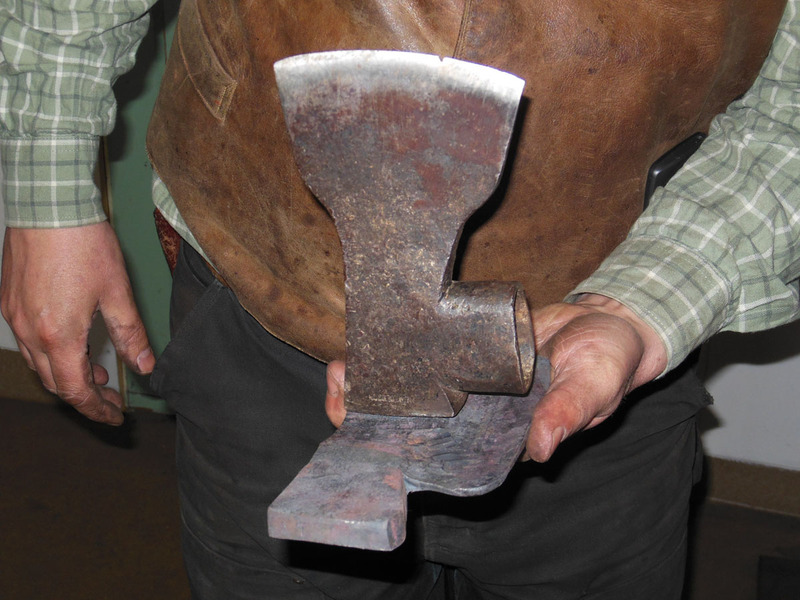 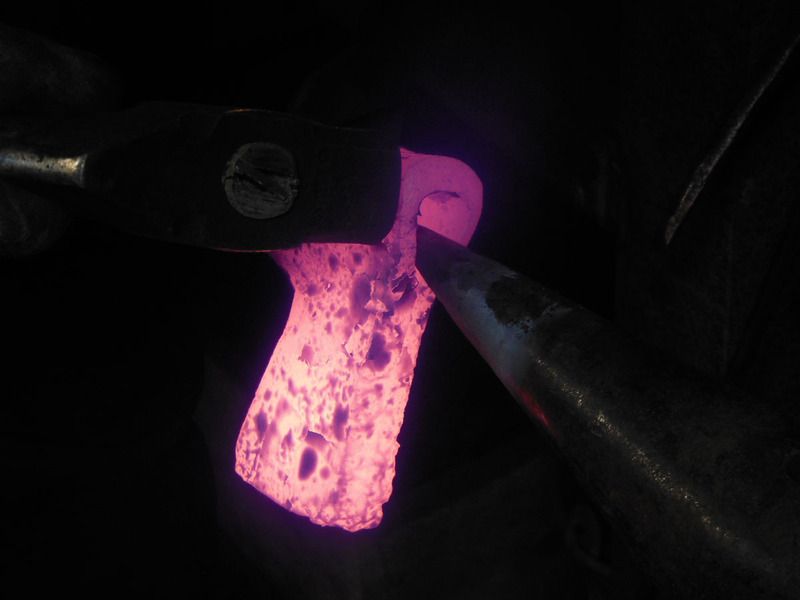 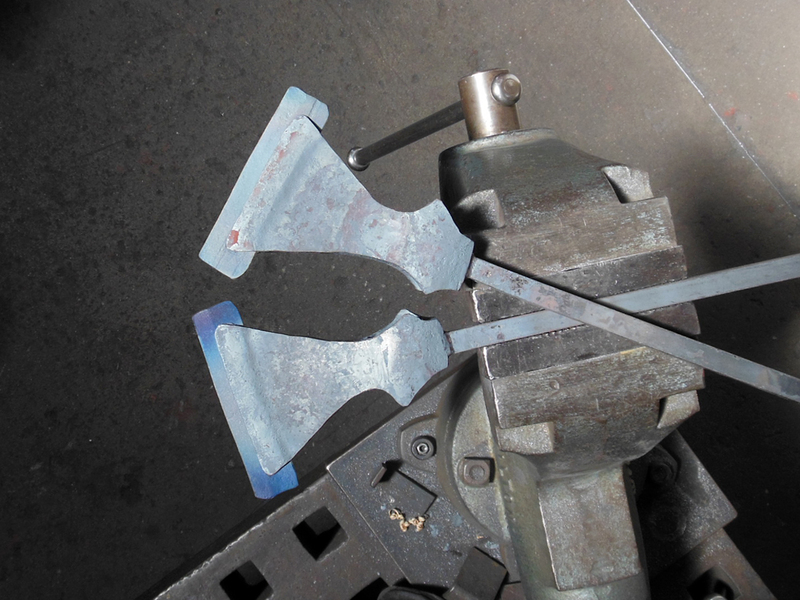 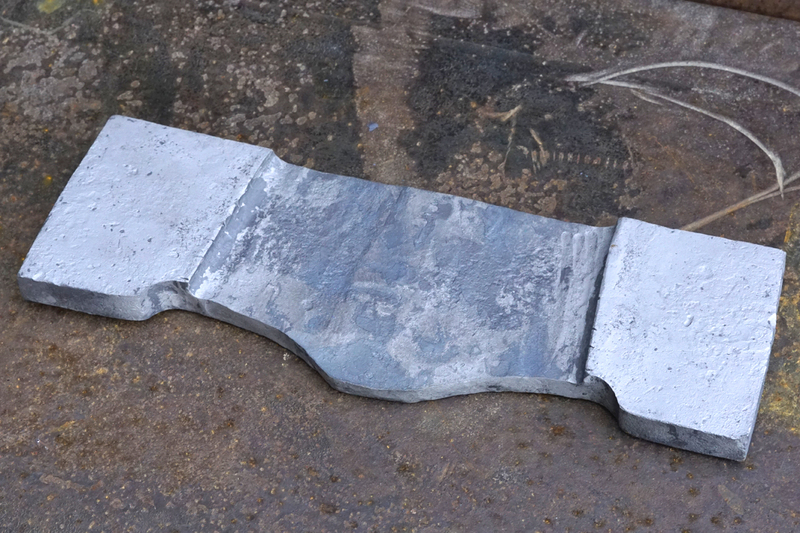 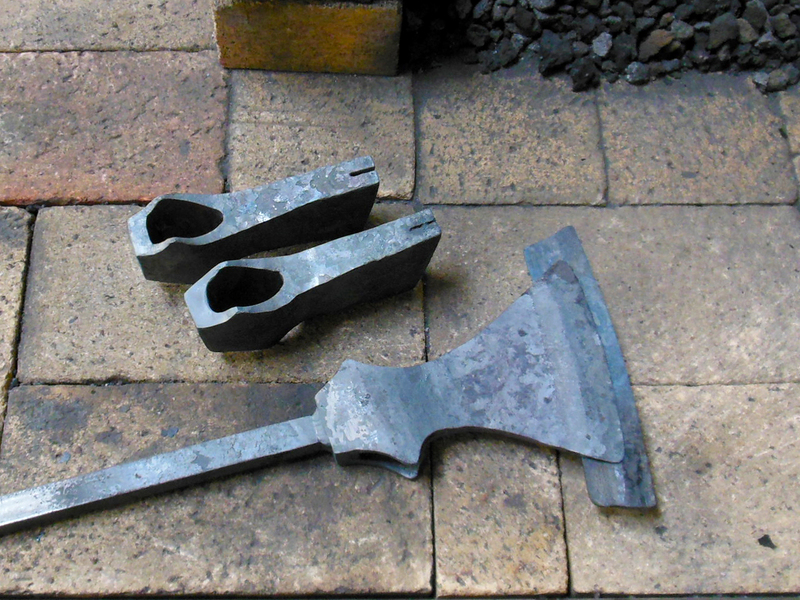 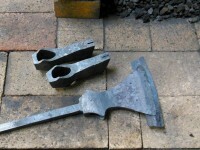 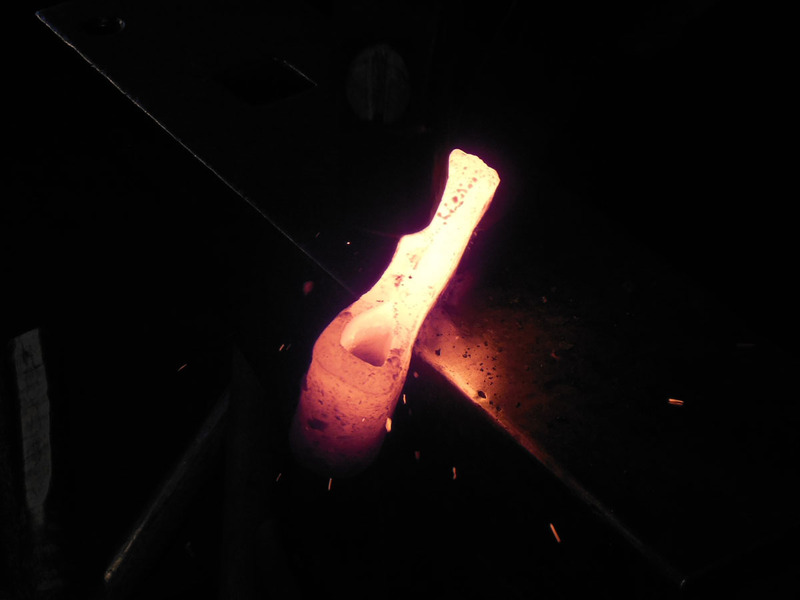 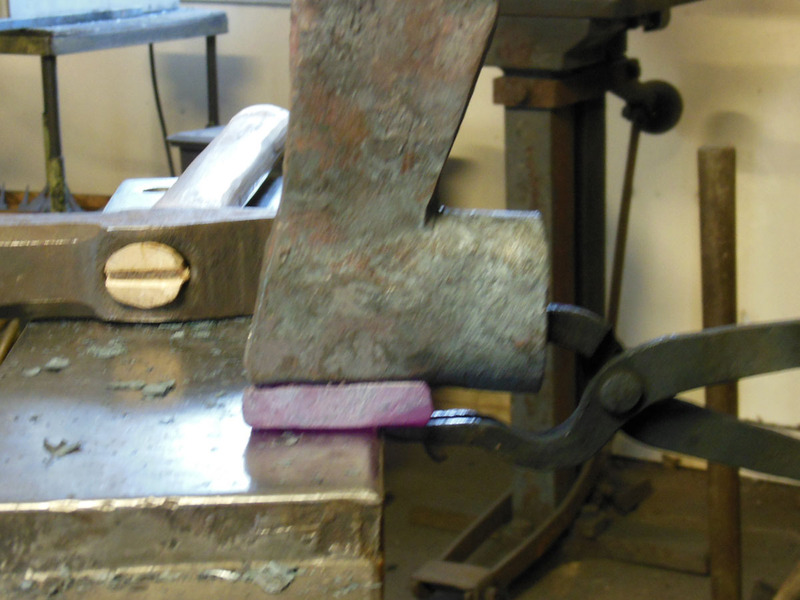 The finish-forged axe – ready for grinding and heat treating. 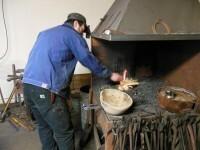 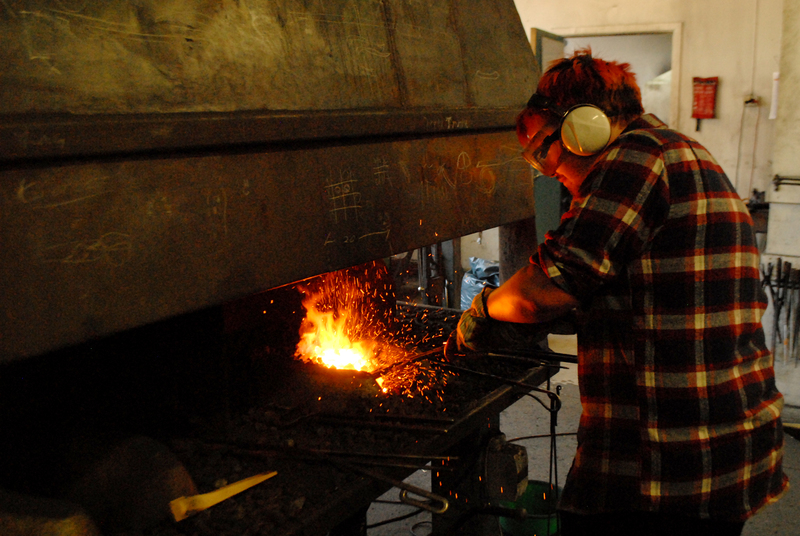 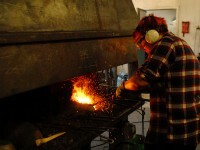 Mattias will heat treat the axe in his “old smithy”. 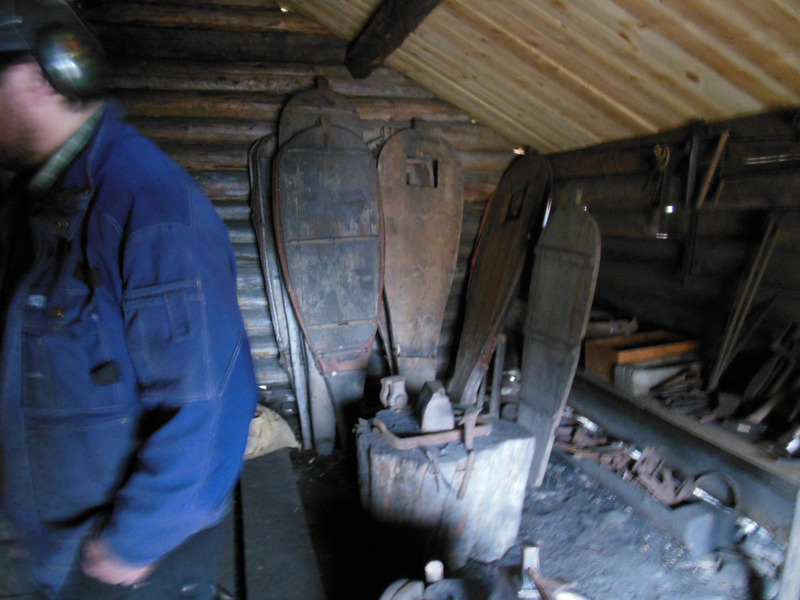 When you step through the tiny door into the dark interior and see yourself surrounded by ancient tools you feel you have gone back in time. View from inside the old smithy. 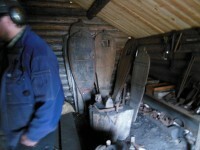 Mattias’ bellows collection with a very old anvil on the stump in front of them. 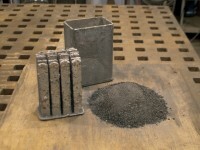 Mattias uses a mix of coal and charcoal to heat treat his tools. The darkness inside the old smithy is good for judging the temperature of the work. 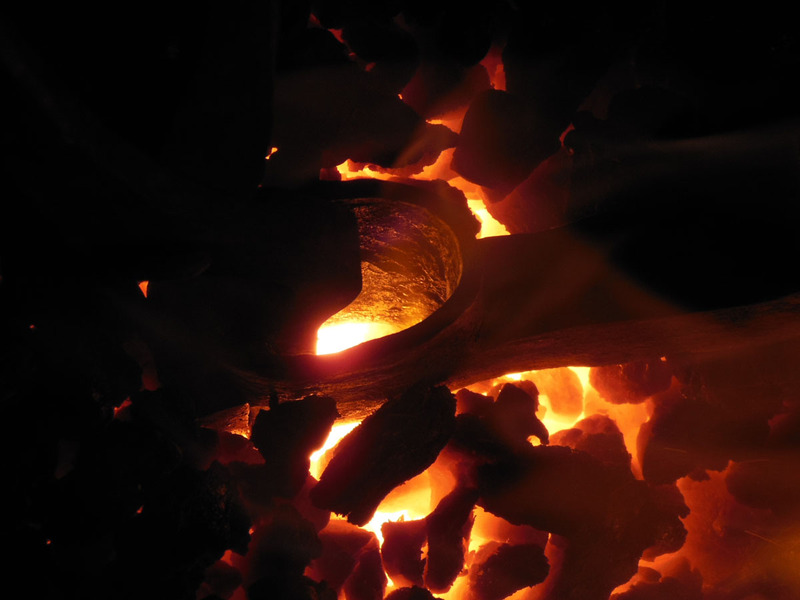 The only sounds inside the smithy right now come from the fire and from the old bellows. 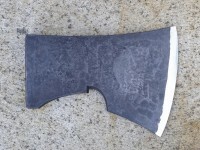 The back of the axe is normalized. 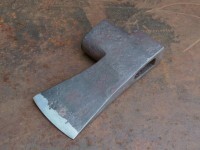 After normalization the axe was quenched in oil, then tempered over the fire. 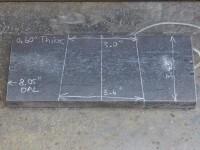 The edge was then finish-ground. 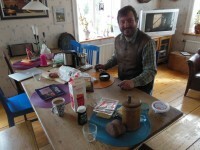 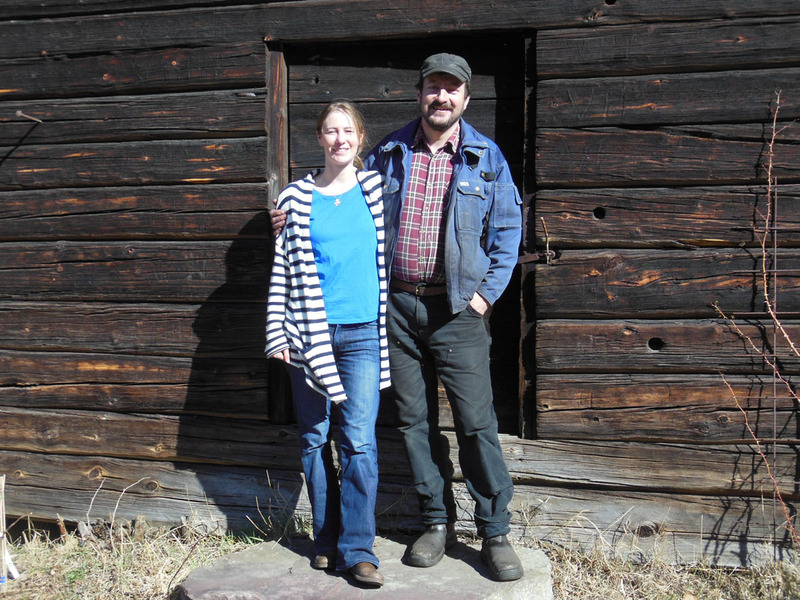 Mattias and Maelle – my hosts. 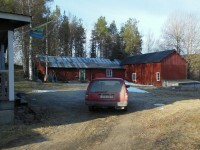 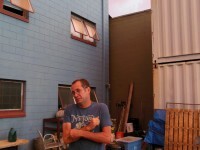 My last view of Mattias’ amazing home and smithies. 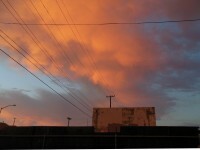 At the bus stop – ready for my next axe adventure!